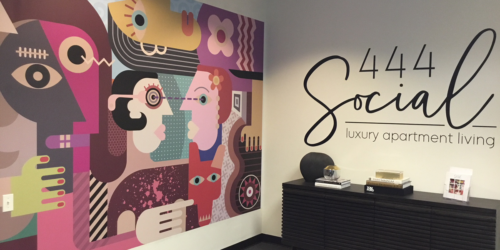 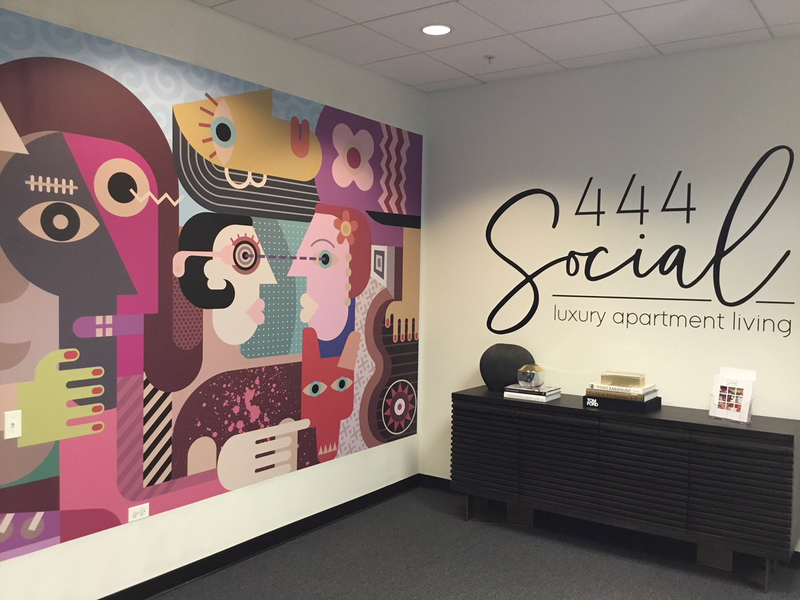 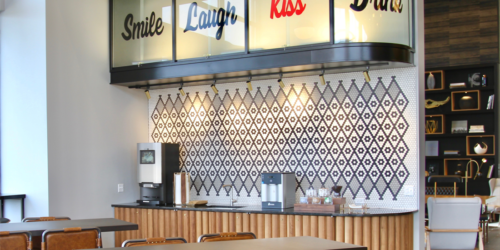 While pieces of the communal building are yet uncompleted by the General Contractor, we have begun to release onto the 444 Social website and our social media platform a few photographs of the interiors from the communal building at 444 Social. 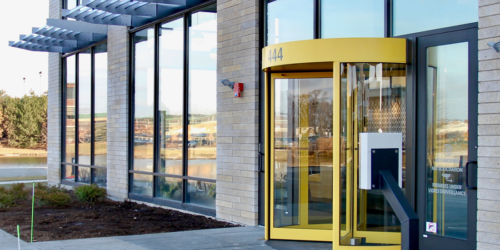 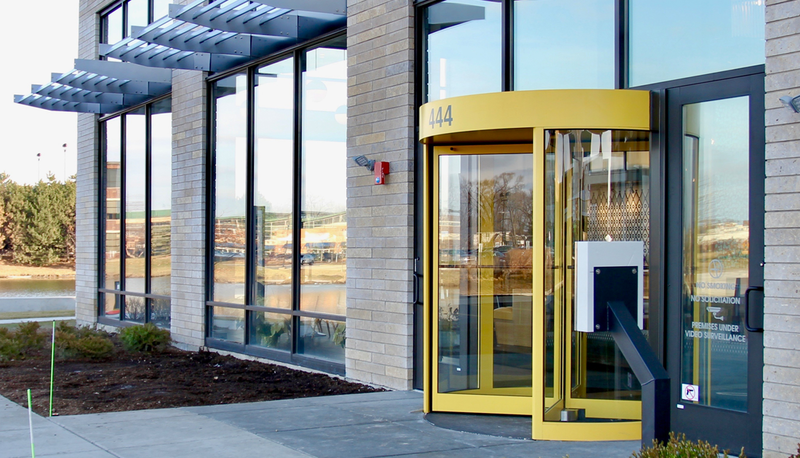 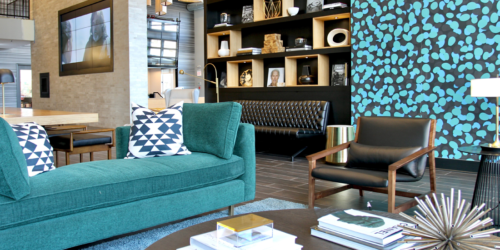 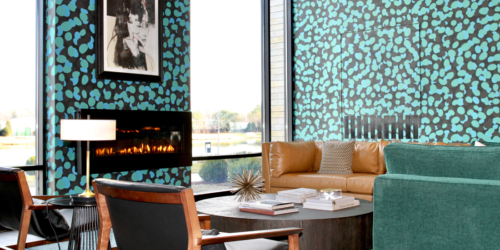 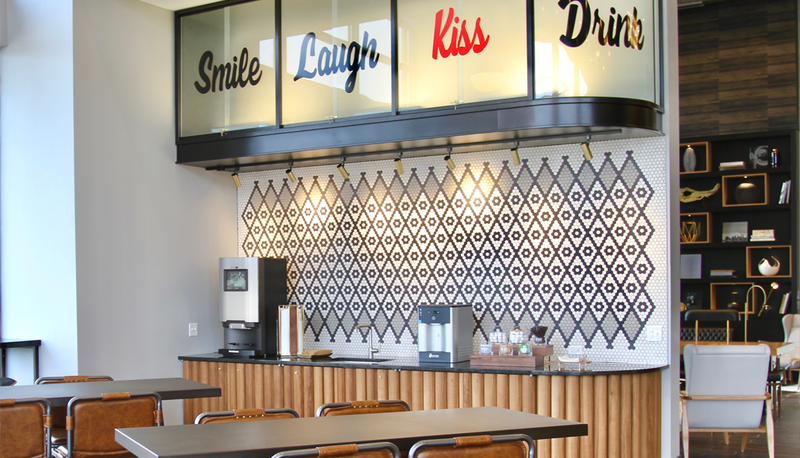 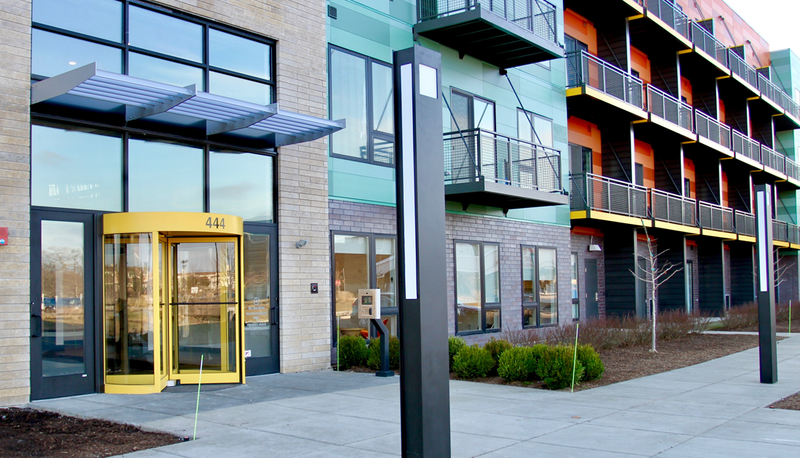 The leasing office will be open to the public this coming Monday November 26th. 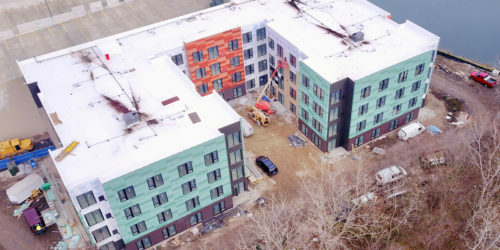 The first residents are expected to begin moving into the east building by the end of next week. 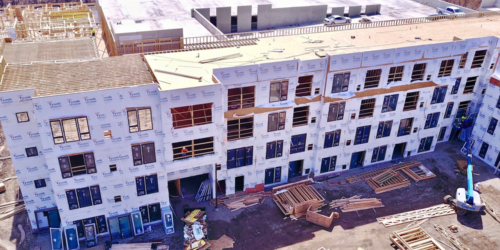 More residents are expect to move in the first week in December. 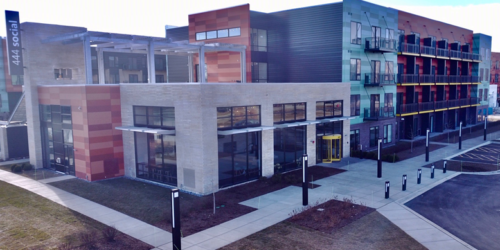 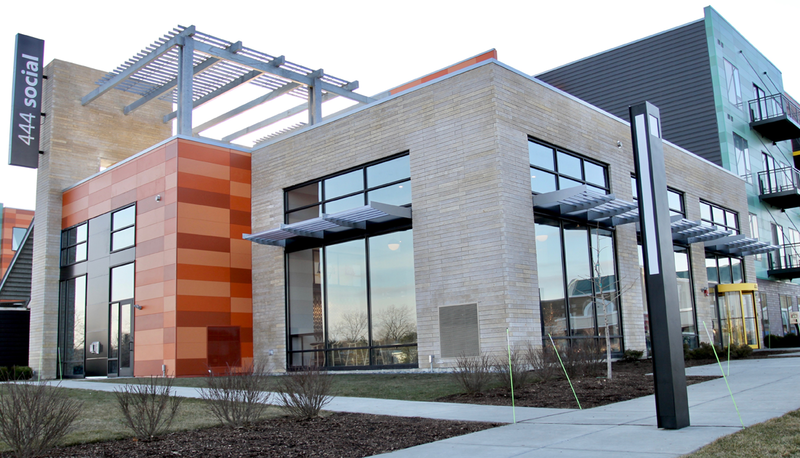 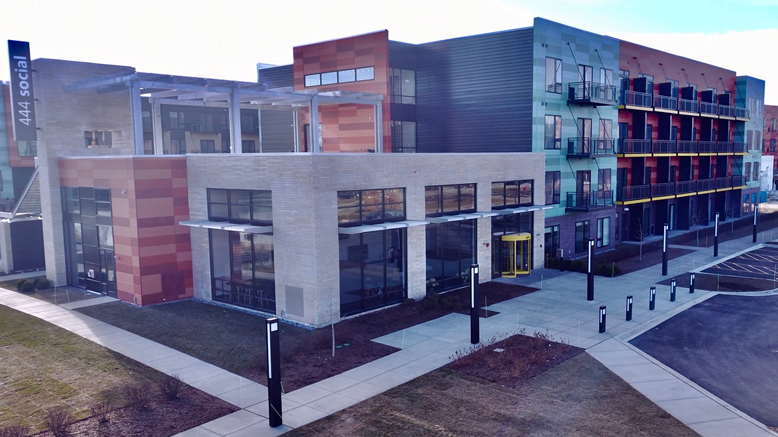 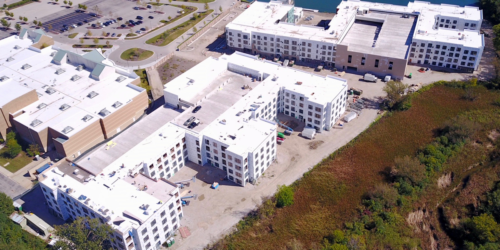 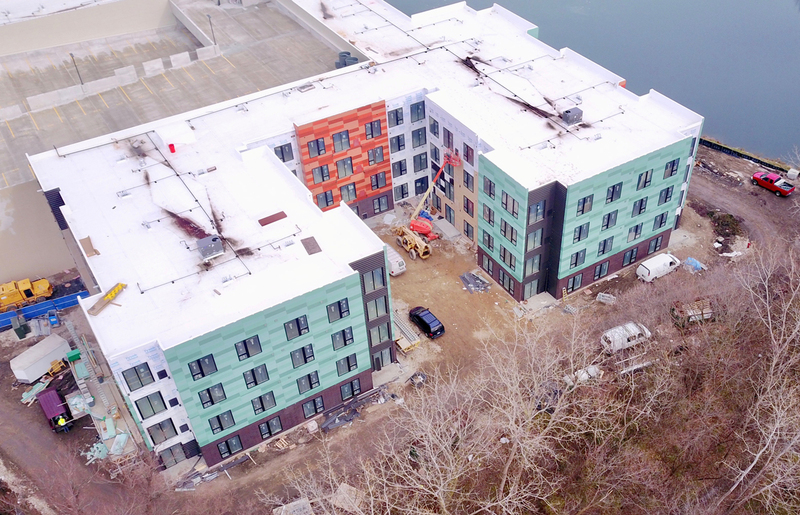 By next week, the contractor is expected to deliver 20 units ready for occupancy. 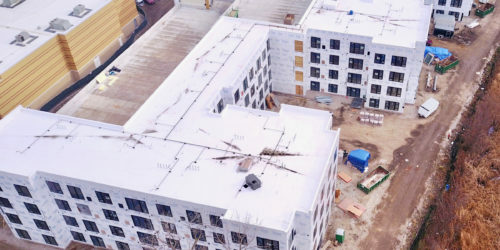 Over the next six months, the contractor is expected to deliver the remaining units in the east building. 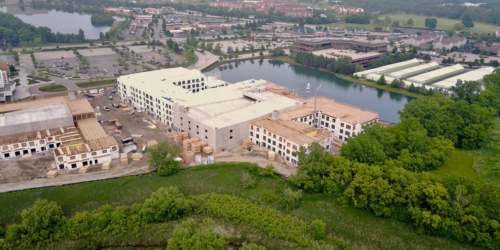 While most of the exterior surface of the east building is complete, balconies, sun shades, signage, exterior sidewalks and landscape still need to be completed. 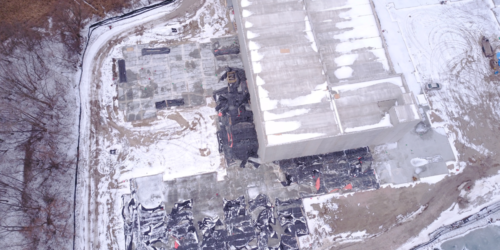 As it relates to the west building, you can see from the photos that the contractor has mostly sealed off the west building against winder weather, but none of the final exterior material has been added to the building. 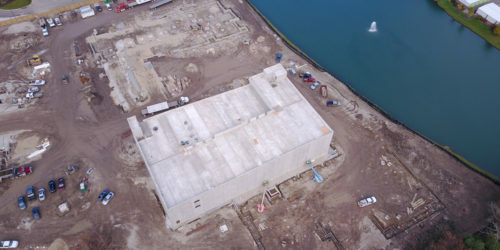 The east building in fully water tight. 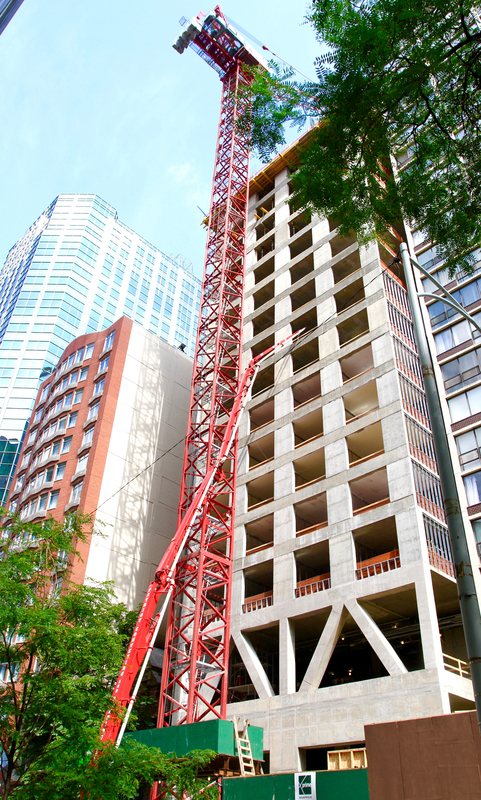 The contractor is making good progress on enclosing the west building. 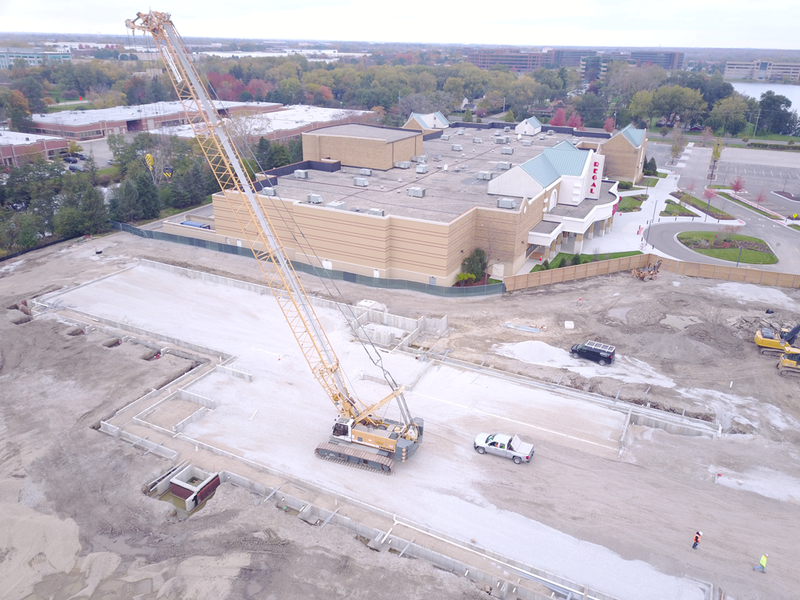 We are now expecting to commence first tenants to move in by the middle of November. 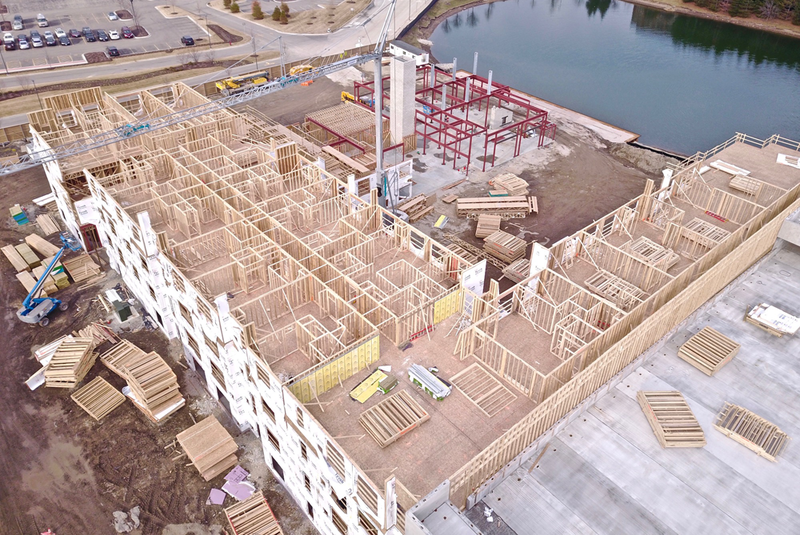 1) Wood framing is 100% complete for the east building with 95% of the unit windows installed. 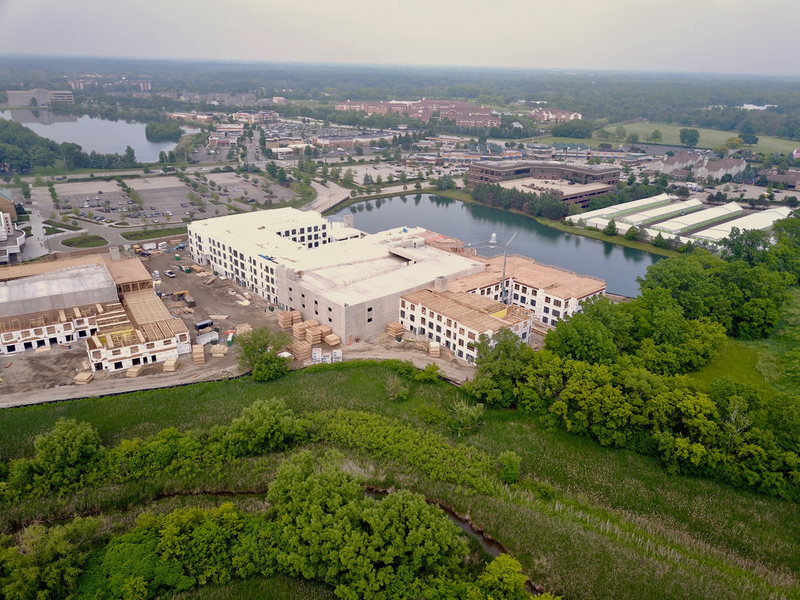 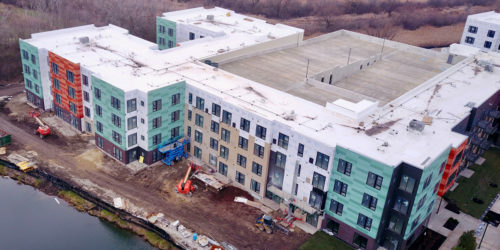 Roofing is complete over the north portion of the east residential building. 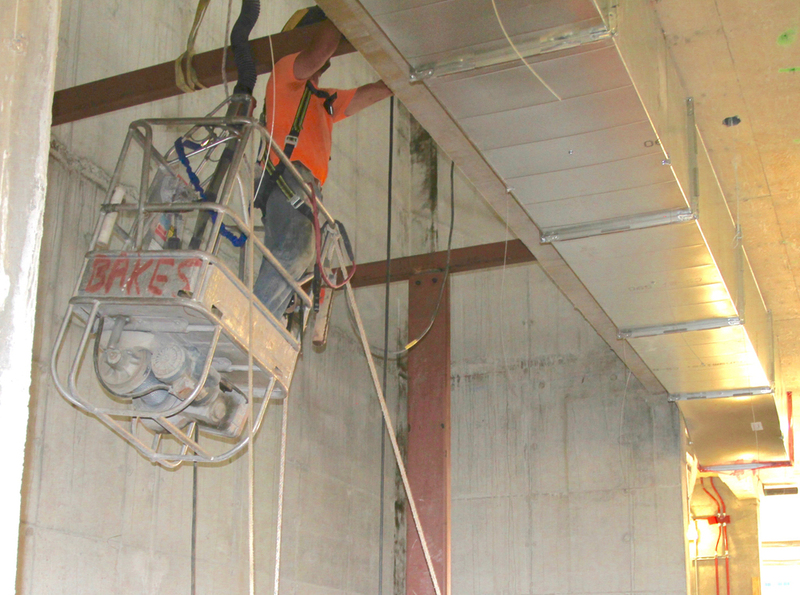 Inside the east residential building, unit drywall has commenced on the first floor of the east building. 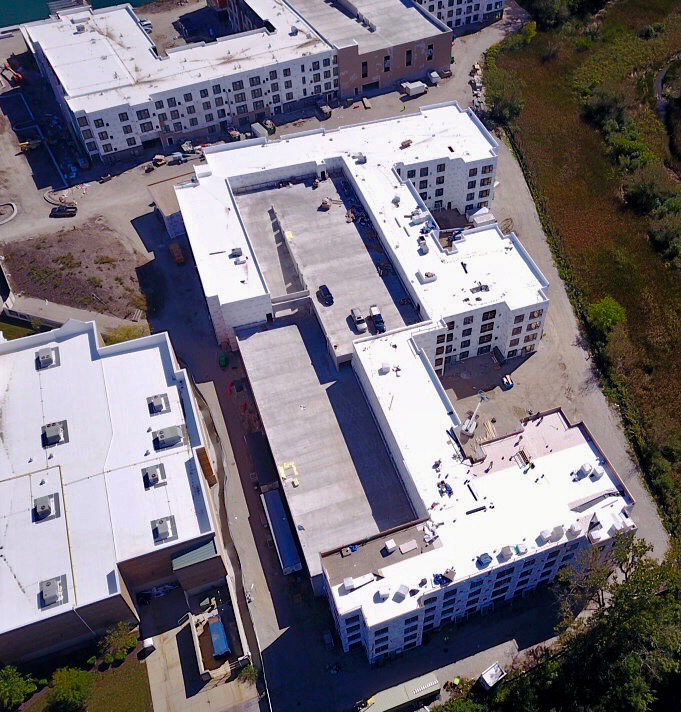 The contractor estimates the community area located in the east building will be ready for occupancy early October. 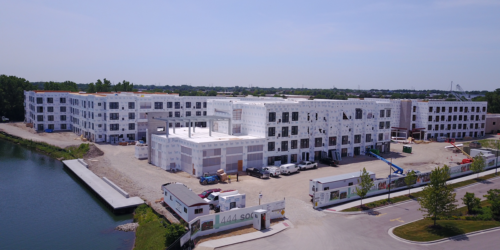 We expect some units to ready for occupancy the third week of October. 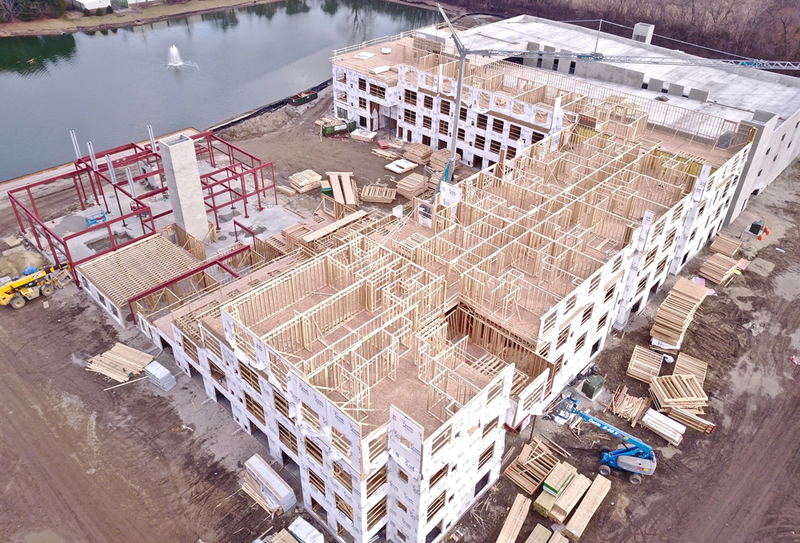 2) Wood framing is 60% complete on the west building. 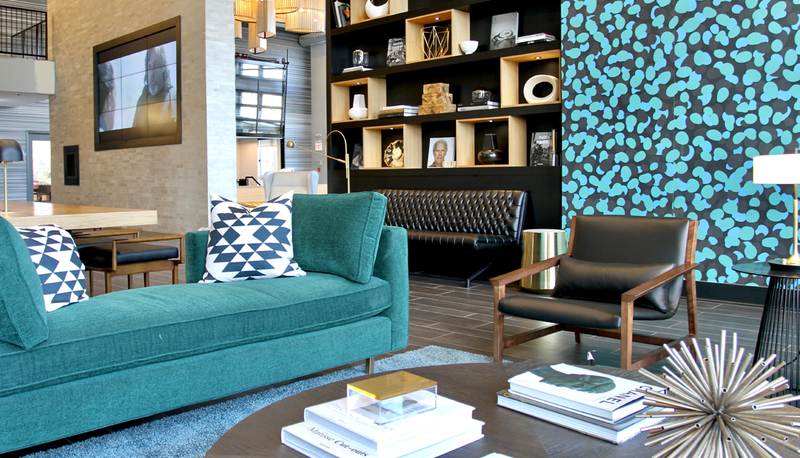 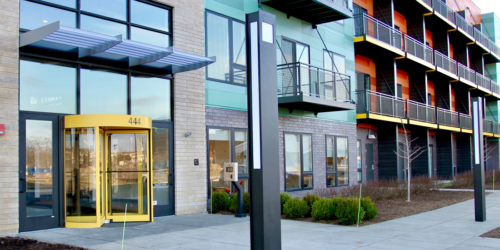 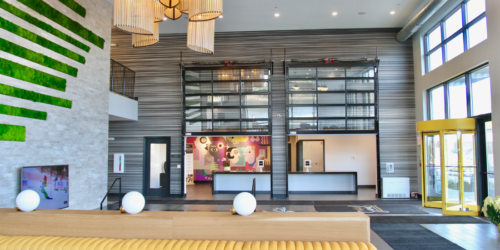 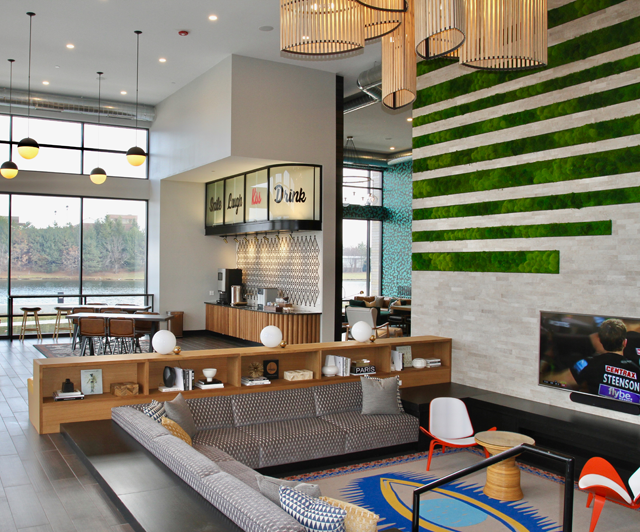 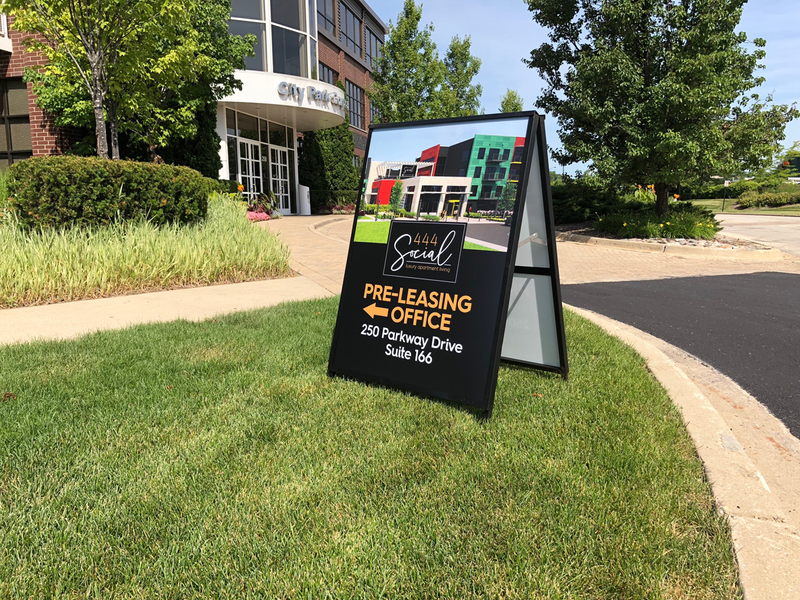 3) The Pre-leasing office has opened over the July 4th weekend. 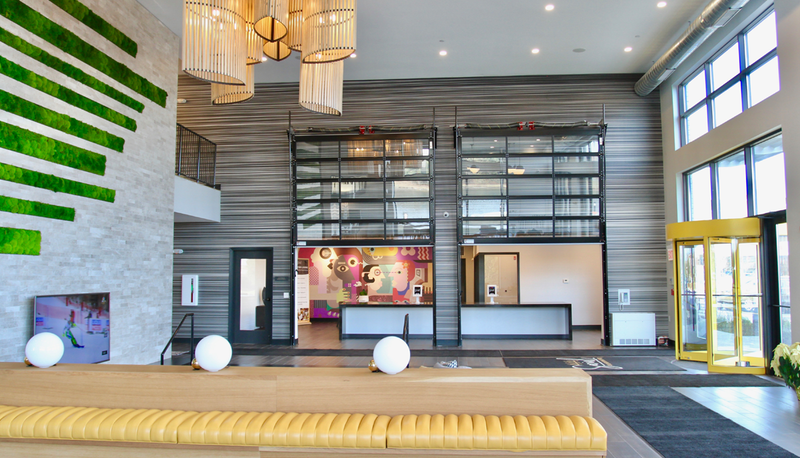 We are delighted to report we have signed four leases thus far. 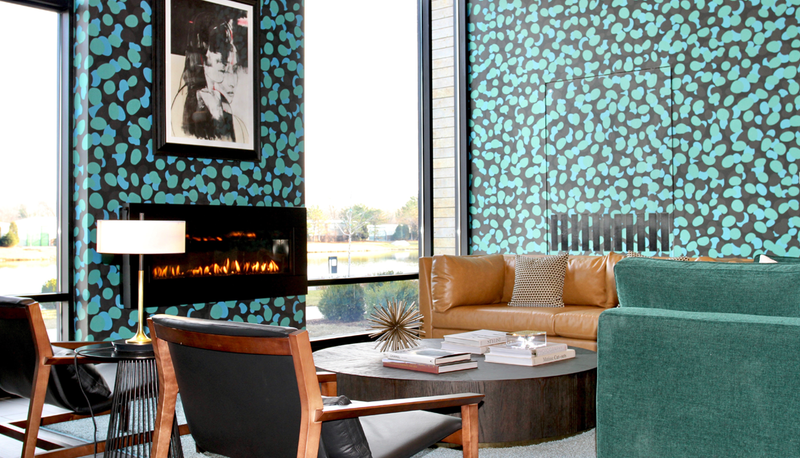 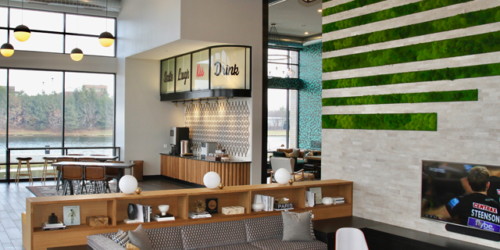 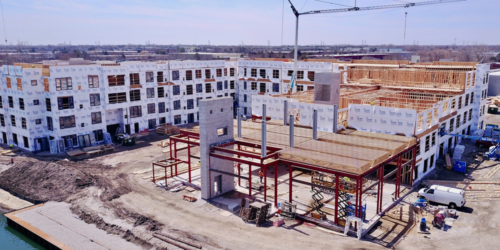 The first two photos highlight the lush green views that 444 Social residents will enjoy, while, at the same time, our residents are only a short walk from lots of dining and shopping options. 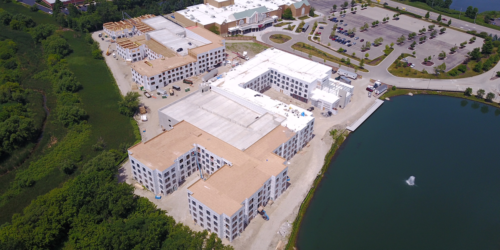 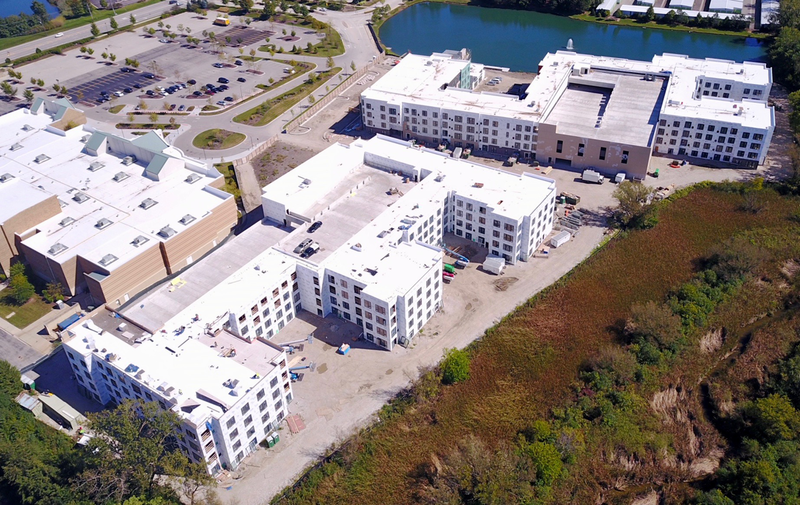 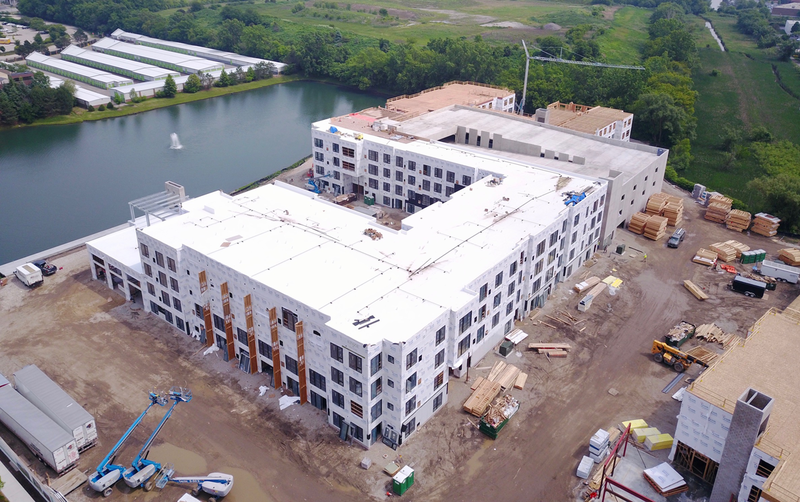 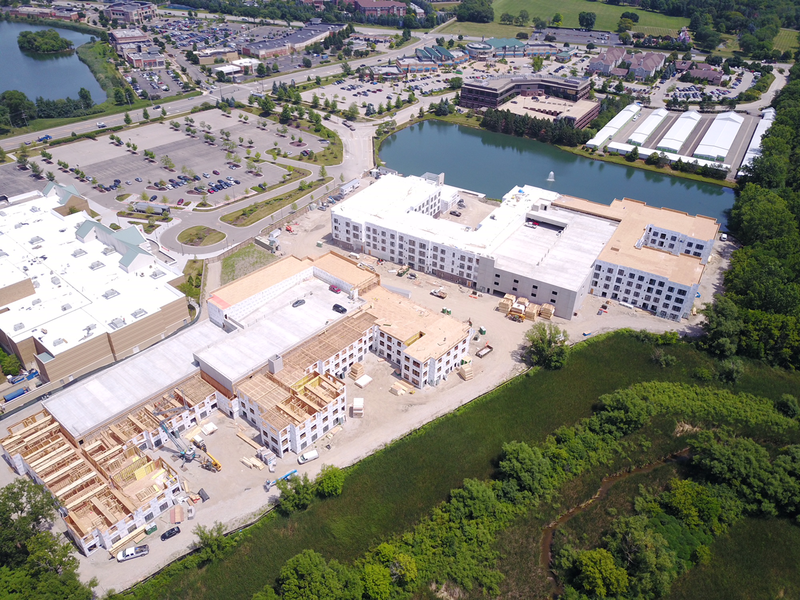 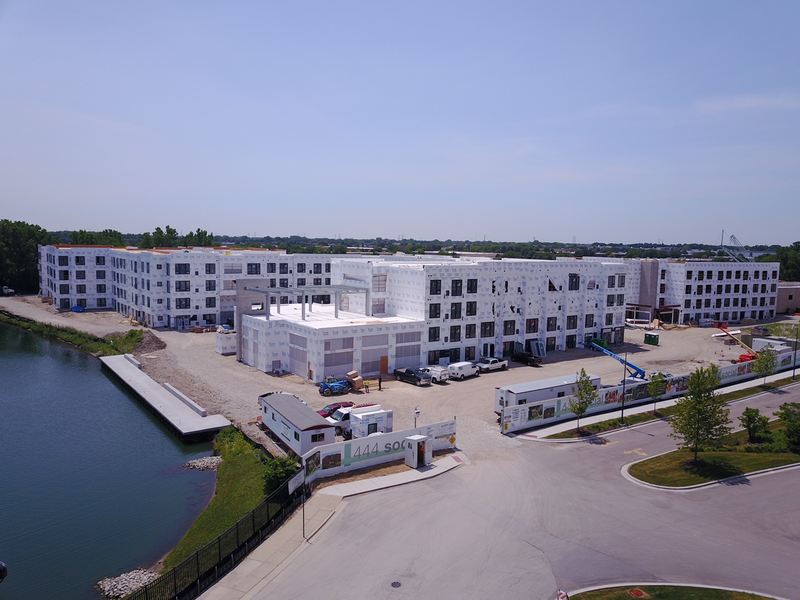 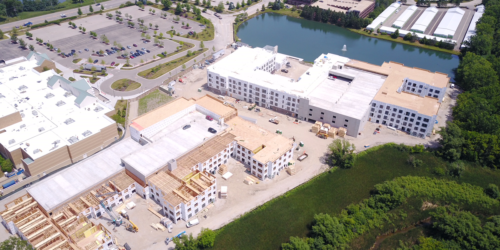 Please notice that the northern portion of the eastern residential building is topped out and most of its roofing is complete. 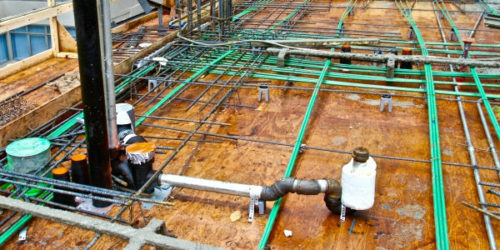 The contractor is now in the process of creating a water tight enclosure in this section of the building. 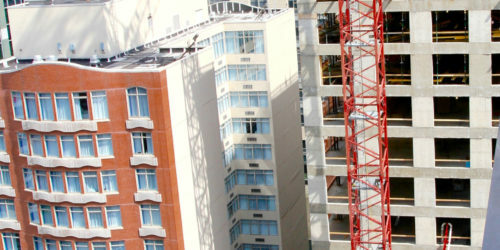 The southern portion of the eastern building is framed to the third floor. 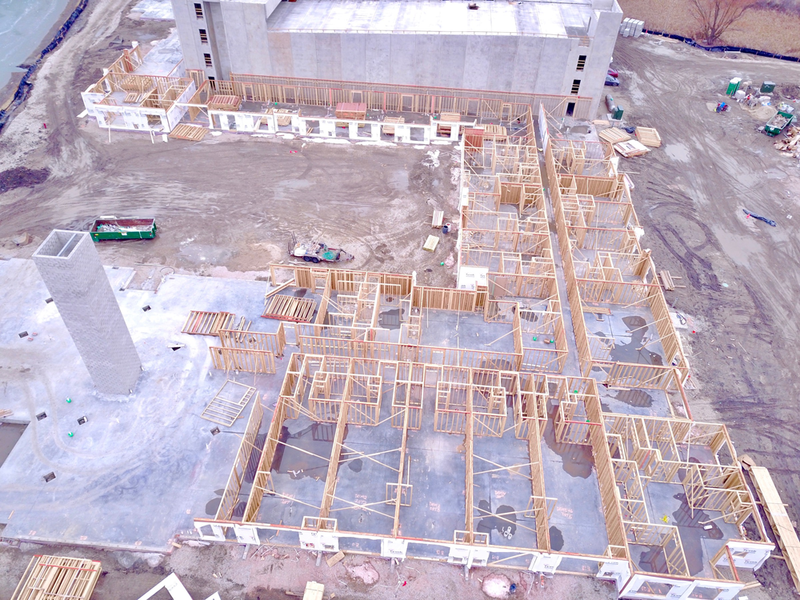 The western building is in various stages of framing. 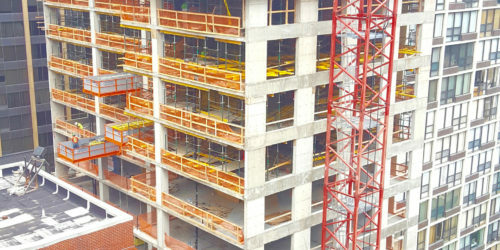 The most northern and eastern portions of the eastern building have been framed to the third floor. 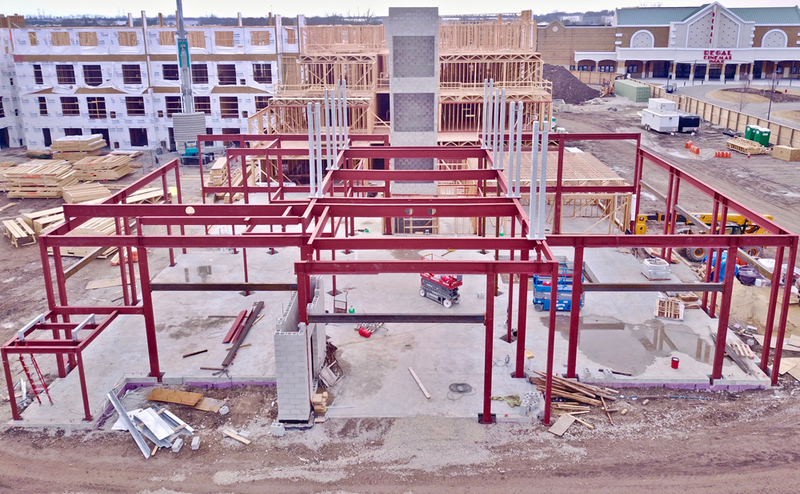 The central section of the western building is framed up to the second floor. 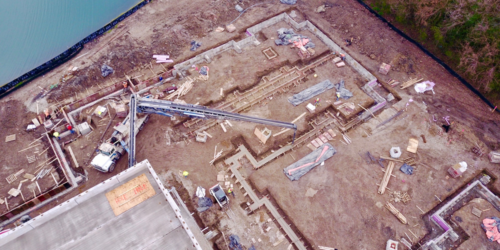 Finally, the carpentries have just started tilting first floor walls on the most western portion of the western building. 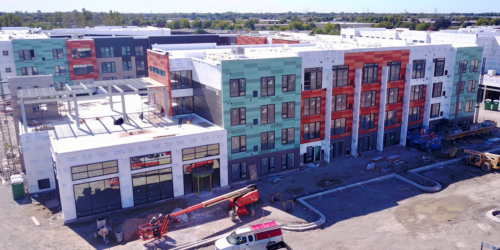 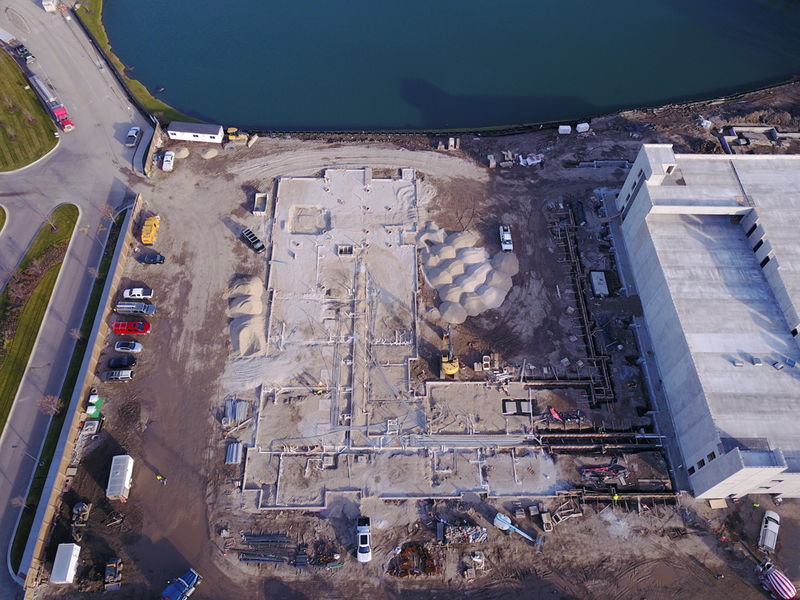 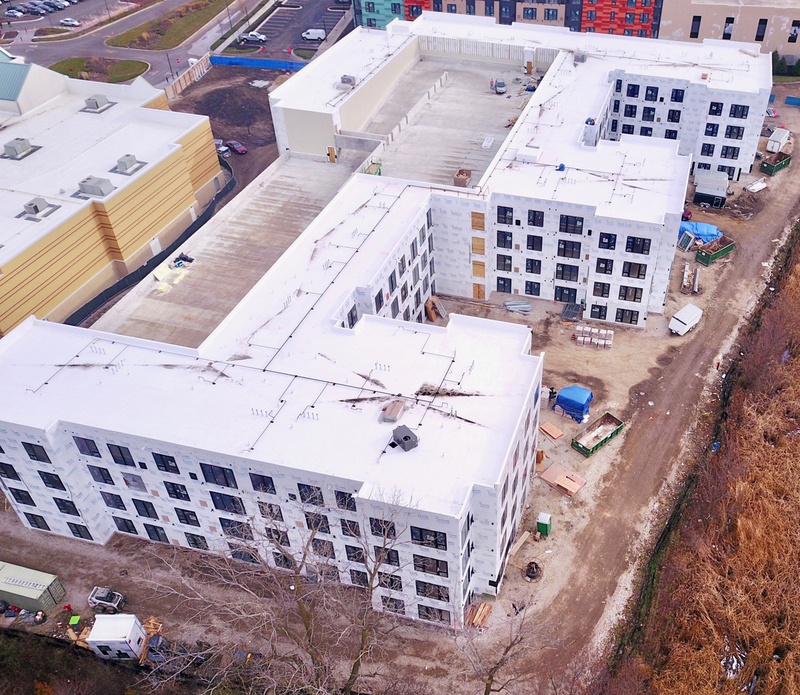 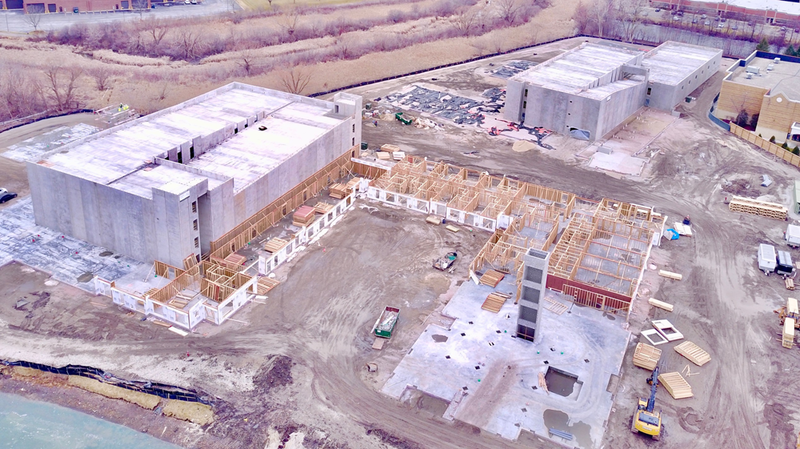 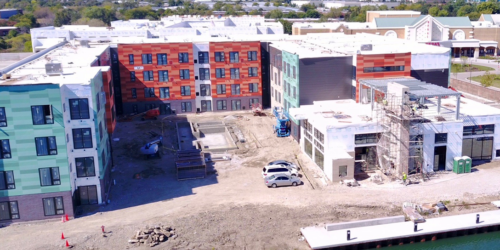 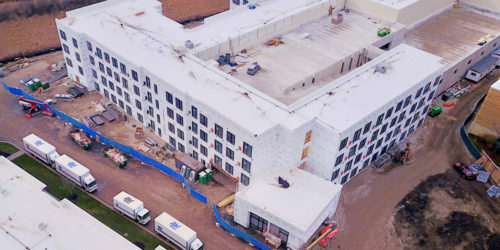 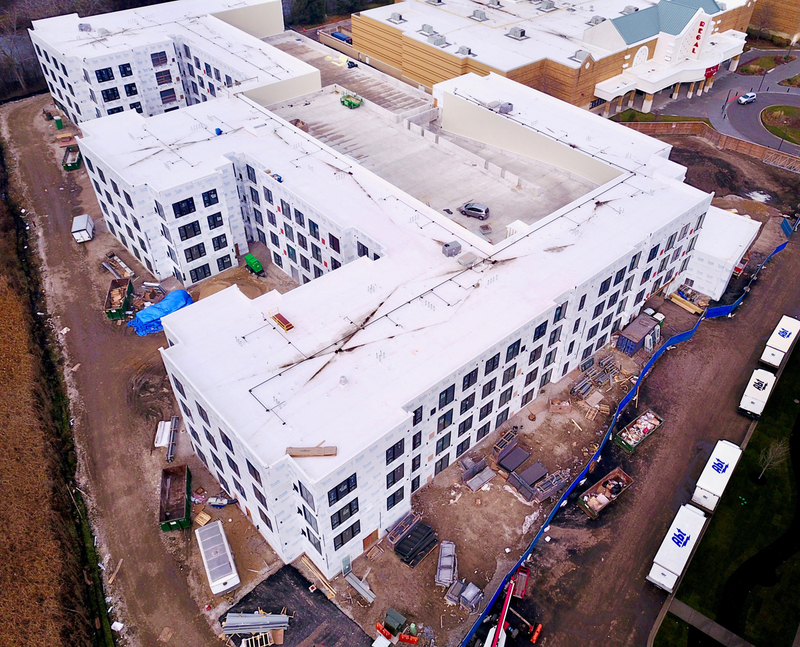 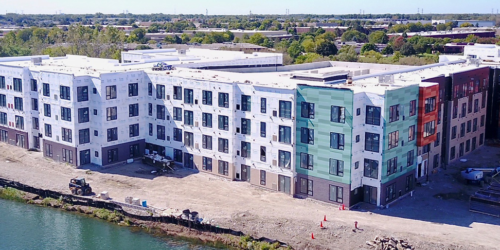 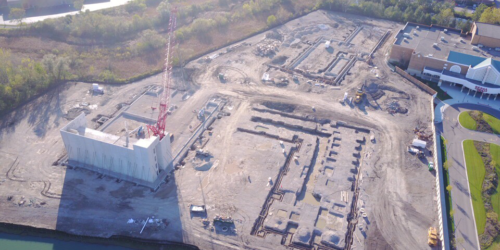 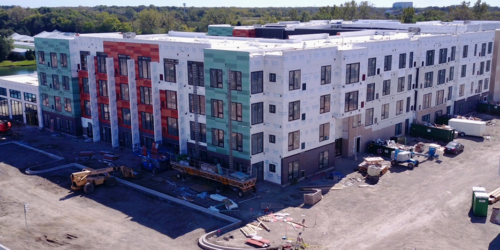 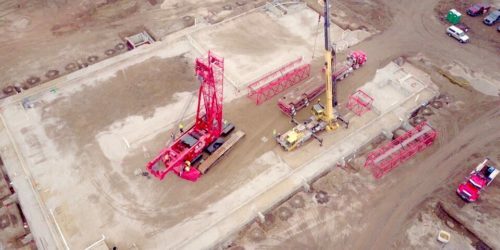 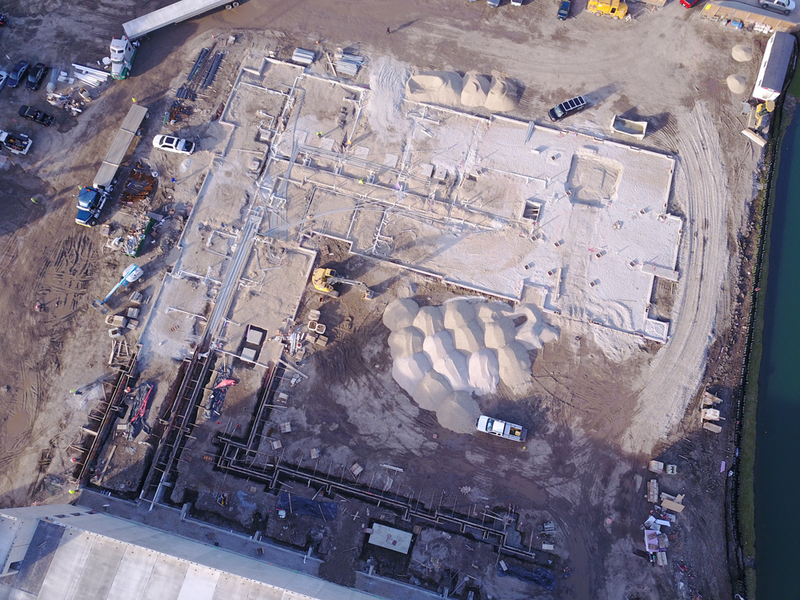 We are delighted to forward drone images showing the exterior construction progress at the 444 Social construction site. 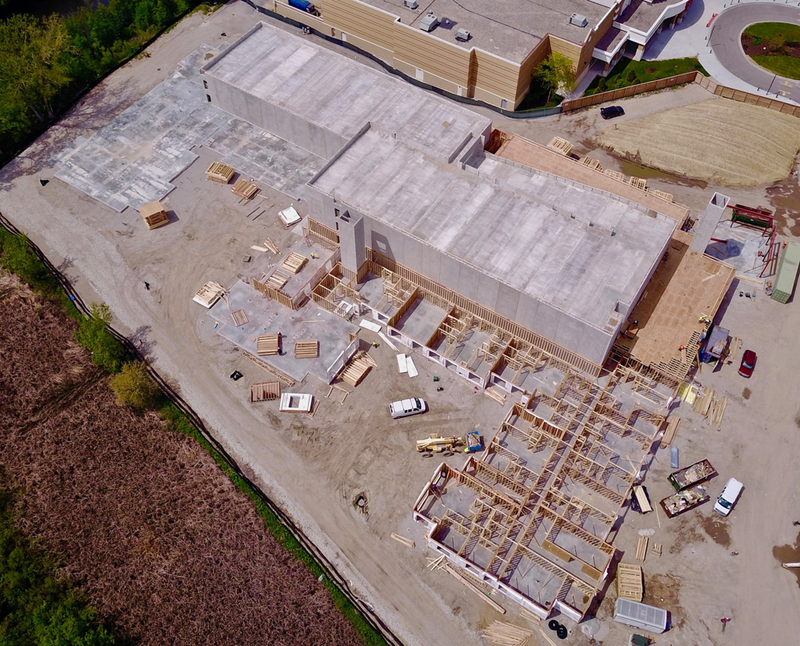 Rough carpentry shell complete on the entire northern portion of the eastern building. 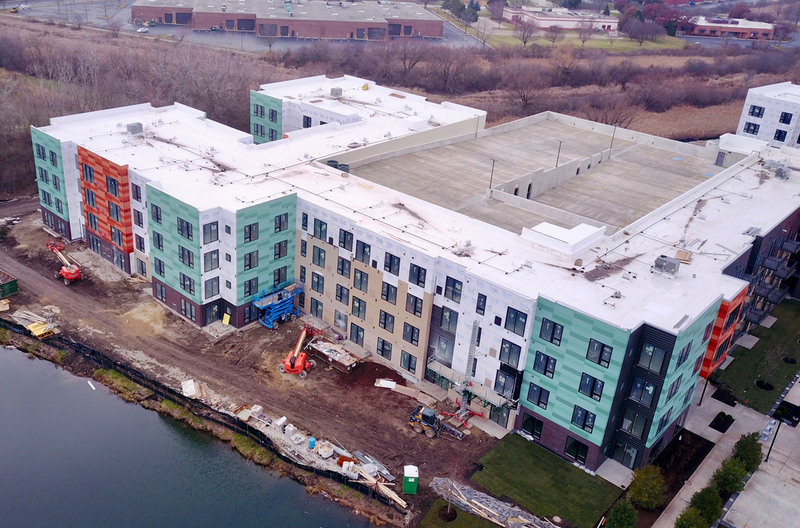 Roofing material being set on 50% of this northern portion of the residential building. 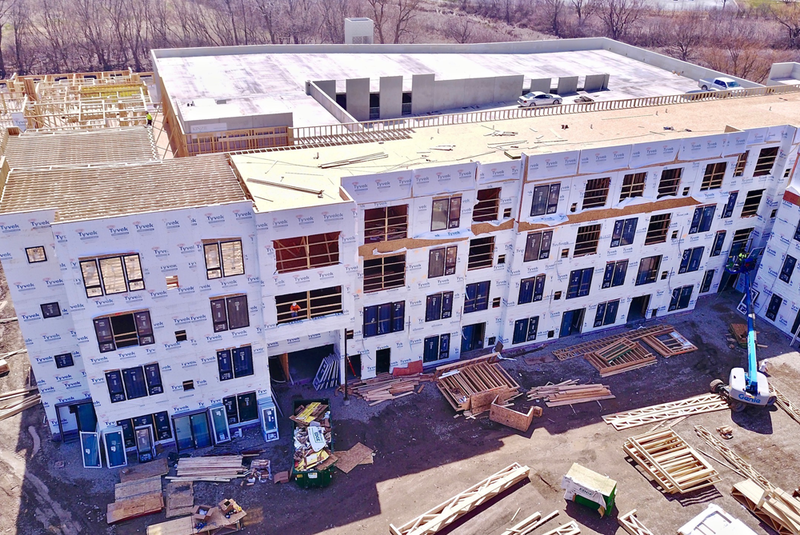 Exterior windows set on more than 70% of the northern portion of this building. 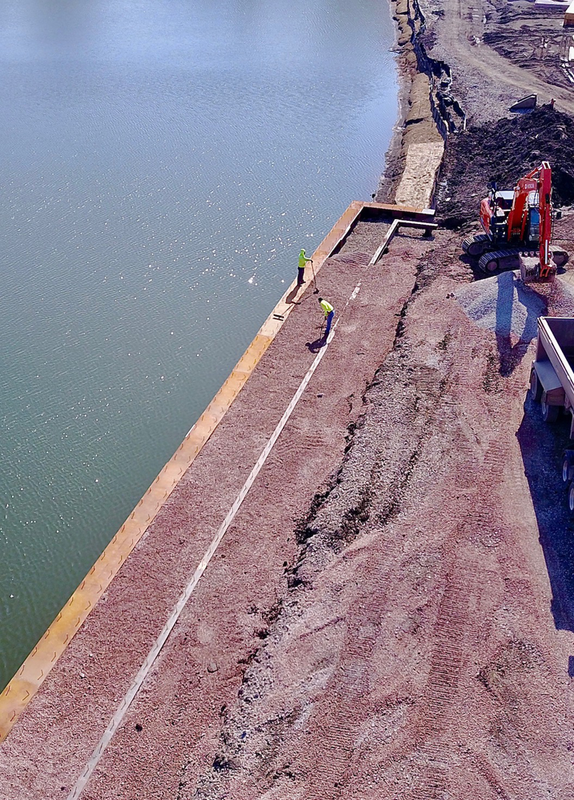 Concrete Kayak dock is fully poured in place. 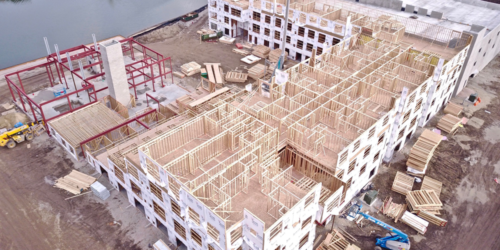 Crane relocated to the southern portion of the eastern residential building and photographs show that carpentry framing has reached the second floor of southern portion of the eastern building. 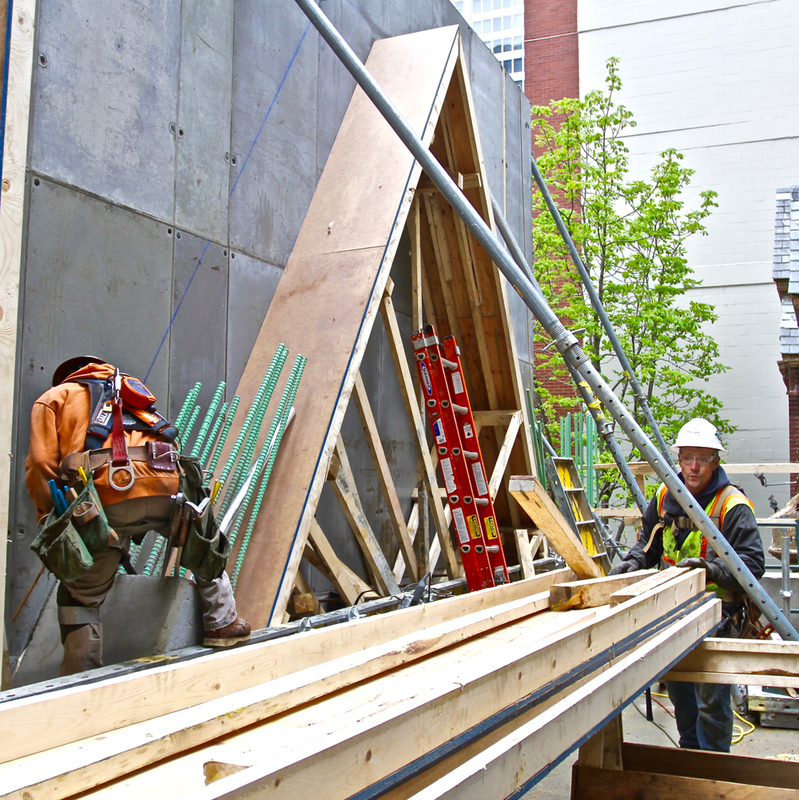 Wood walls being set in place on 50% of the first floor for the western building. 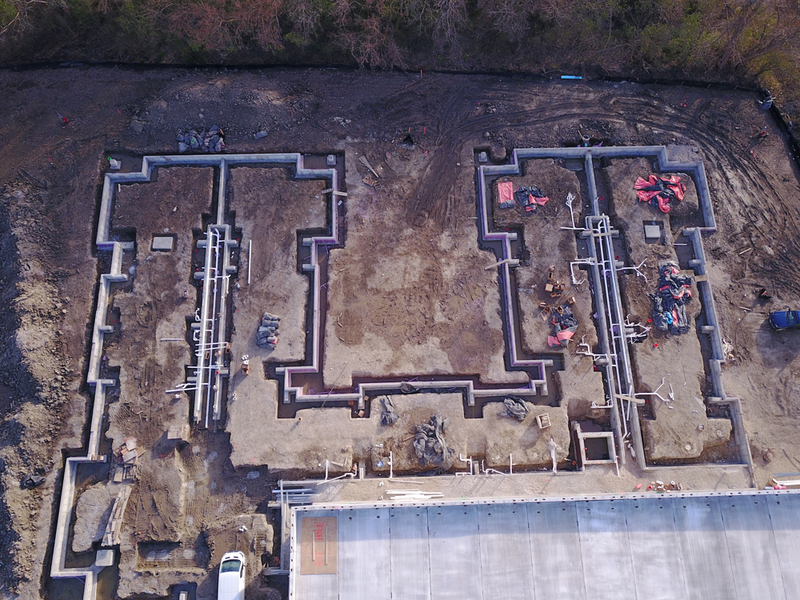 Completed framing and steal set for the communal building. 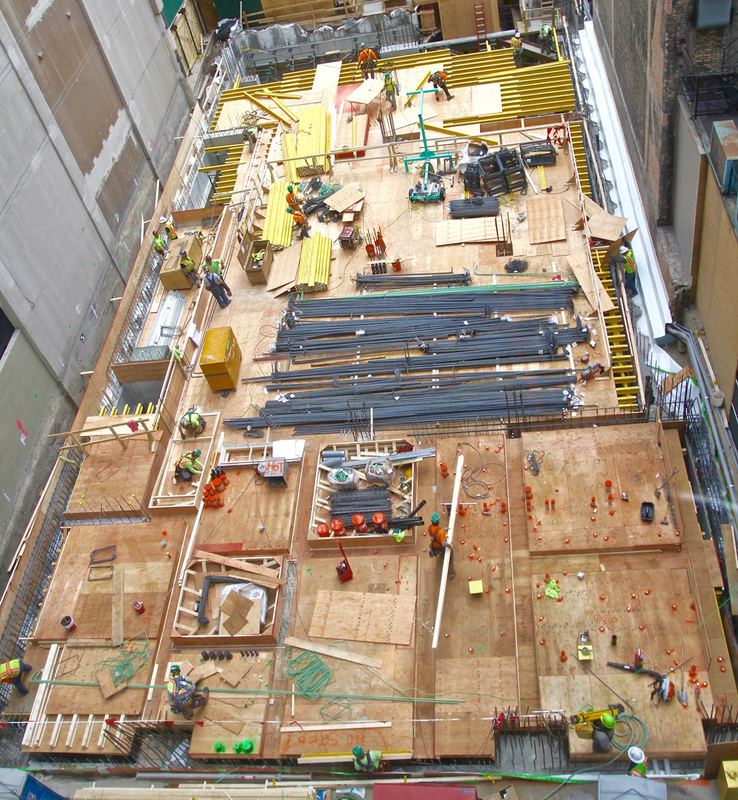 Also, the second floor roof-top roof deck completely framed. 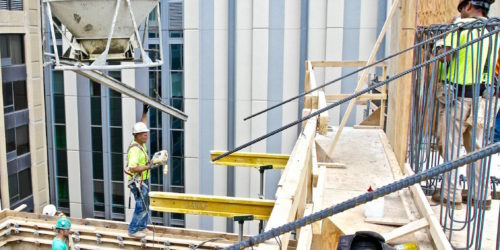 The Steel pergola frame is shown nearly complete on top of the second floor deck. 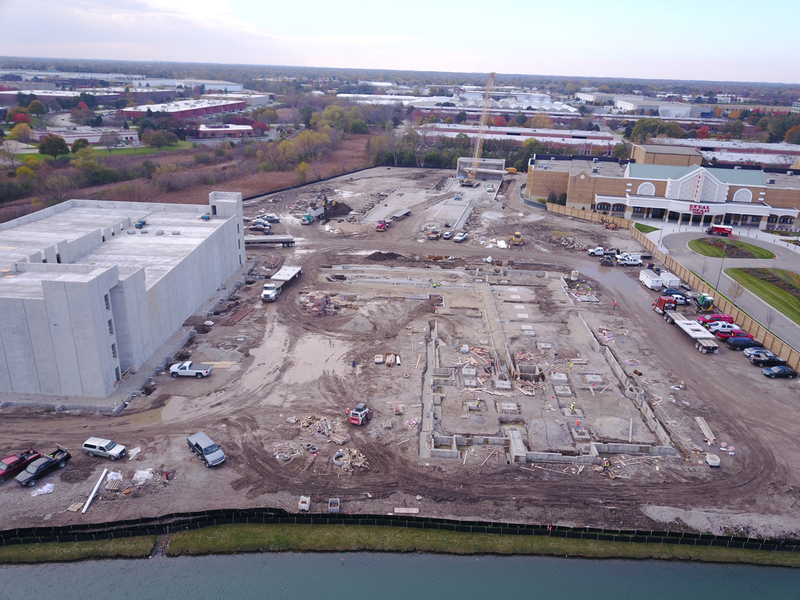 Here is a brief over-view of what these construction progress photos illustrate since last month. 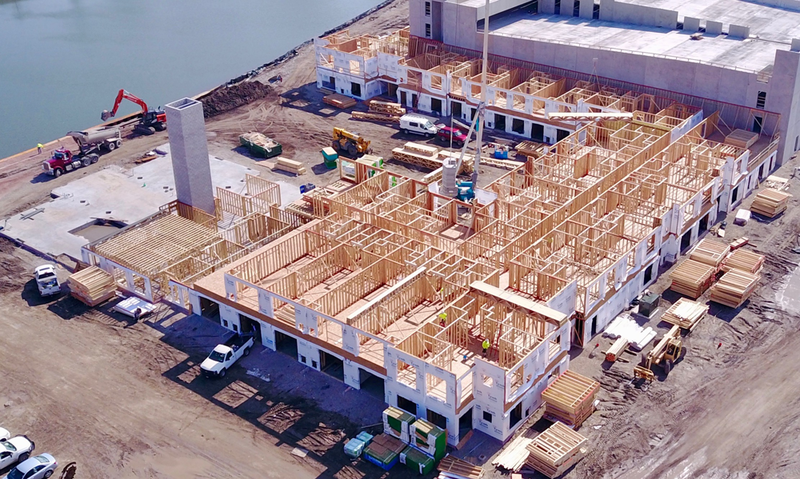 Wood framing for the residential building has been connected to the communal building made from steel. 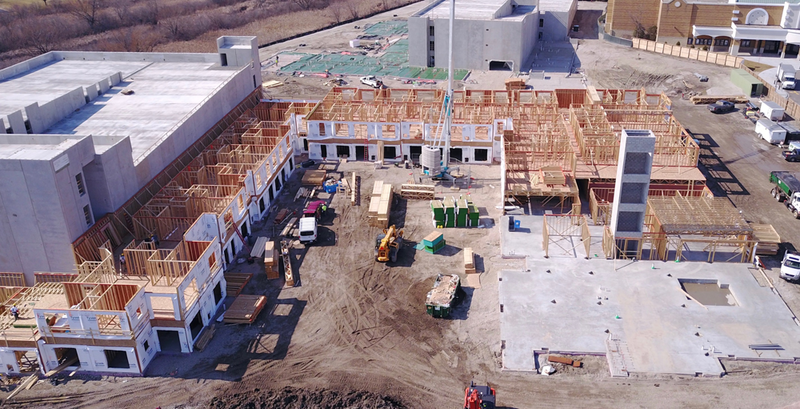 Wood roof trusses have been added to this steel communal building. 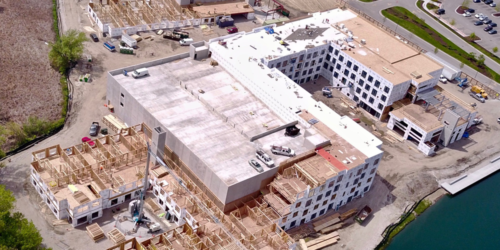 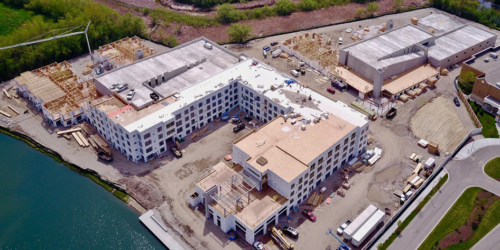 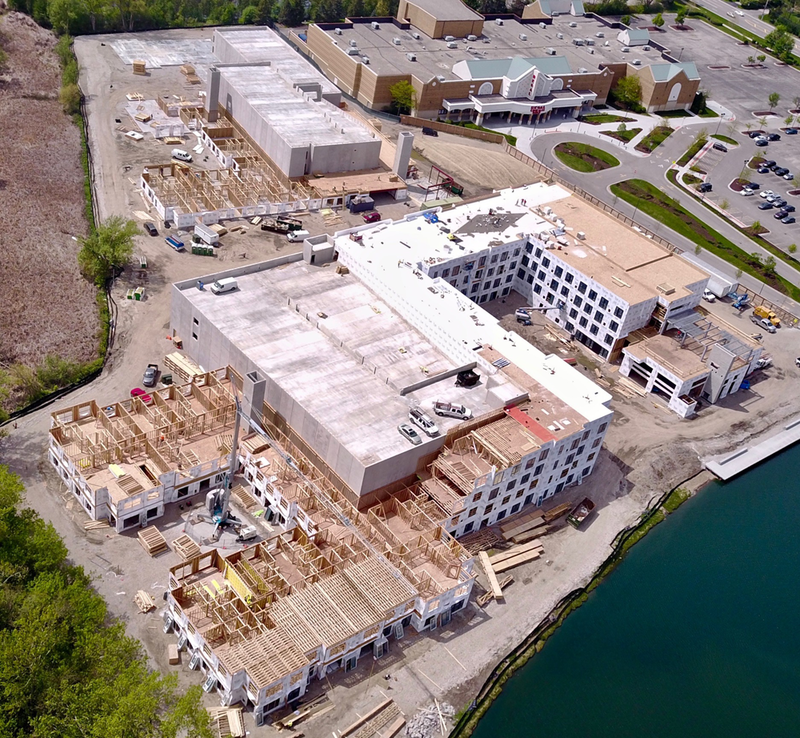 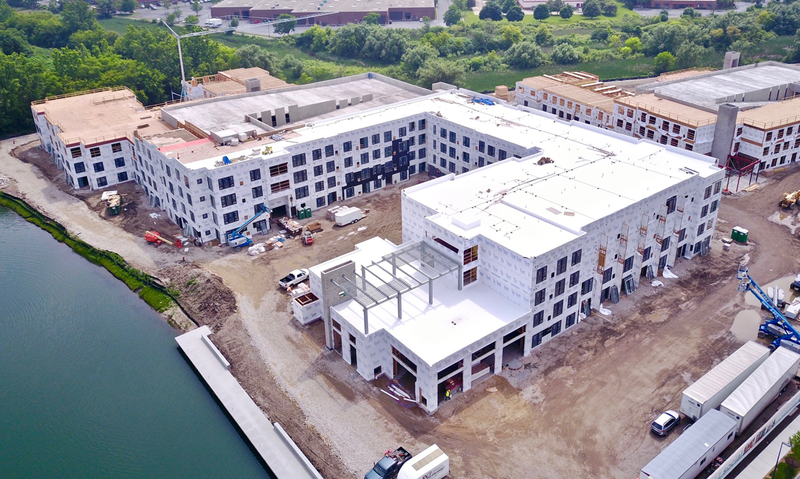 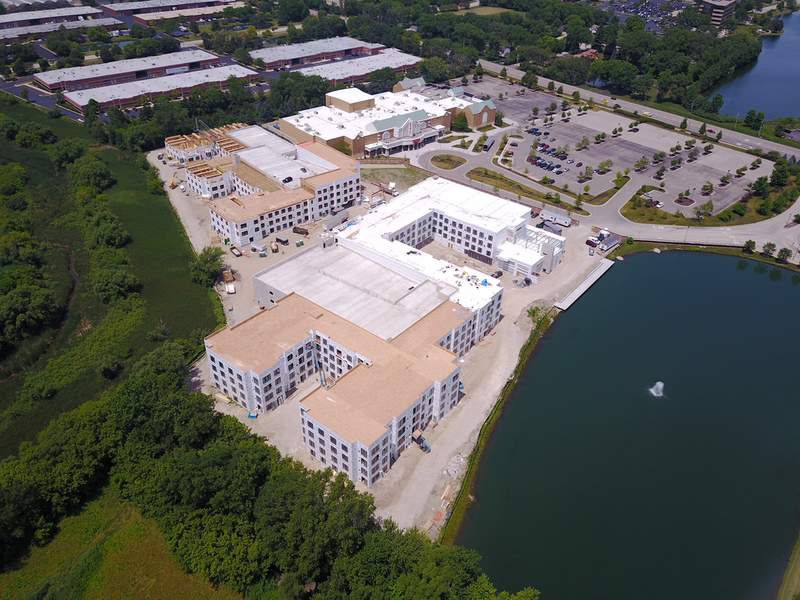 Carpenters are 50% complete with the roof deck on the northern section of the east residential building. 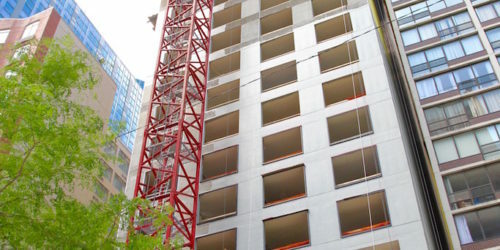 Windows are beginning to be added to the residential openings. 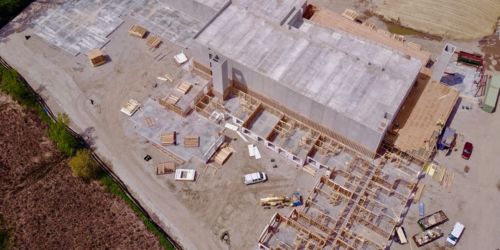 In the southern portion of the eastern building, first floor walls are being erected. 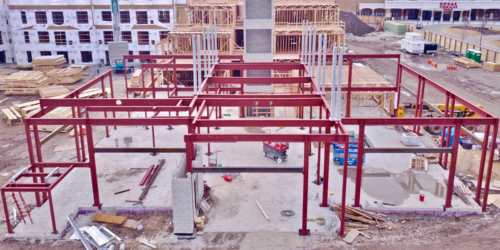 The steel structure of the entry way to the western residential building has been set. 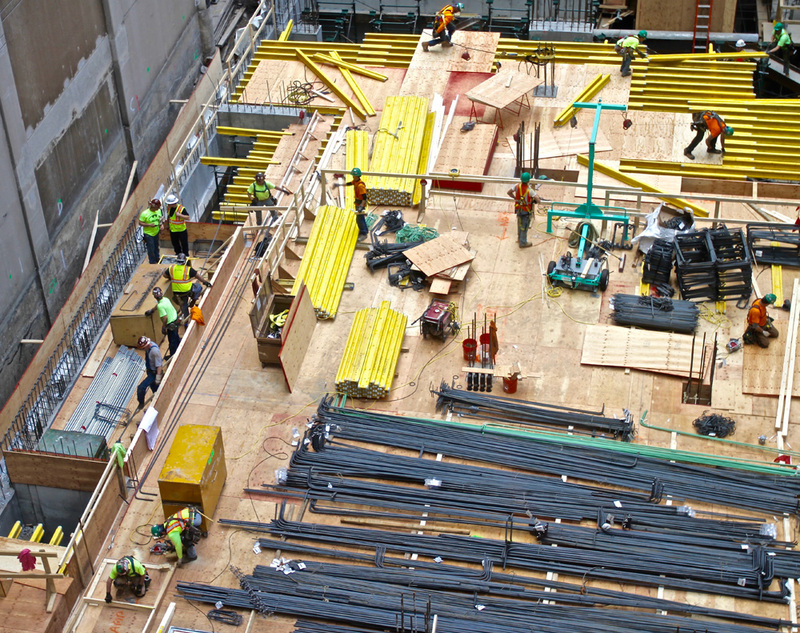 Carpenters are working on the fourth and top floor of on the east building on the northern section. 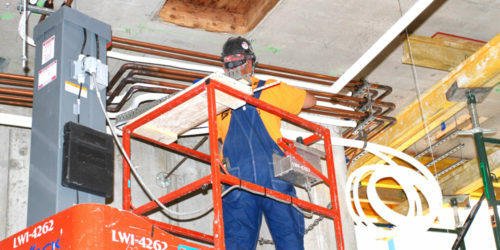 Unseen in the pictures, plumbing, electrical and corridor drywall occurring inside the building. 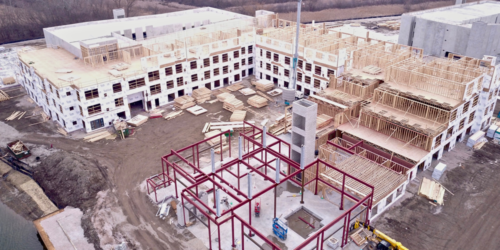 The carpenters have completed panels and trusses for floors one, two, and three up to the steel work. 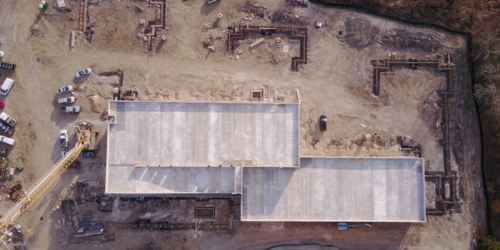 Fourth floor deck and layout is complete. 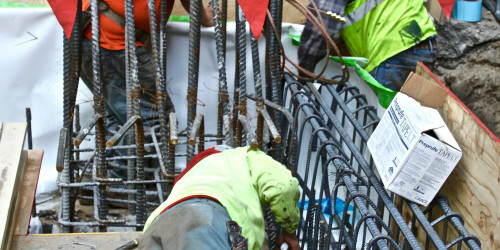 A crew has now started to tie in panels and trusses into the newly erected steel. 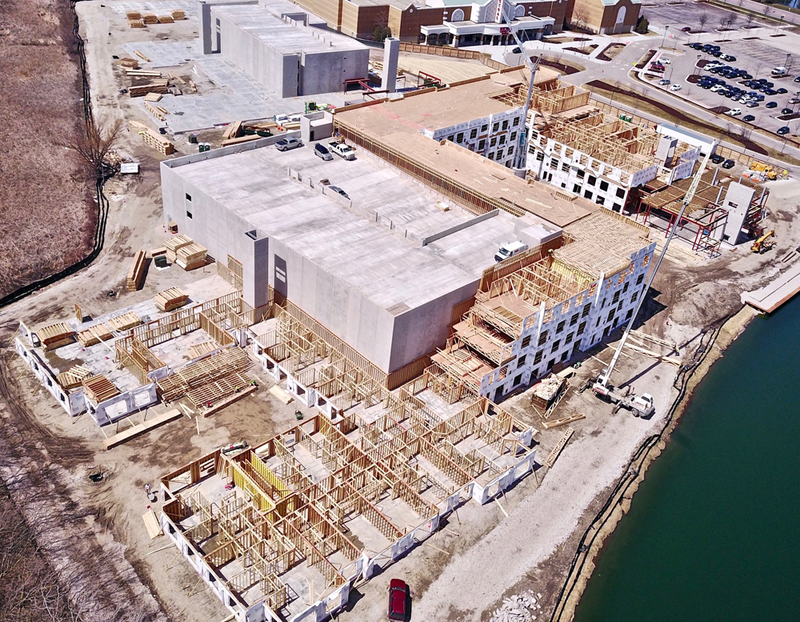 Fourth floor panels are currently being tilted and near 60% complete. 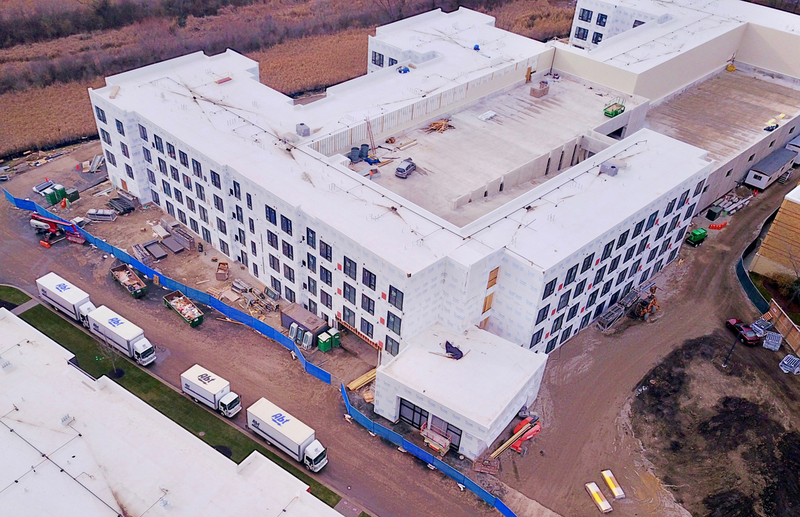 Fourth floor panels are projected to complete four (4) days ahead of schedule. 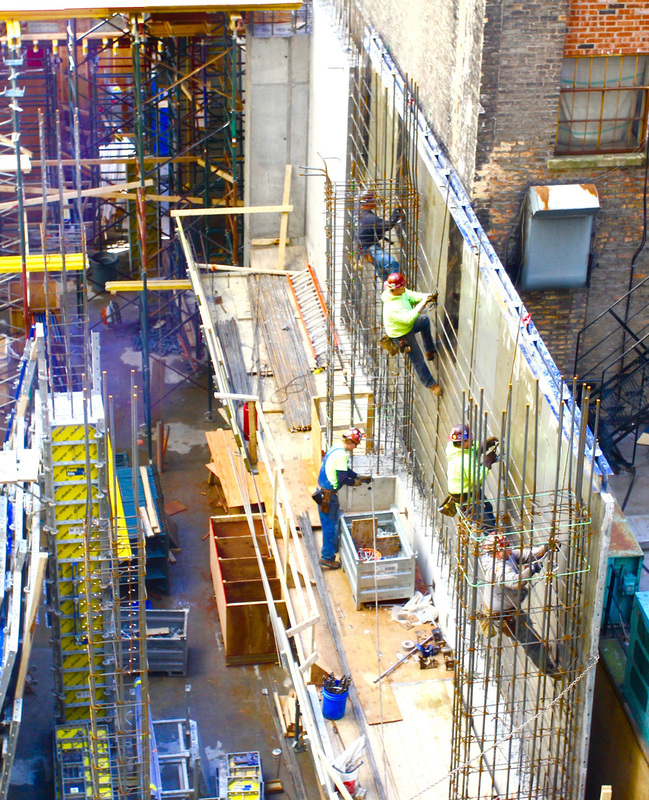 Backout continues on all floors. 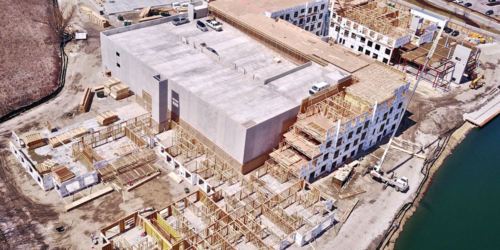 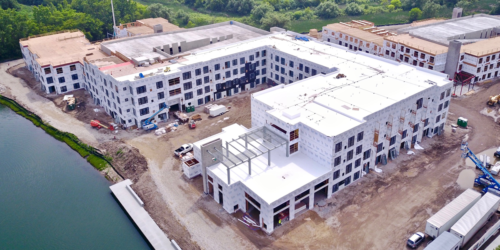 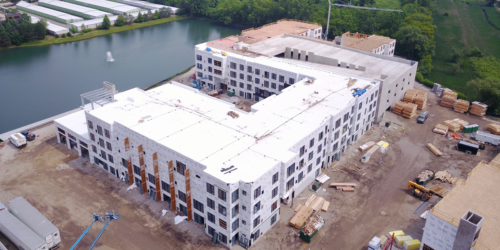 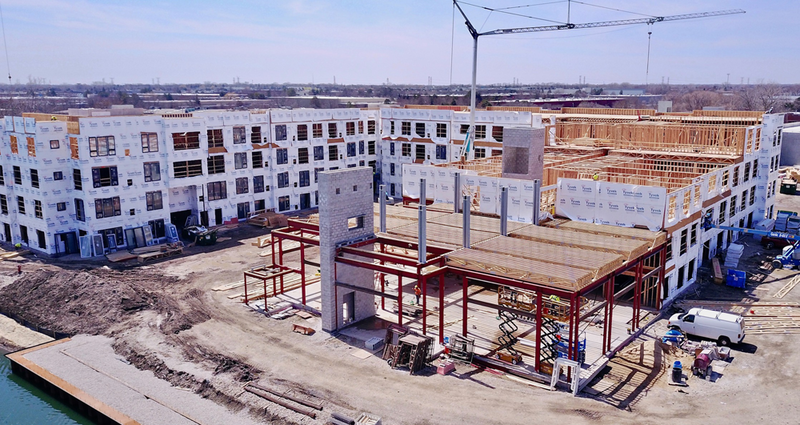 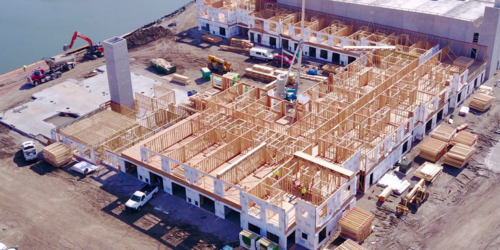 The contractor has completed the wood framing for the first and second floor for the northern portion of the eastern residential building. You can see from the photo, the contractor has commenced setting the trusses to support the third floor of this portion of the building. 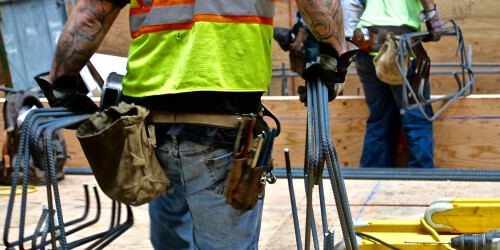 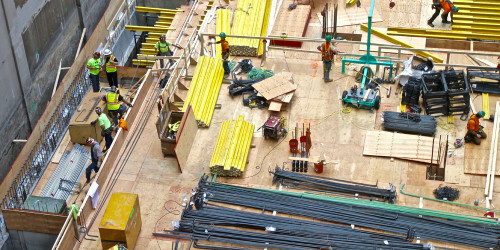 The contractor has indicated that we should see the pace of the carpentry substantially accelerate during March. 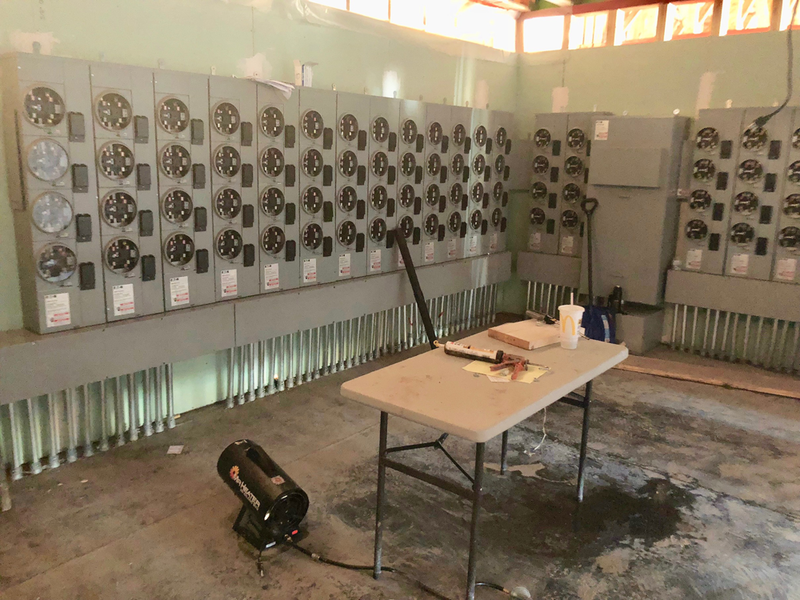 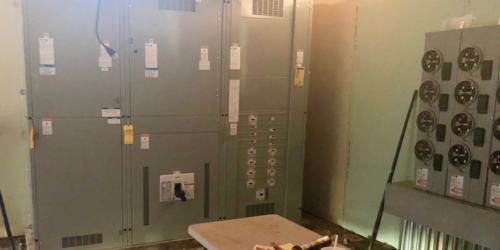 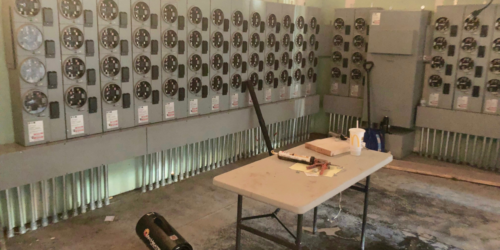 The photos below show that the electrician has placed the electrical switch gear for the permanent power for the north eastern portion of the building. 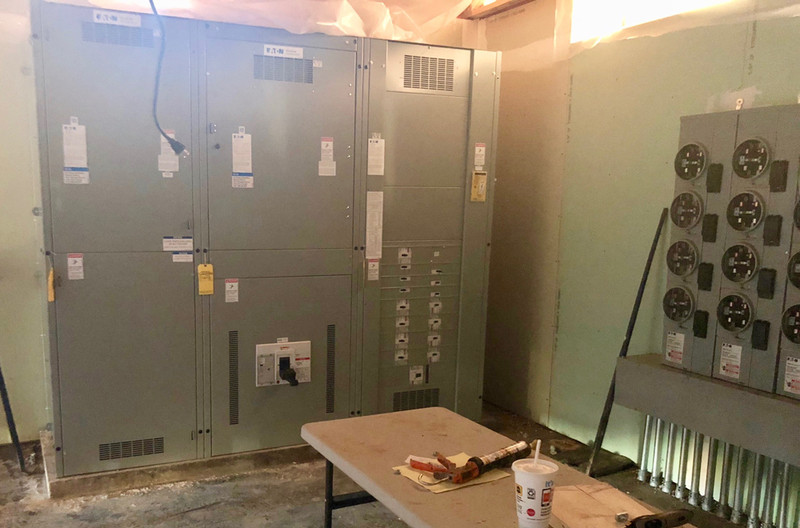 Also, the electrical contractor has placed the meter banks for the apartment unit located on the north half of the eastern building. 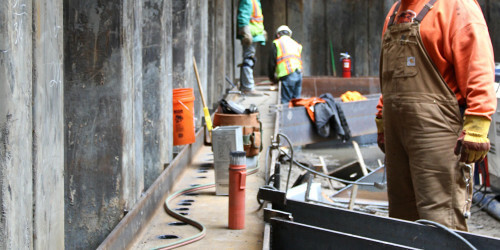 Finally, find the images showing the near completion of the entire underground support system for the kayak dock. 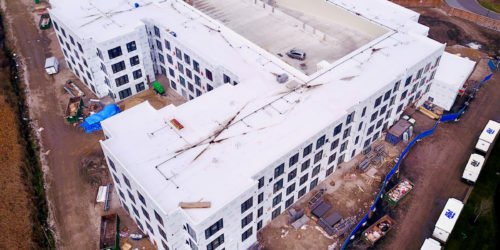 All the sheeting and underground “H” piles and steal caps are complete. 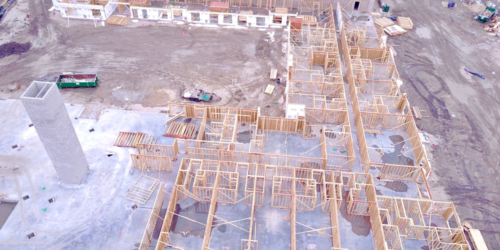 First Floor Wood frame walls set for northern half of eastern residential building. 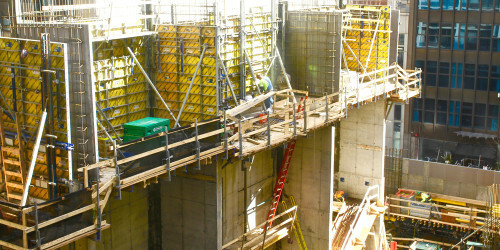 Two Cinder Block Elevator Core Structure have been built for the eastern building. 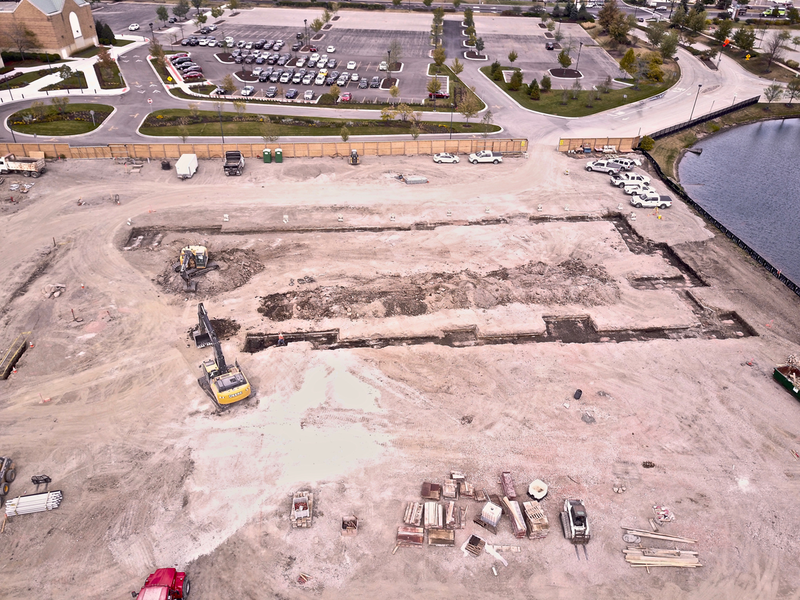 The sheet piles have been set which forms the structure for the kayak dock next to the pond. 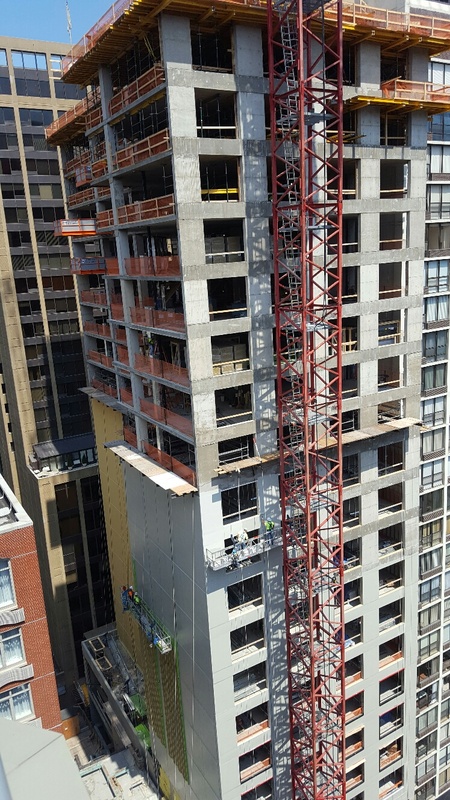 Concrete Block Elevator Enclosure in process of being constructed on both the north and south sides of the east residential building. 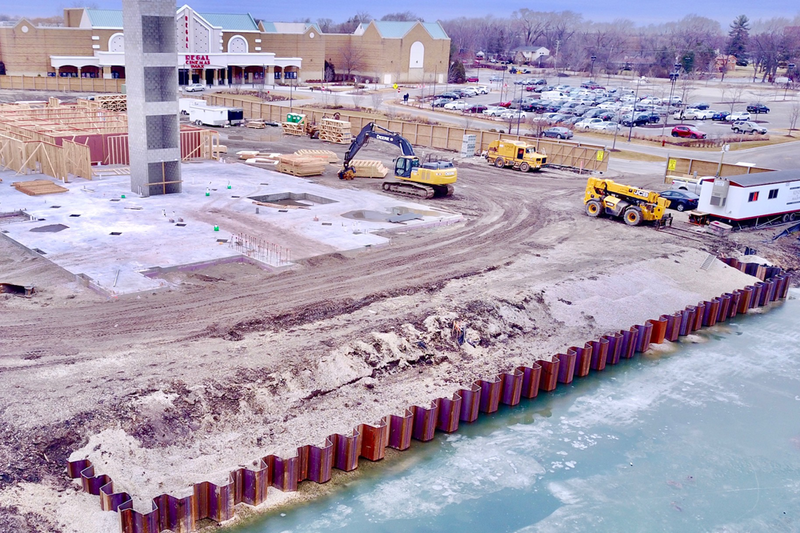 Excavation and fill complete that is necessary to commence the piling driving operation in order to build the kayak dock along the lake. 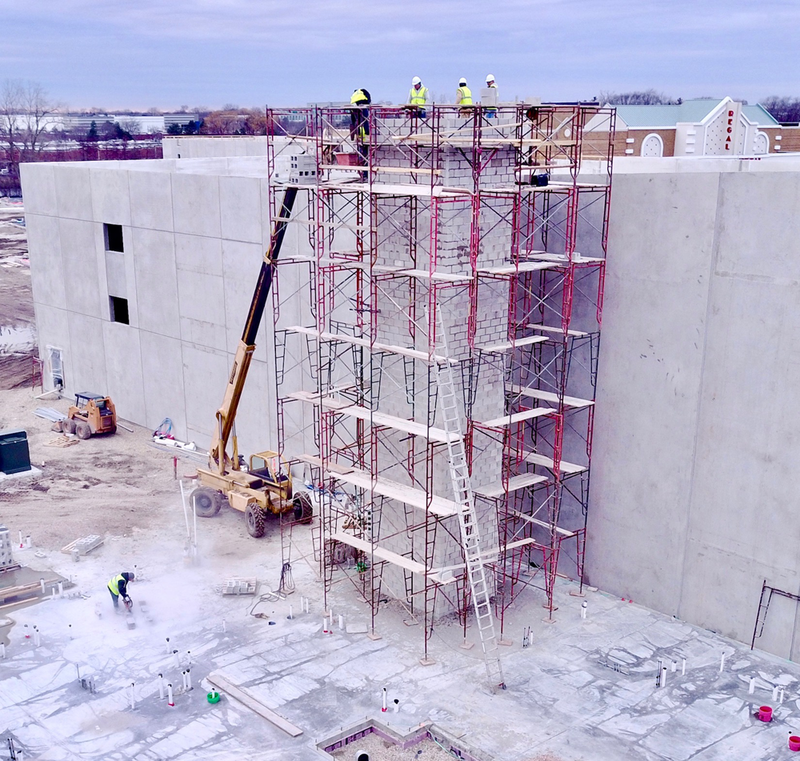 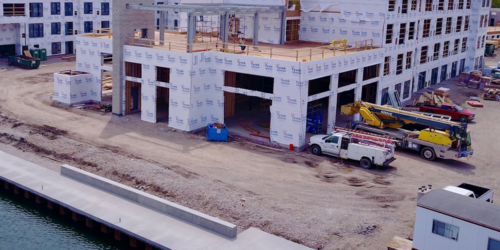 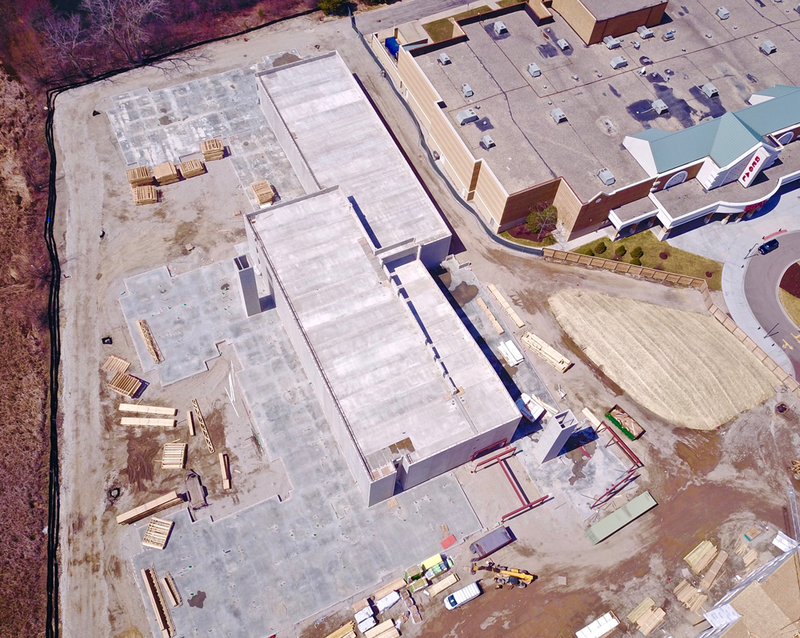 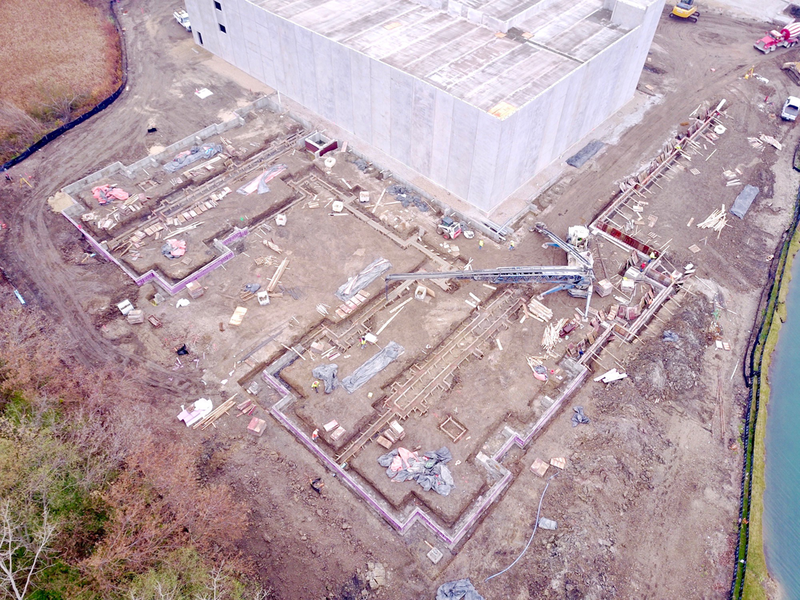 Electrical, plumbing and stone has been set into the west building in preparation to being able to pour the concrete slabs in the west building. 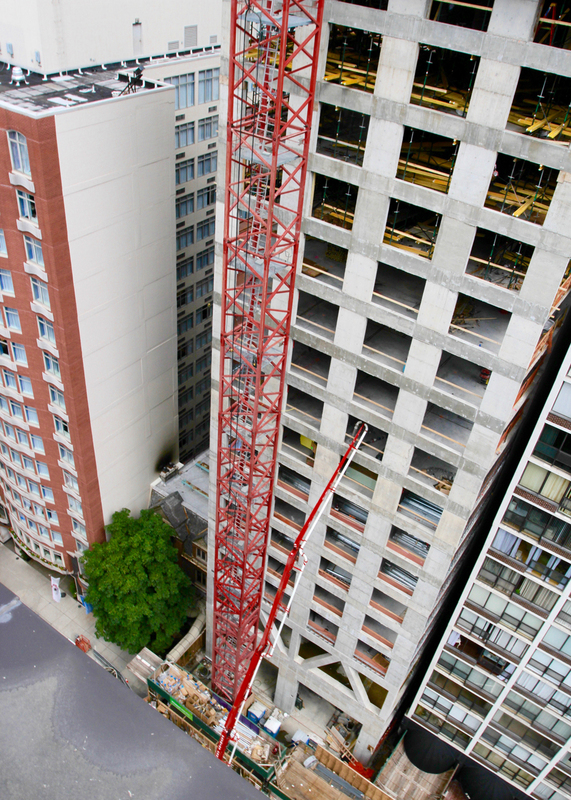 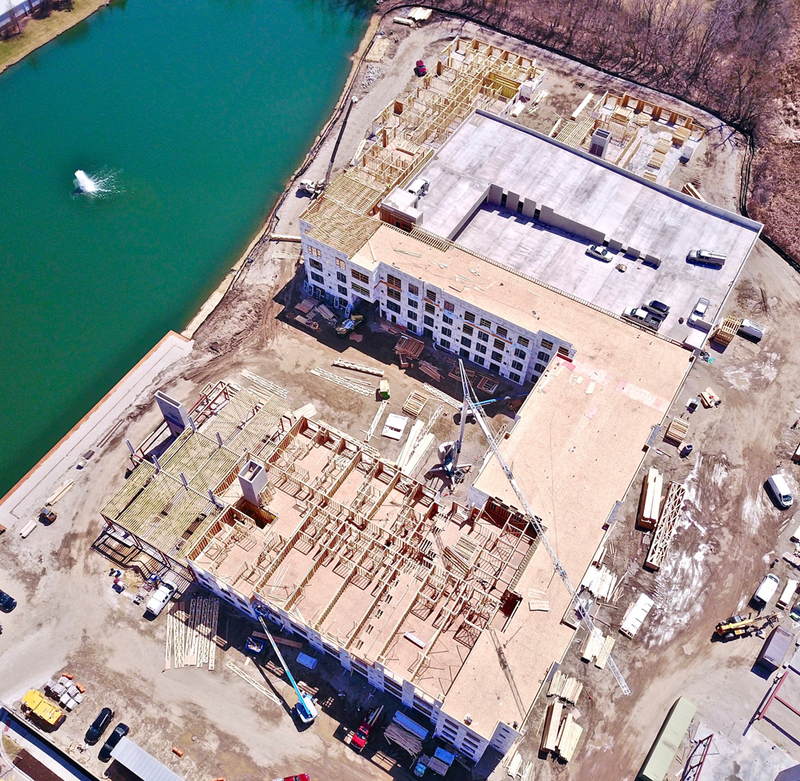 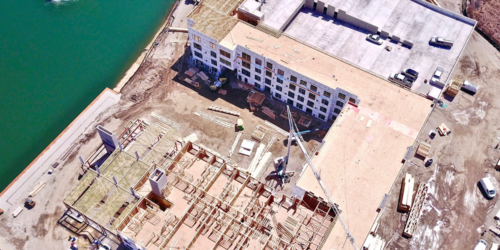 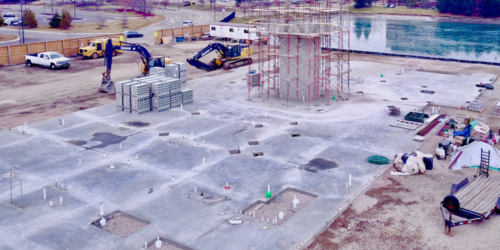 Concrete Slabs are 100% complete for the the entire east residential building. 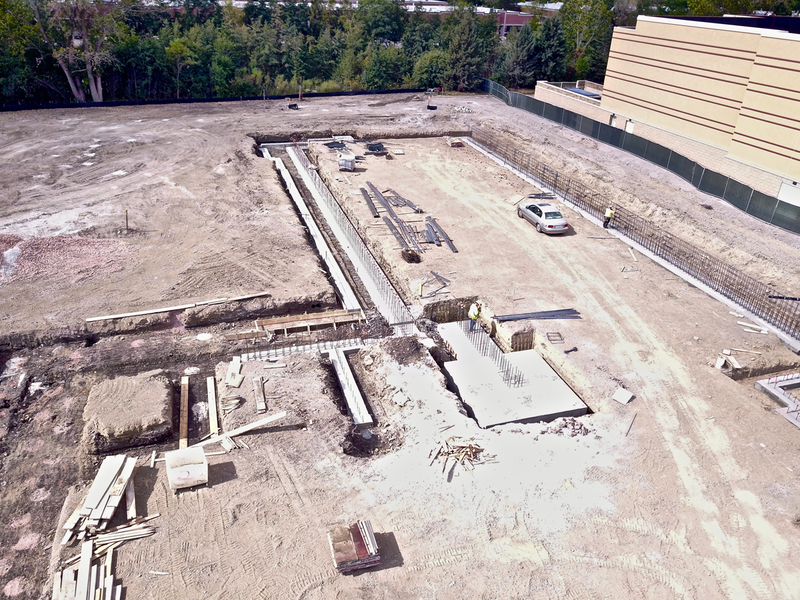 Foundations have been installed in most of the entire west building. 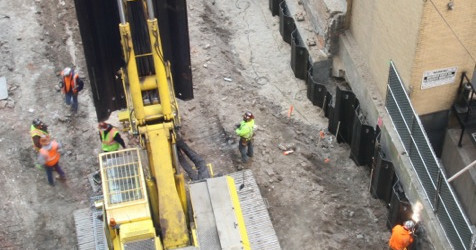 Some stem walls above the foundations in the west building have been installed or are in the process of being installed. 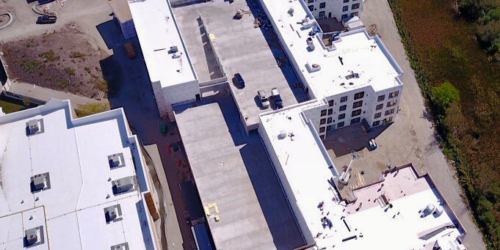 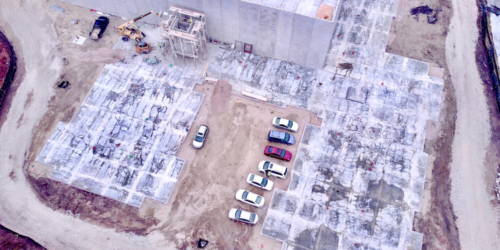 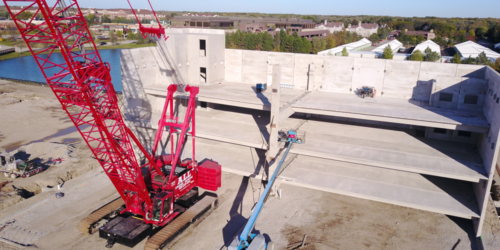 What is NOT shown in these photographs includes that the fact that the concrete floors in the two parking garages have both been poured are now in place and usable. 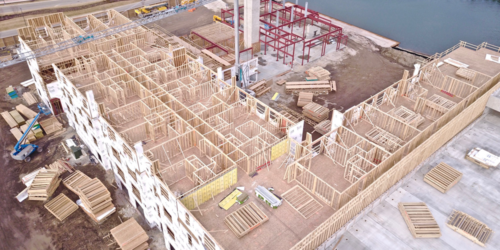 Once the wood frames for the residential buildings have been fabricated ( which will hopeful occur in the next couple of weeks or early next year ) the walls of the residential portion of the buildings will begin to rise. 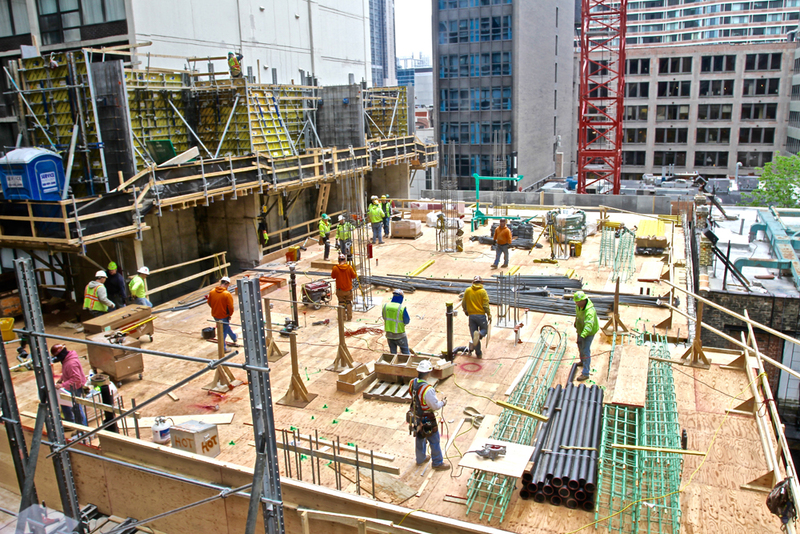 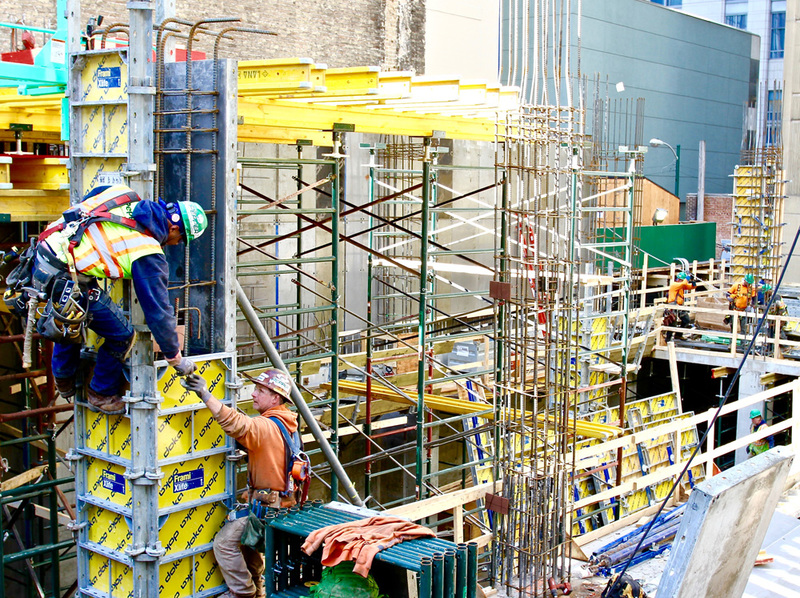 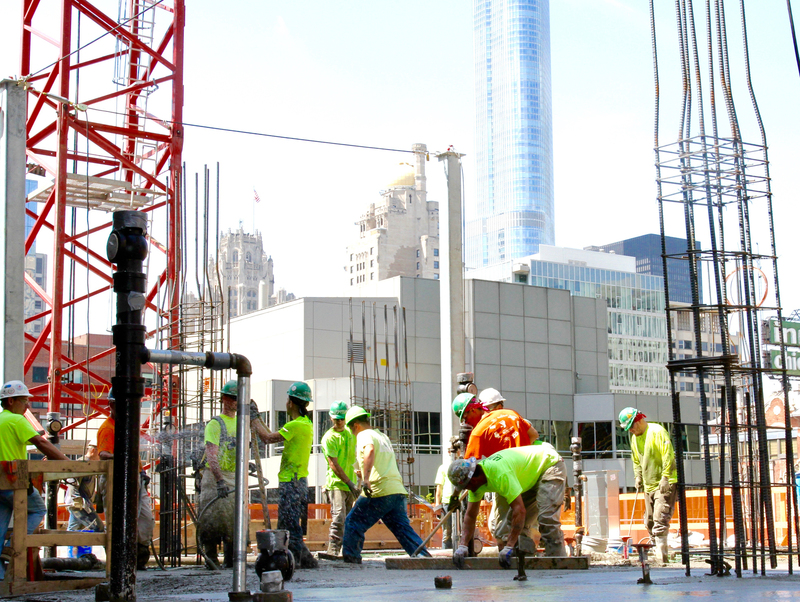 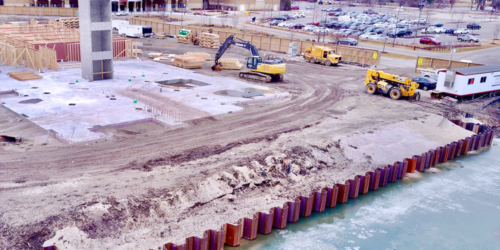 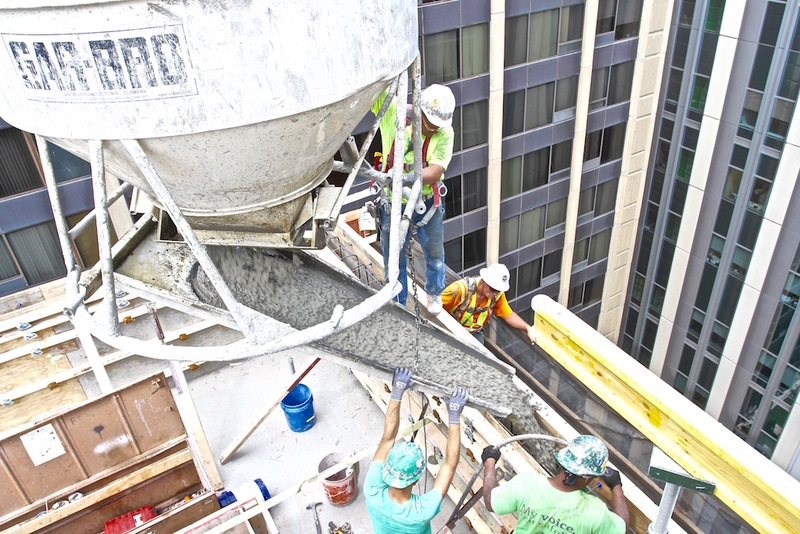 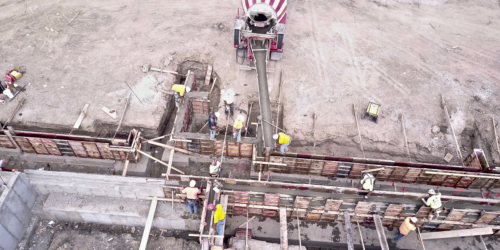 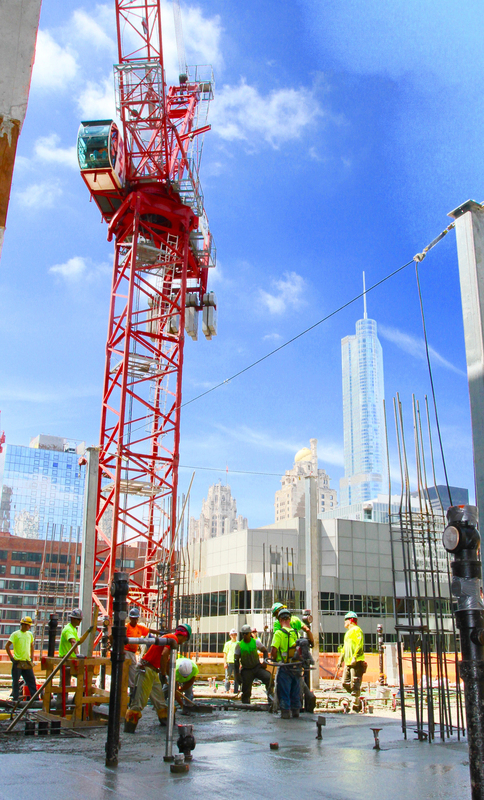 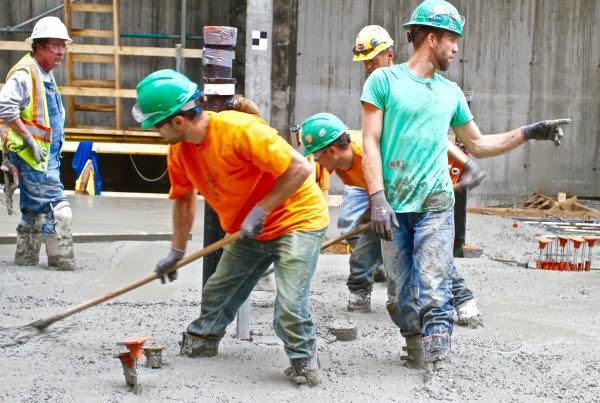 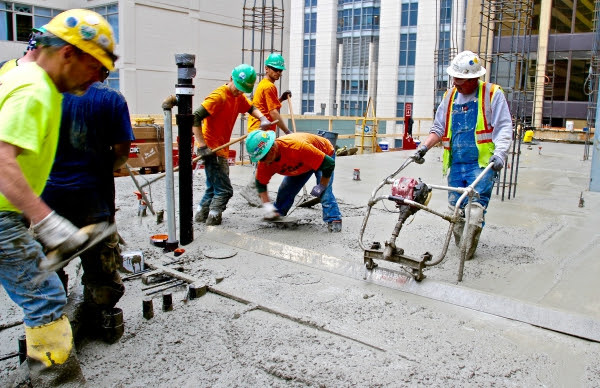 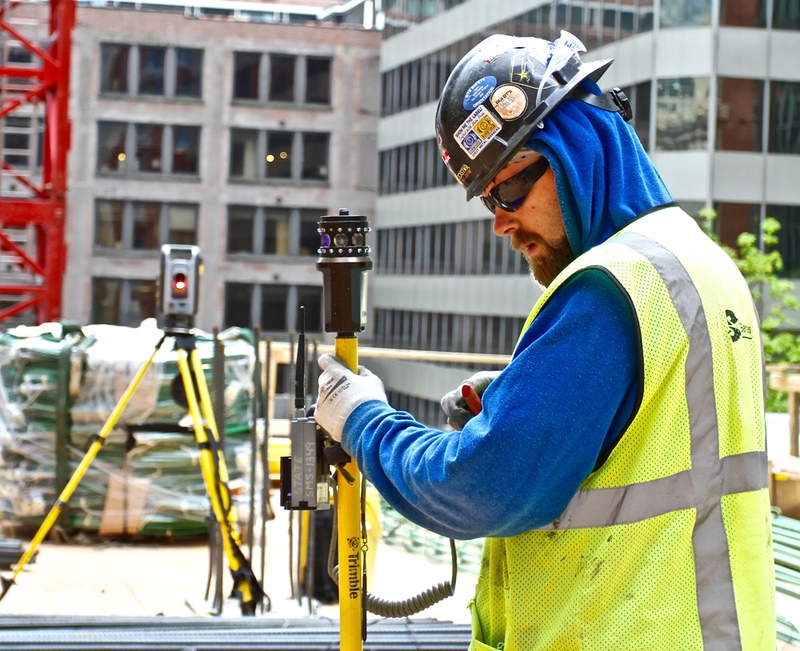 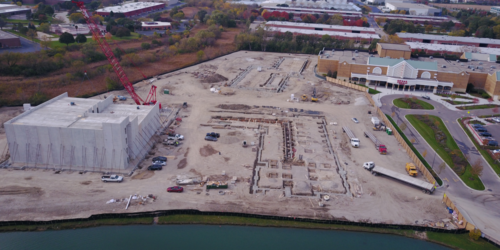 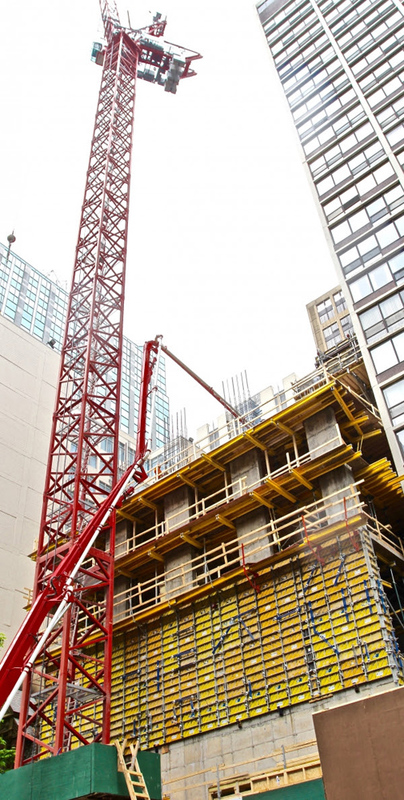 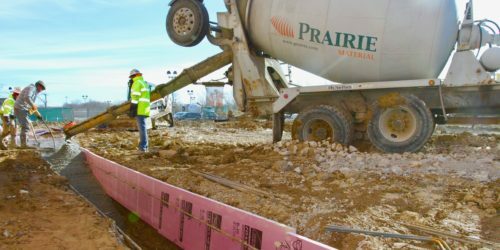 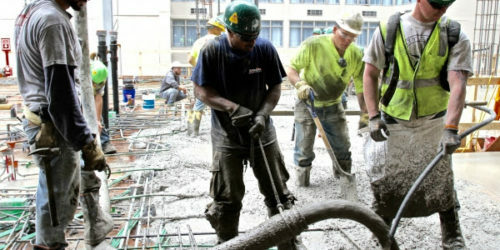 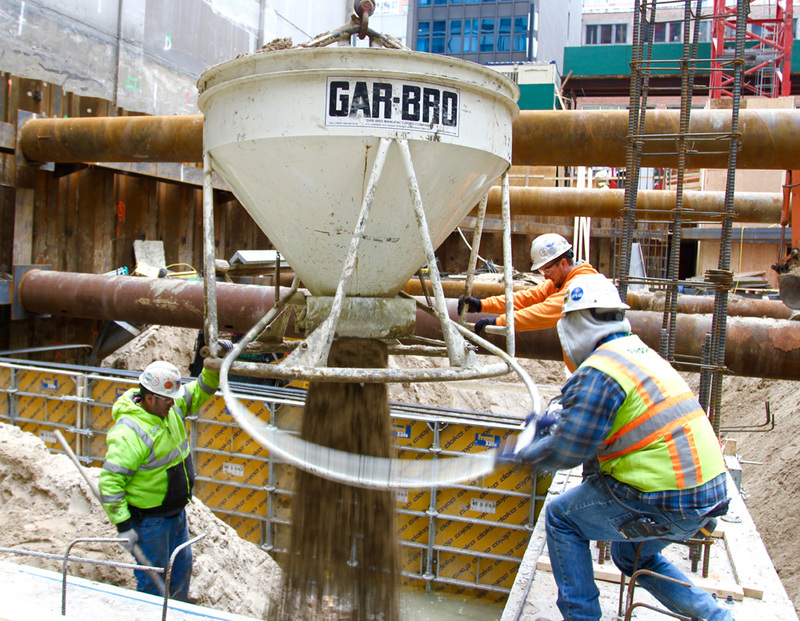 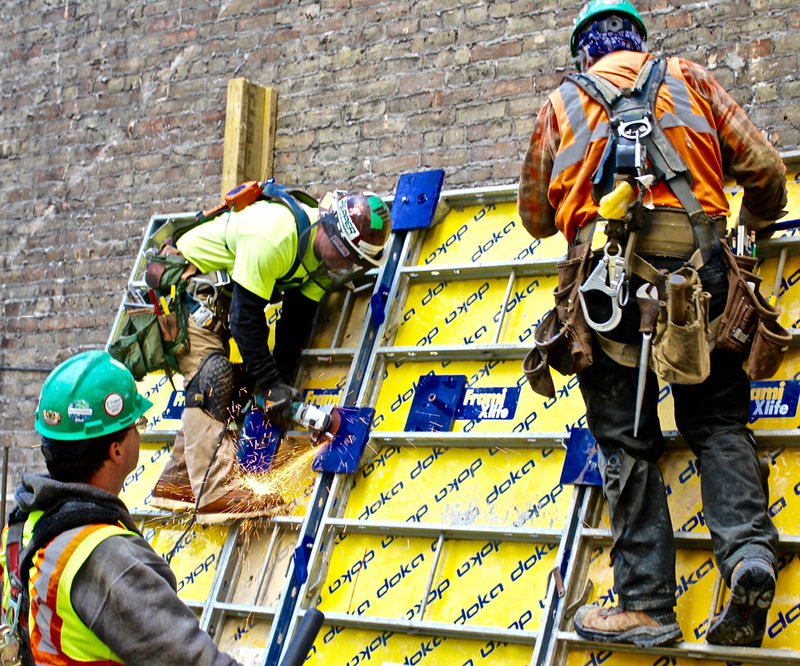 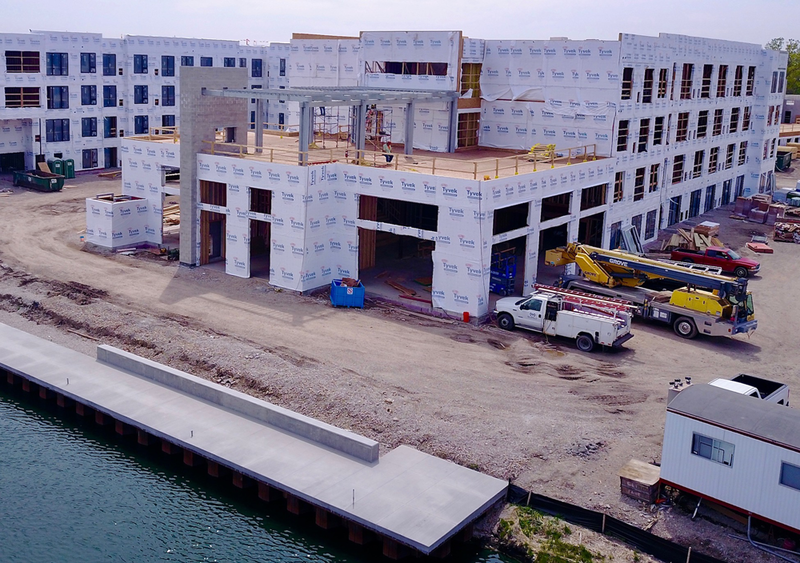 Pouring first floor concrete slab is a significant milestone for a Chicago construction project because it permits construction to proceed even during the dead of winter. 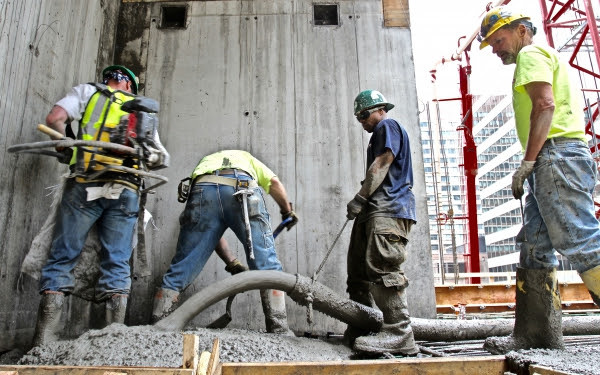 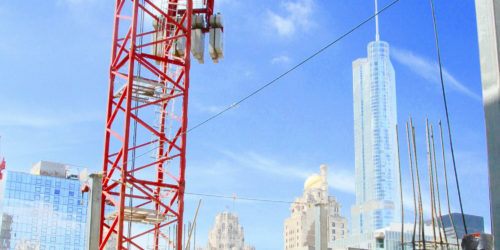 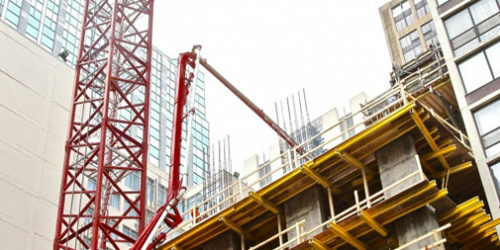 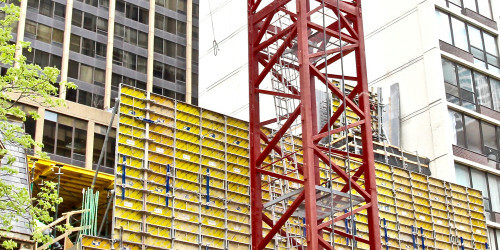 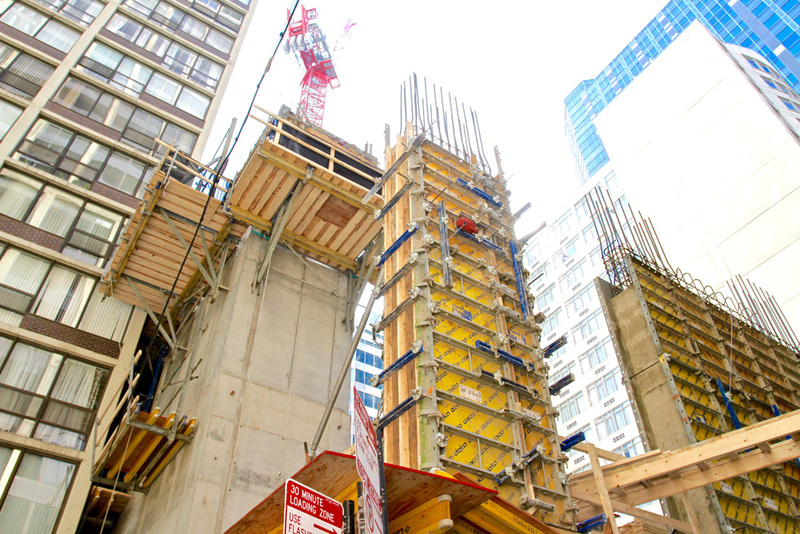 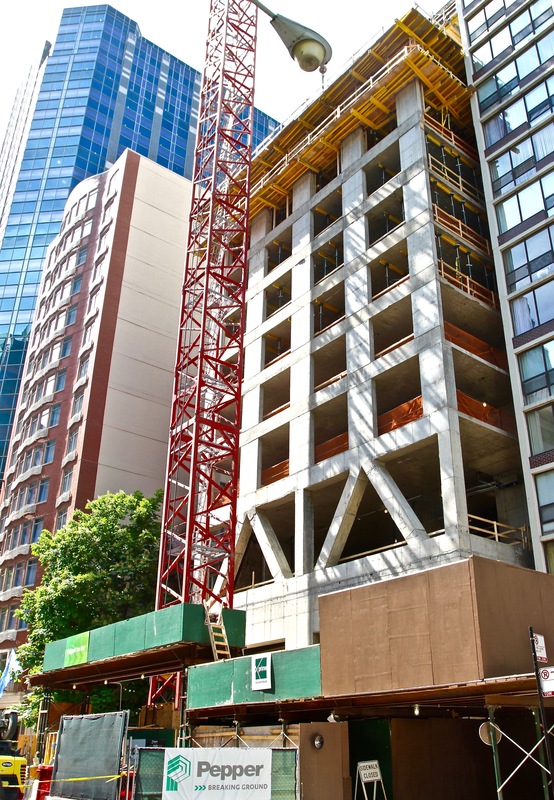 Therefore, on December 1, the 444 Social apartment project achieved a significant milestone by pouring its first section of concrete slab in the northern portion of the east building which sets the stage for the residential vertical construction to proceed even if the winter freeze sets in. 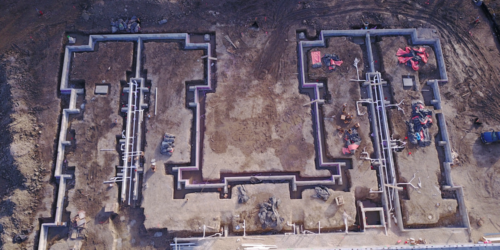 Also notice, from the pictures below, the underground plumbing and electrical piping has been installed in the other sections of the east building so it is now soon possible for the contractor to pour the concrete slab in the remainder of the east residential building. 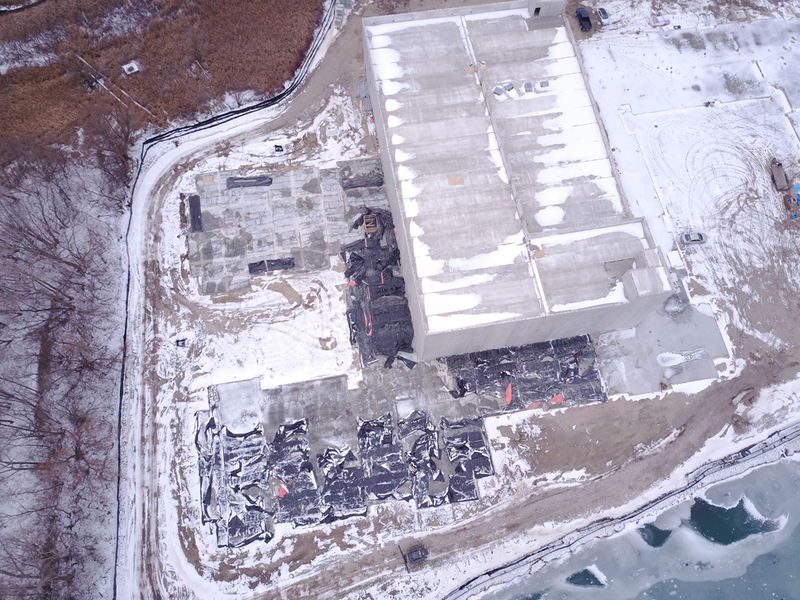 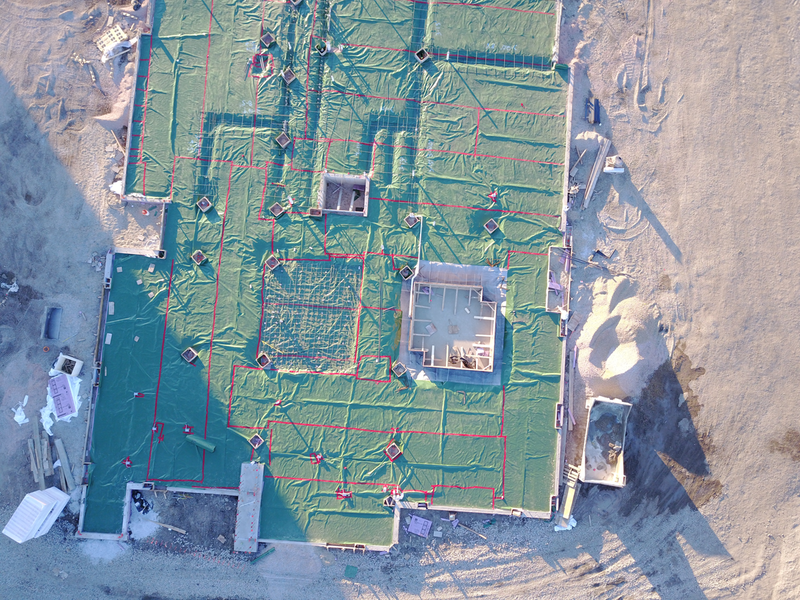 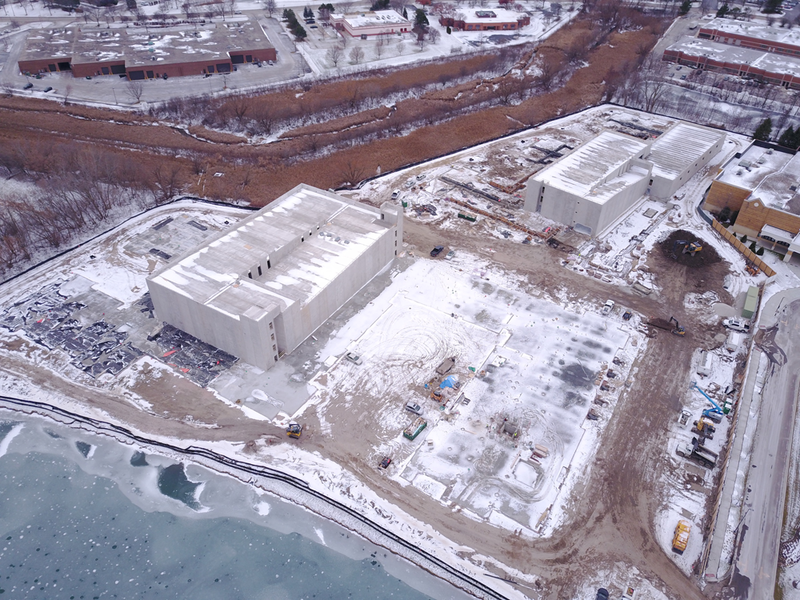 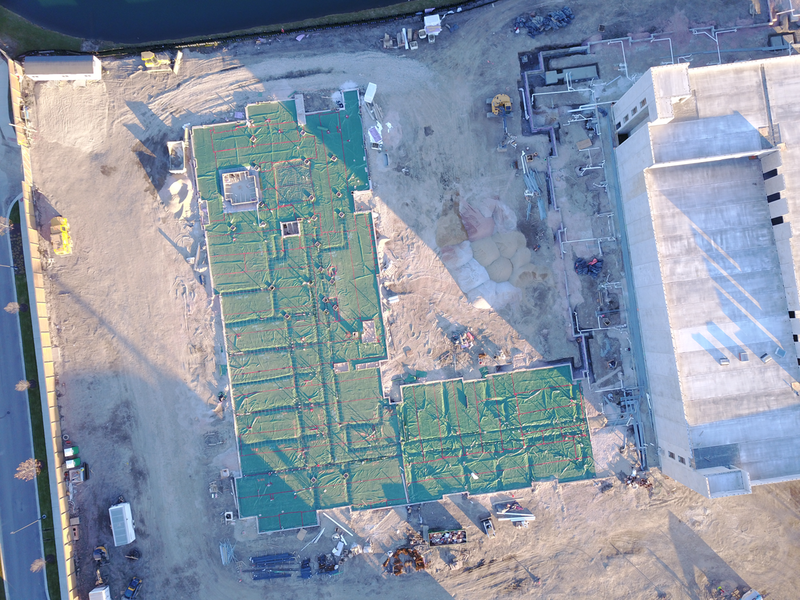 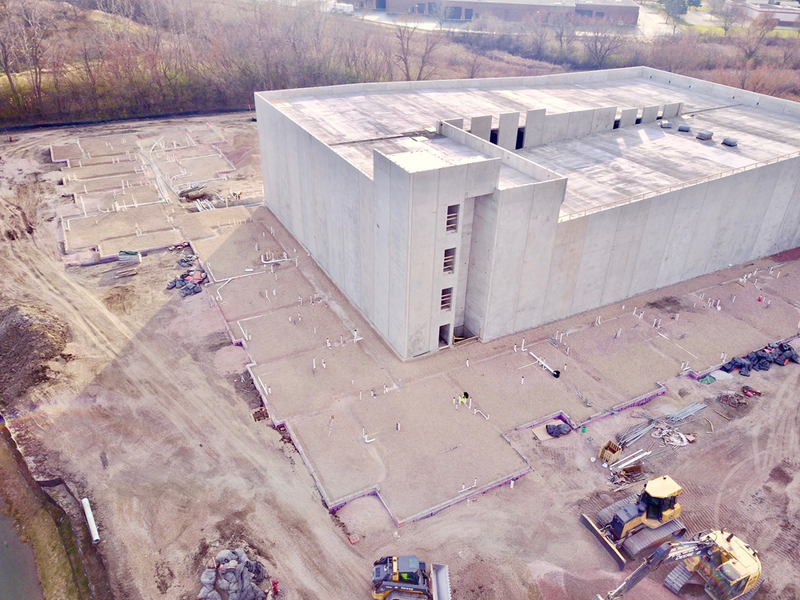 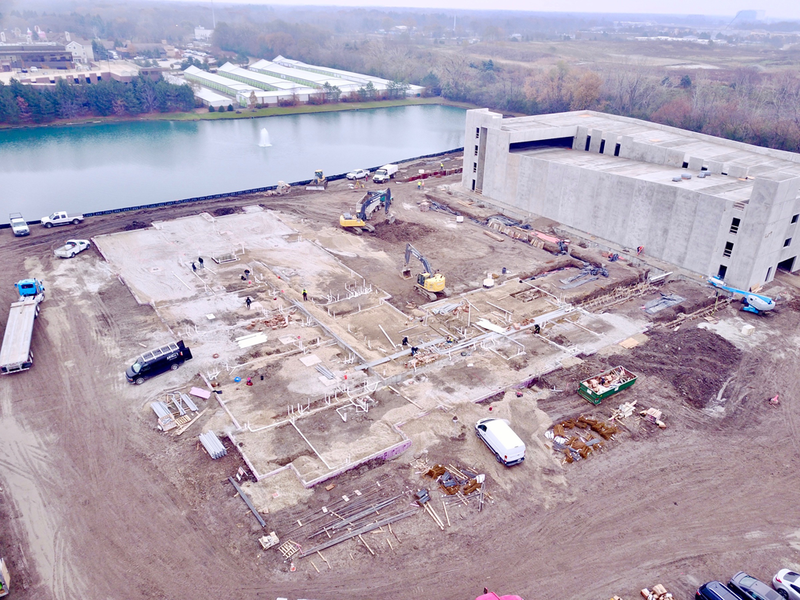 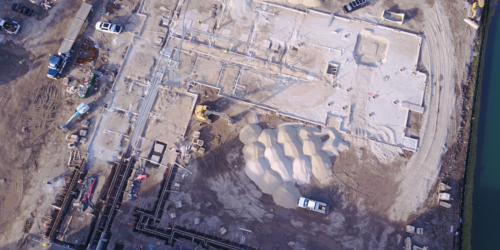 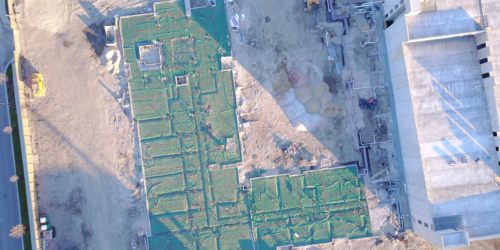 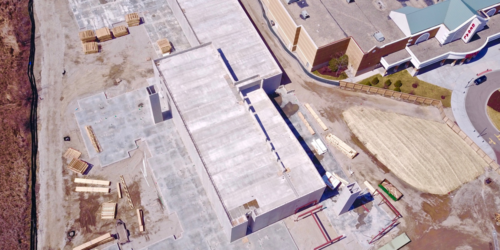 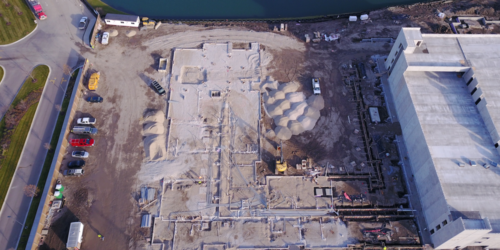 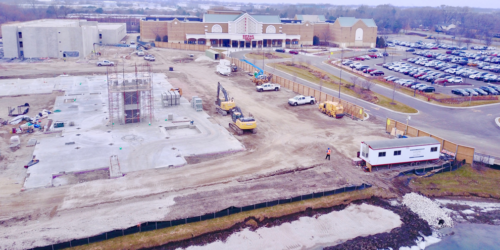 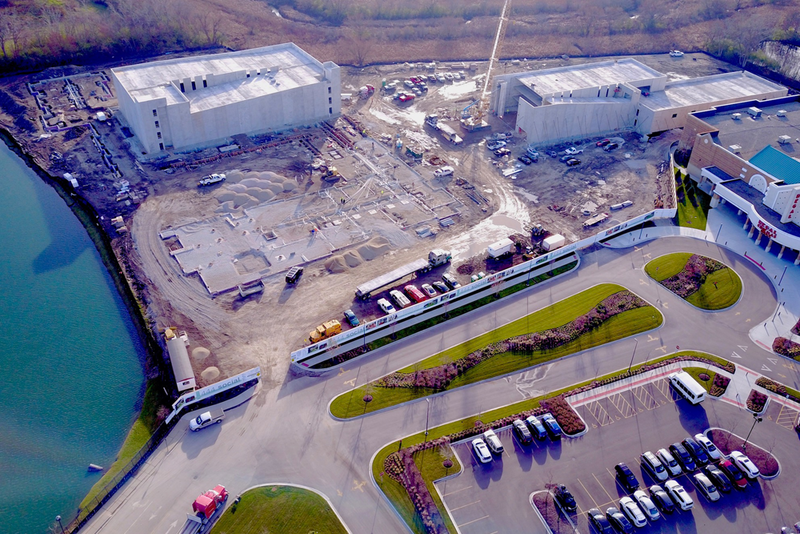 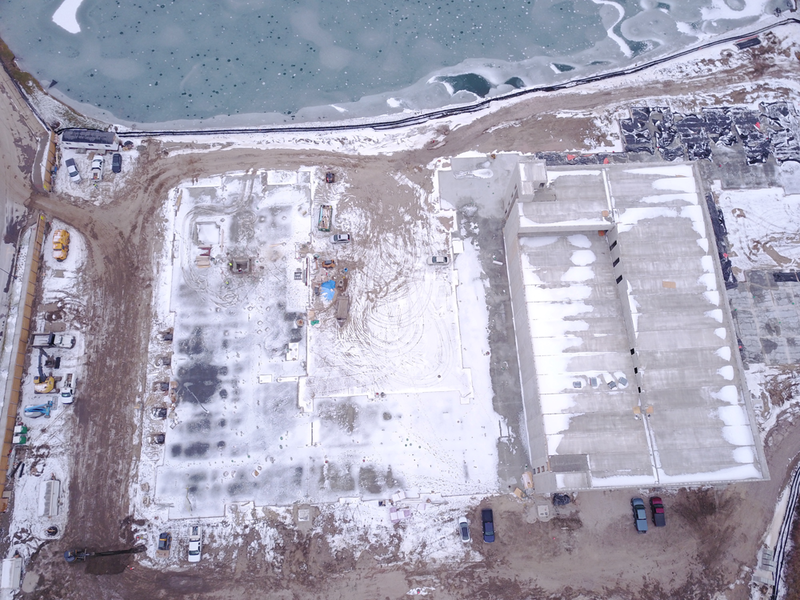 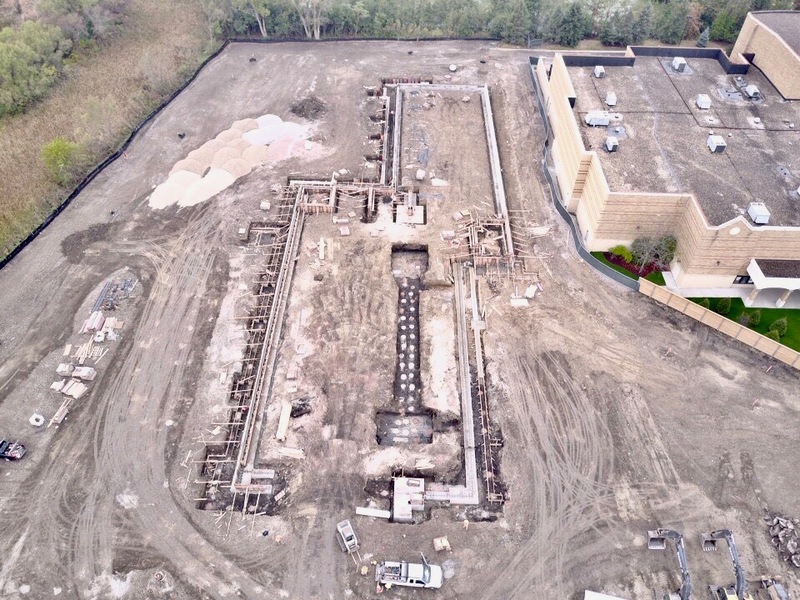 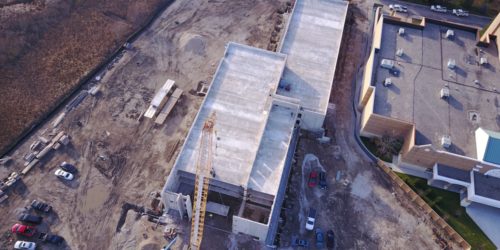 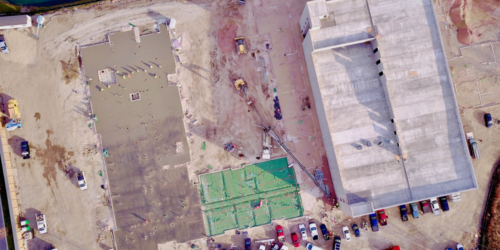 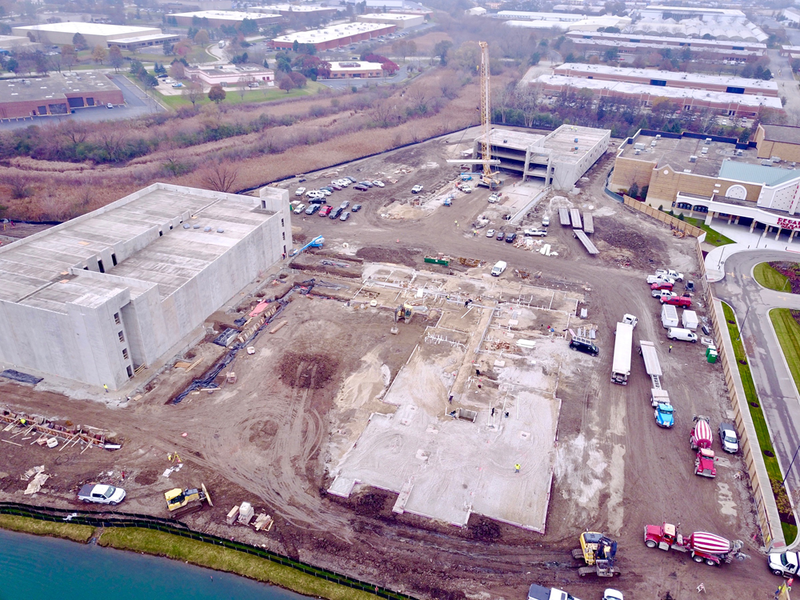 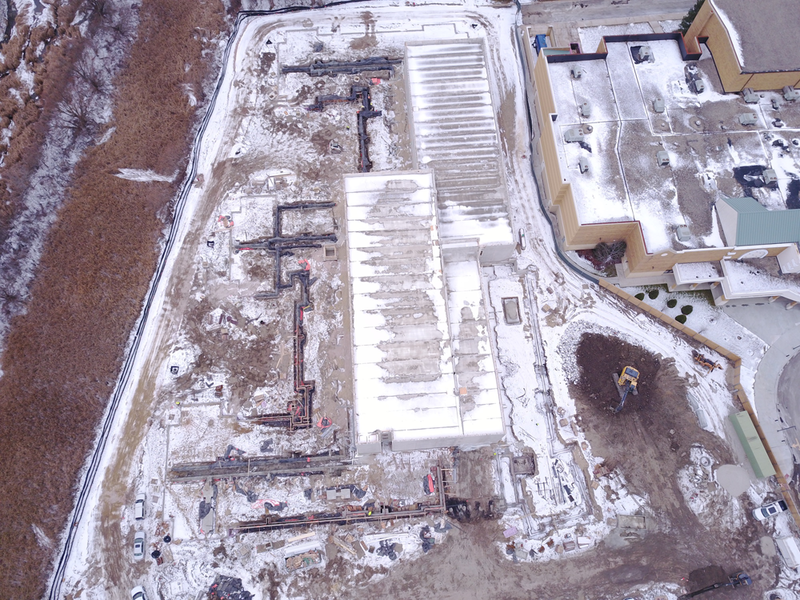 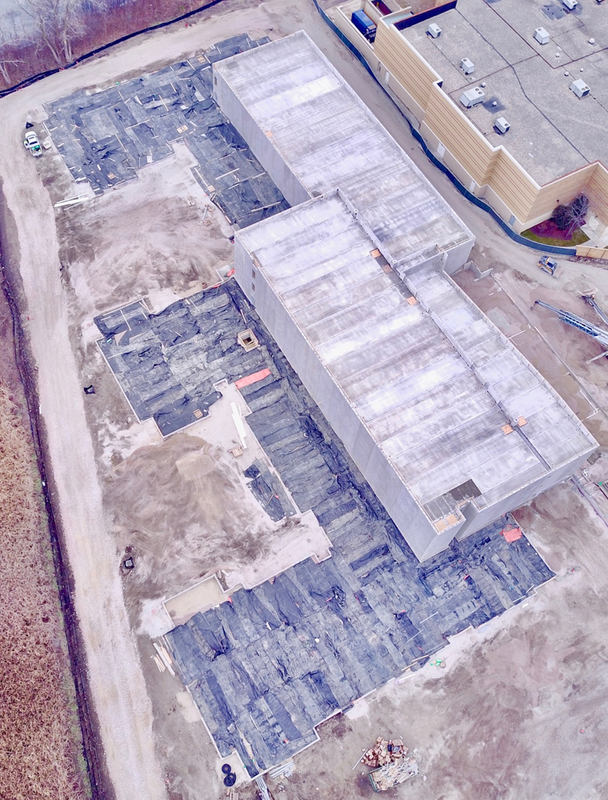 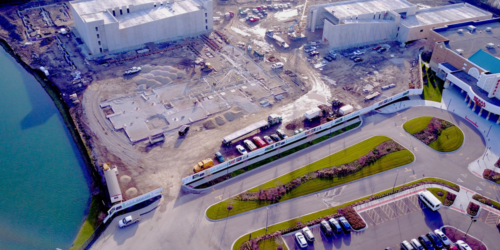 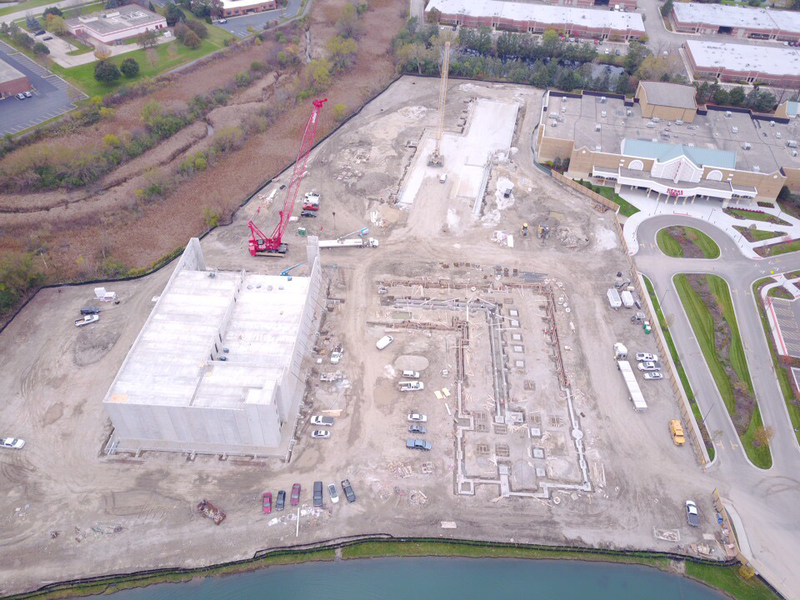 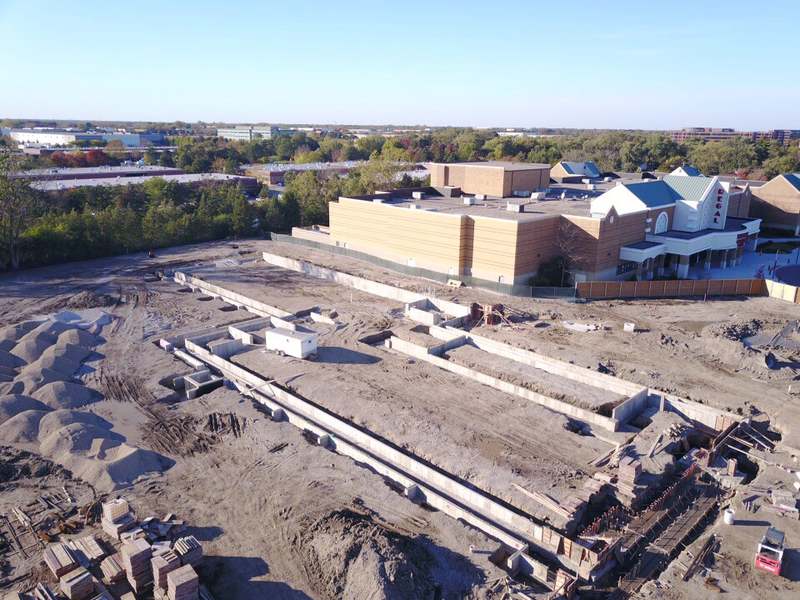 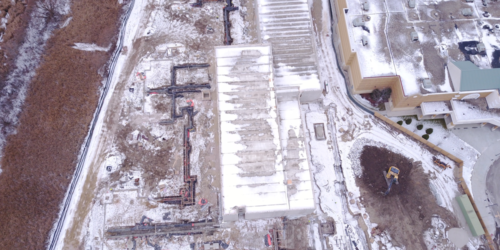 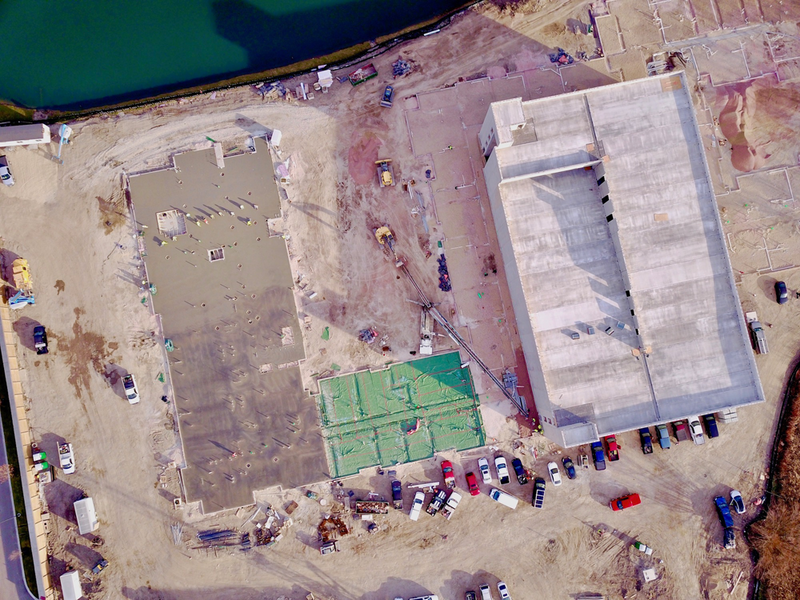 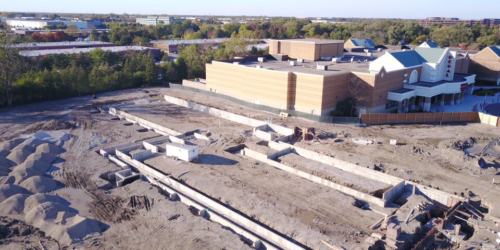 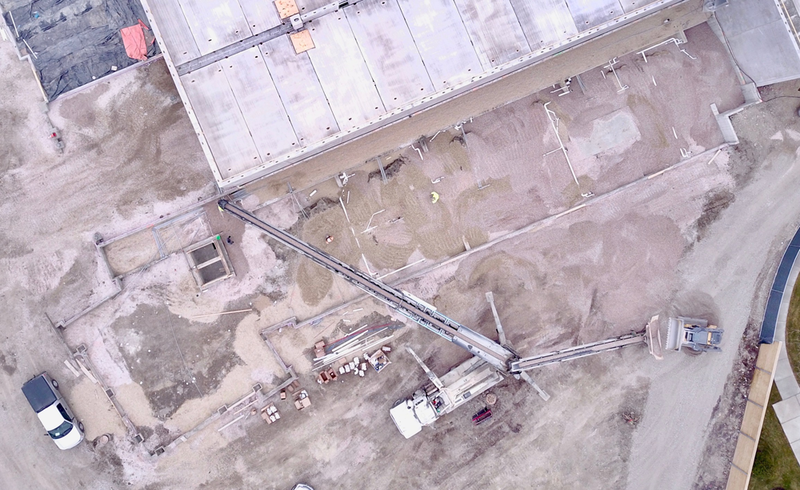 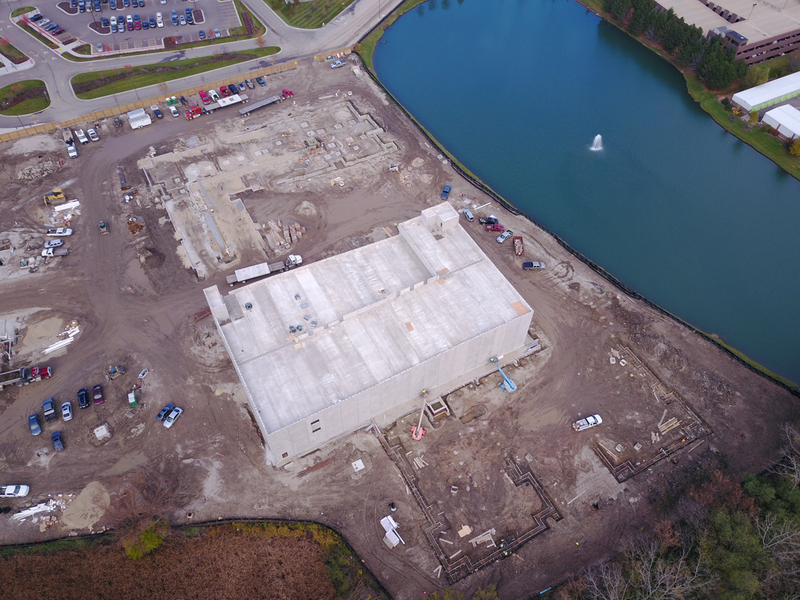 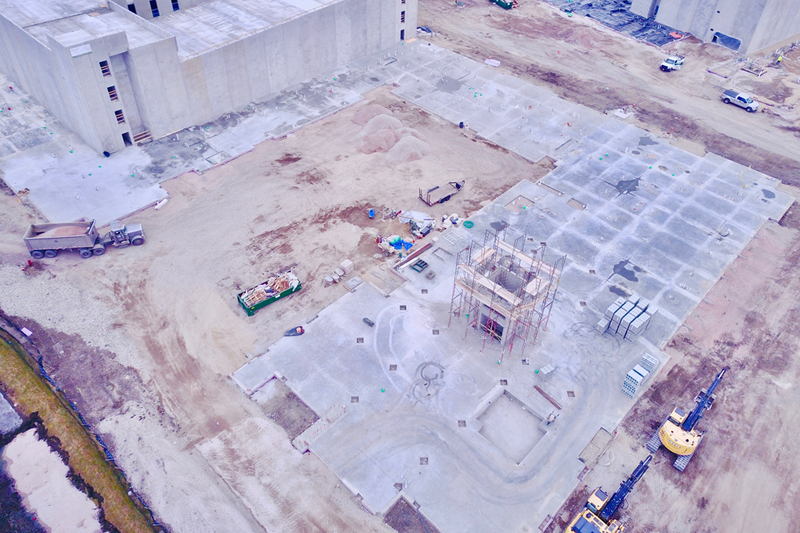 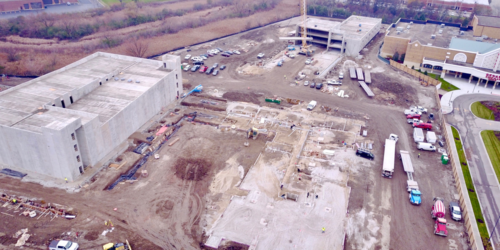 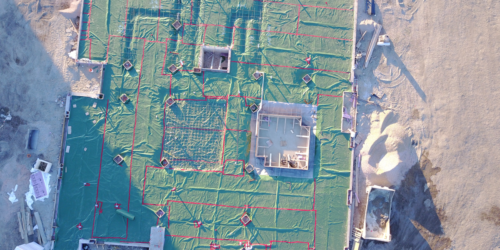 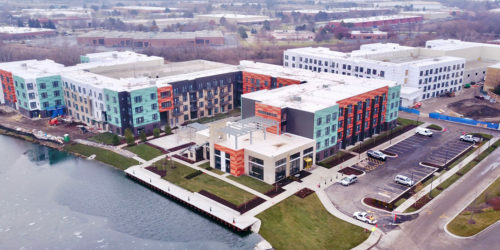 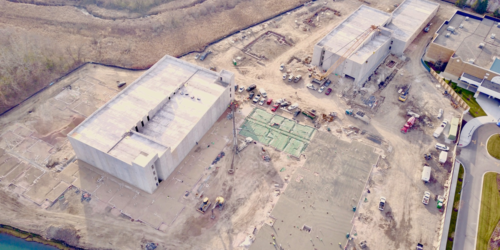 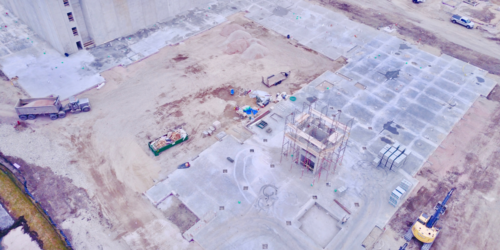 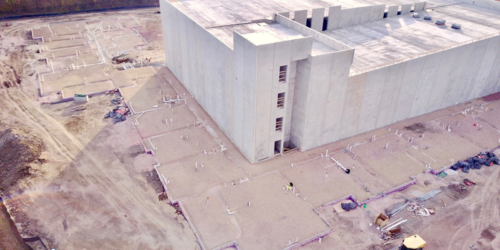 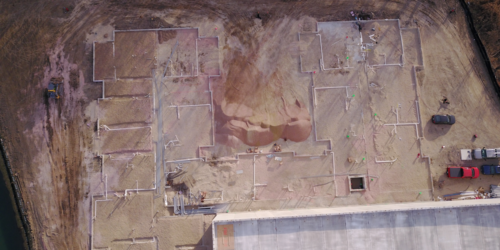 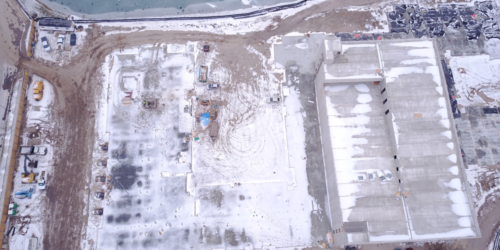 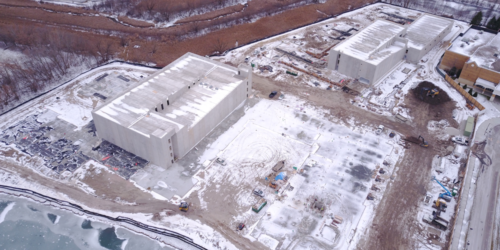 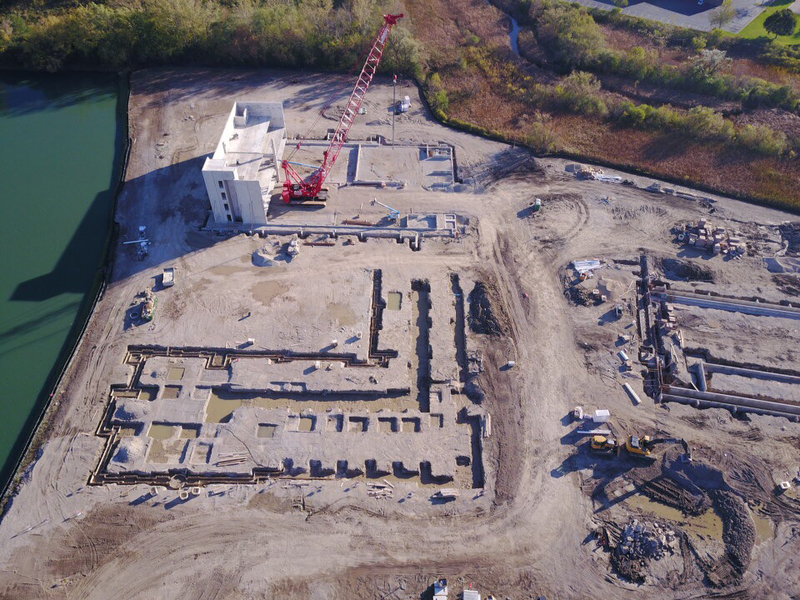 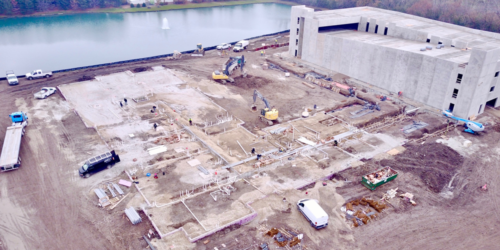 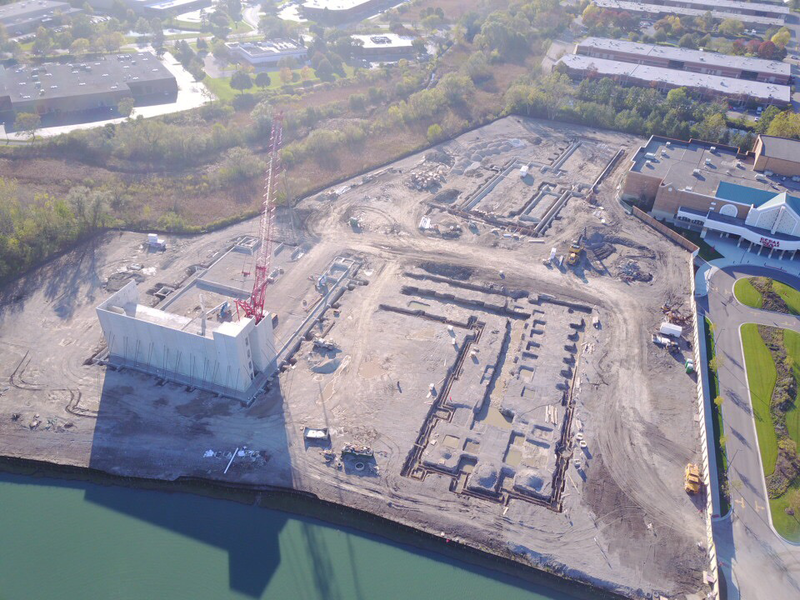 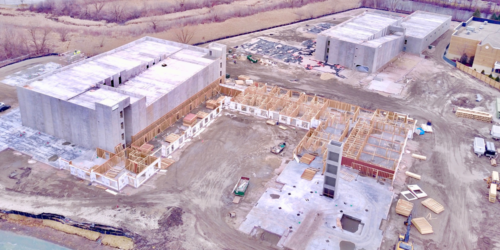 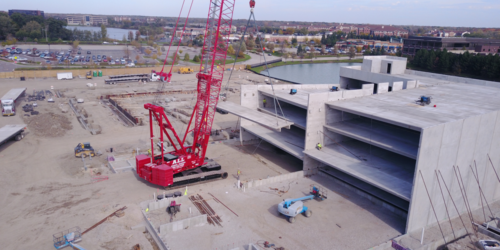 Also, notice in the December 1st drone photos, the underground foundations are being install on the west building and the both precast concrete parking garages are now complete. 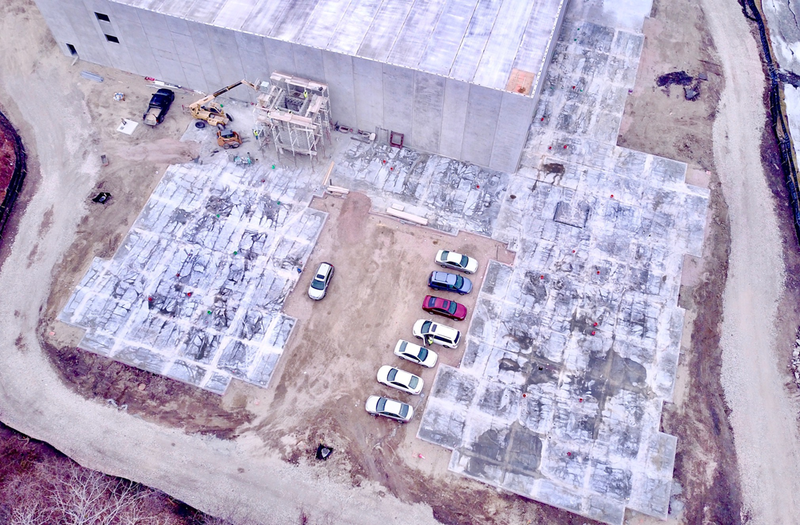 West garage pre-cast panels nearly all complete. 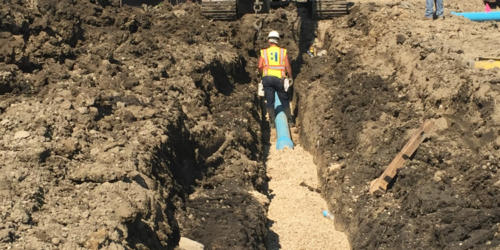 Completing underground electrical conduit piping prior to pouring concrete slab in the northern portion of the eastern residential building. 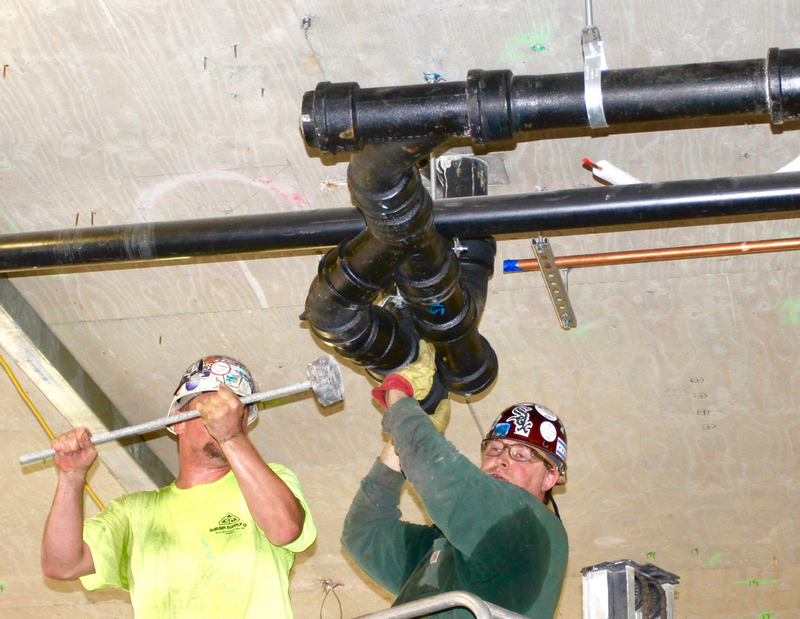 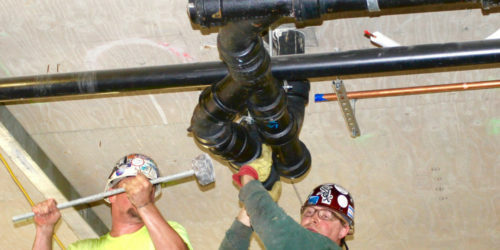 Commenced plumbing central piping system in the southern portion of the eastern residential building. 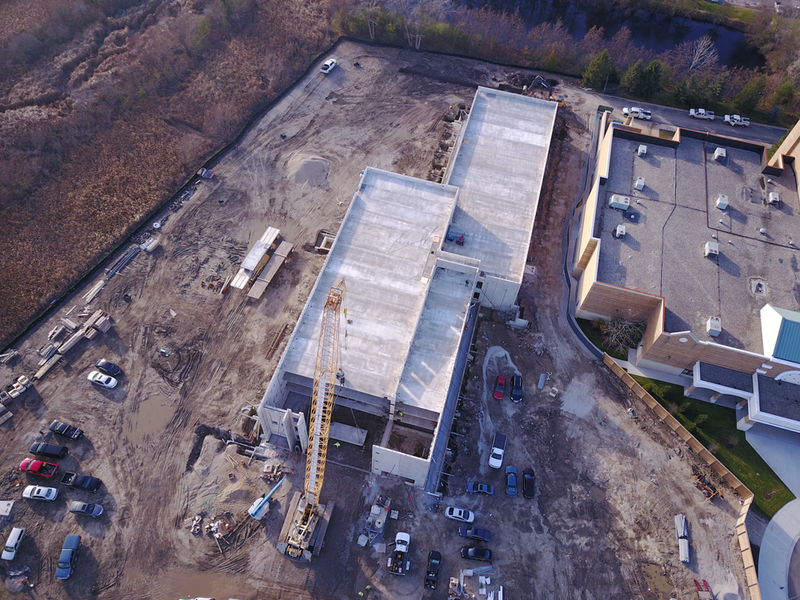 Good progress this past week with construction since I sent the last photo update. 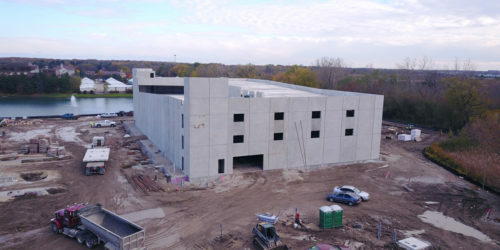 Completion of precast panels for east parking garage building. 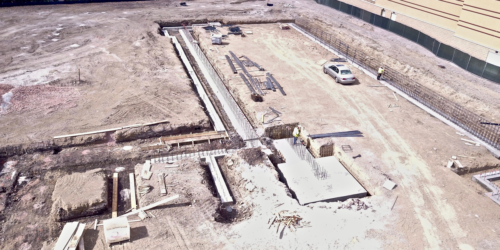 Completion of concrete foundations and concrete stem walls for north portion of east residential building. 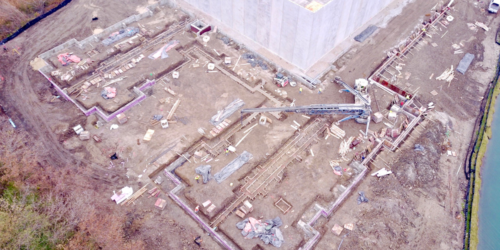 Commenced placing backfill on north portion of east residential building and placing underground plumbing and electrical piping below slab of east residential building. 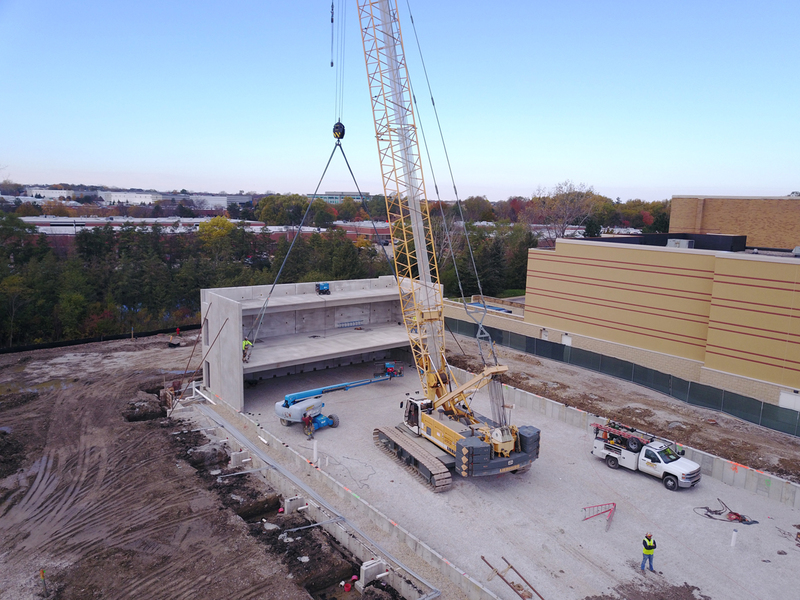 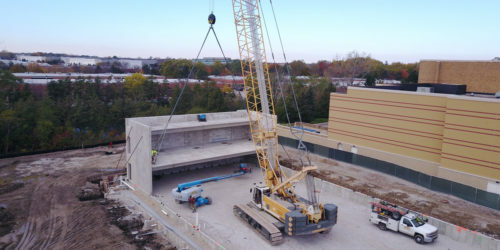 Commenced setting precast panels in the west building parking garage. 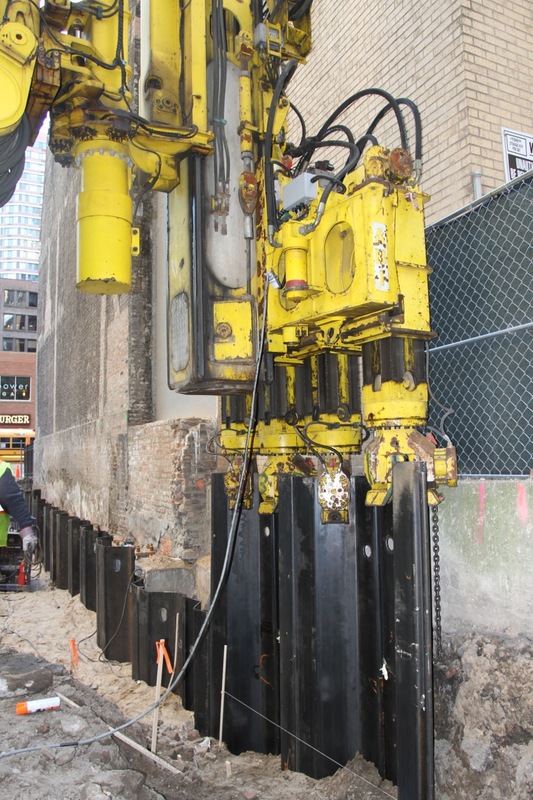 Cut foundations trenches on the south portion of the east residential building. 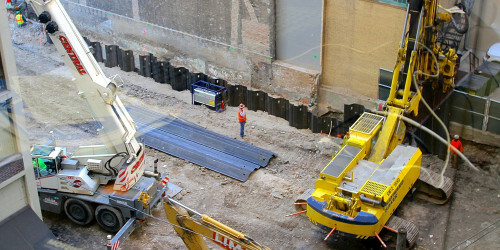 We have also starting building the foundation forms inside these newly cut foundations. 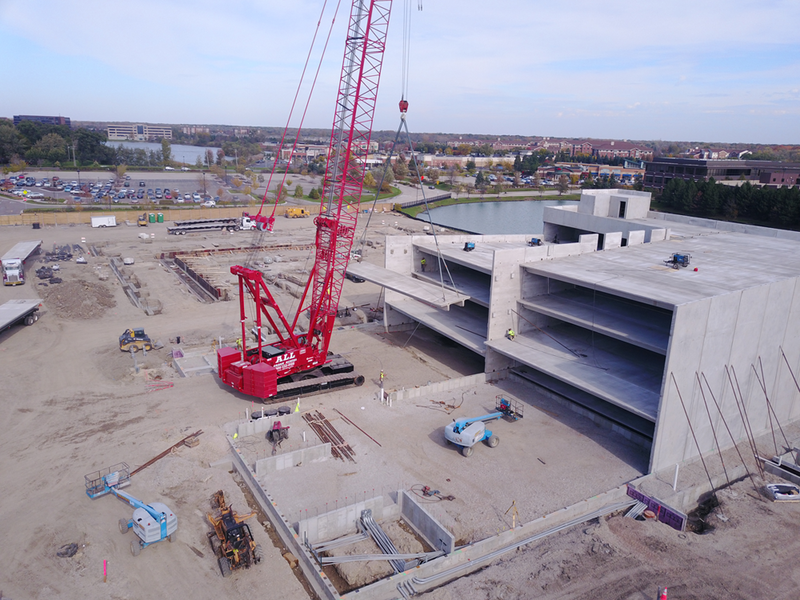 Despite several days of rainy weather last week, good progress with erection east garage and second crane arrived to begin erection of west garage by Thursday. 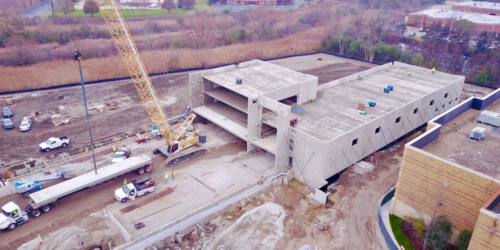 It is expected the last panels for east garage will be completed by Tuesday. 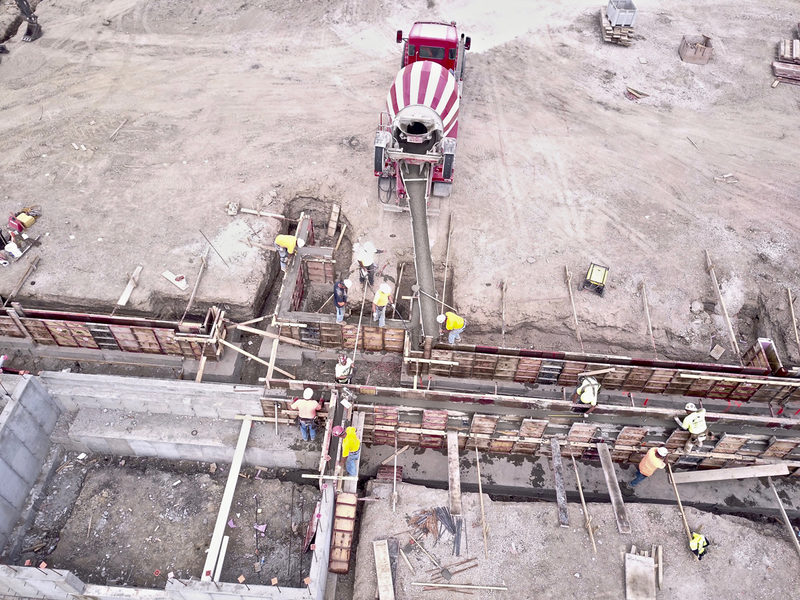 Continued good progress pouring north portion of the east residential building. 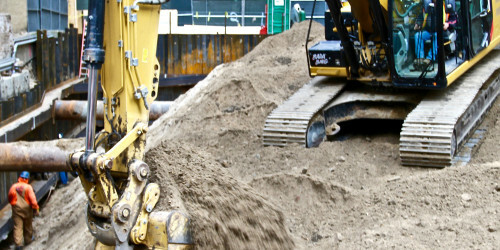 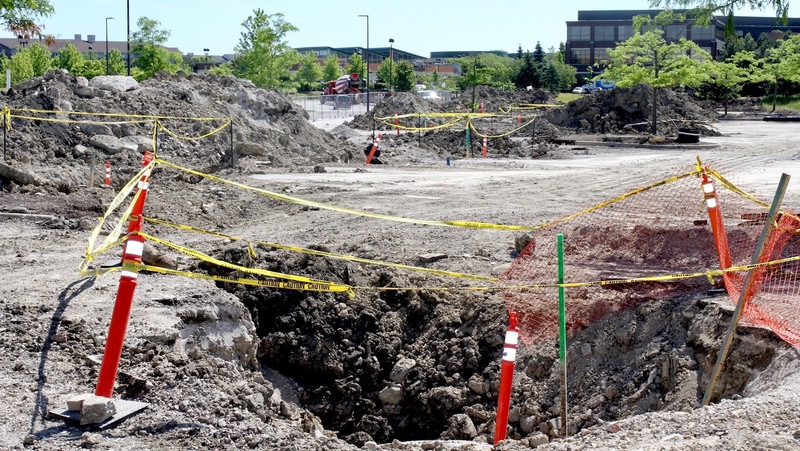 Continued good weather this past week has allowed construction to proceed smoothly. 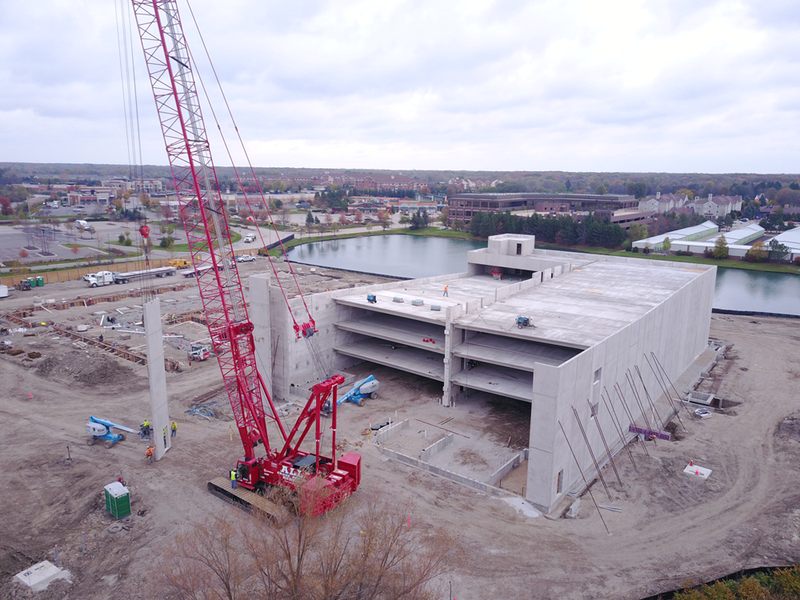 1) Since last week, you can see from photos, excellent progress for setting precast panels for much of the east parking garage. 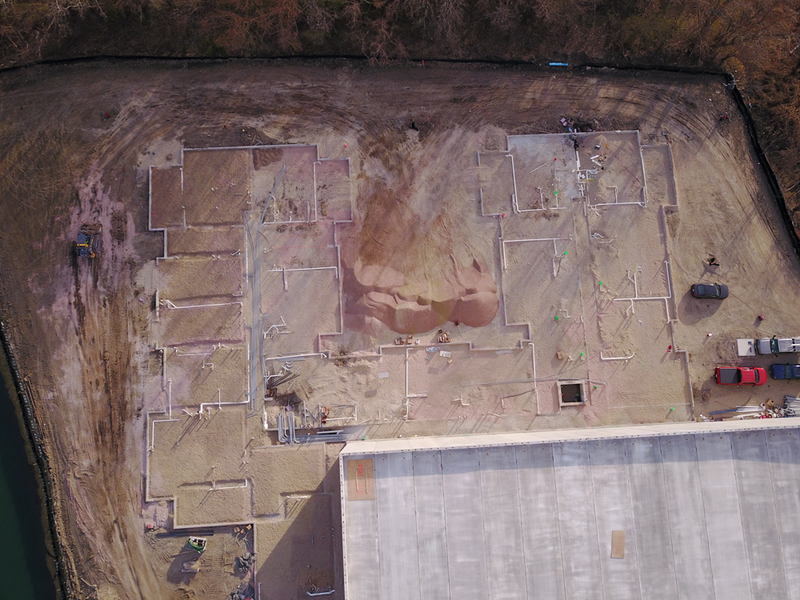 2) Foundations now complete for West Garage, making this pad ready for receive precast panels. 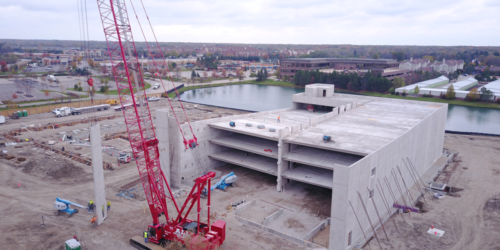 Crane will move to this location, once the east garage is complete. 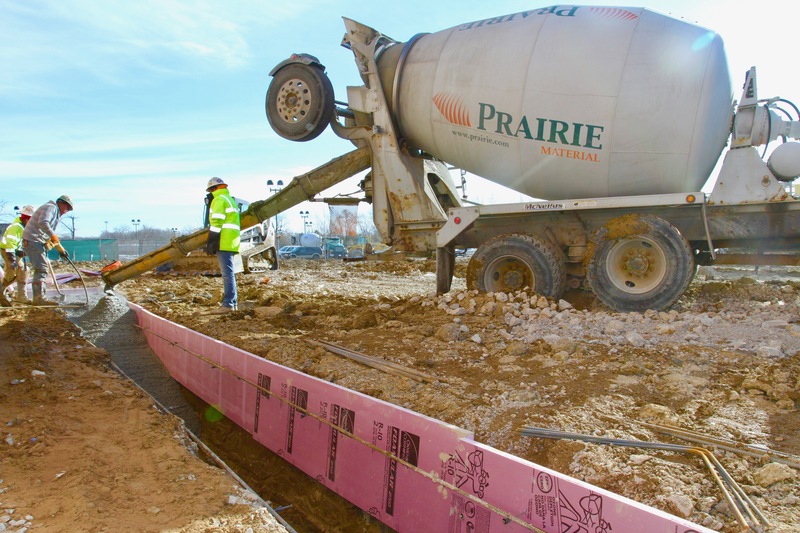 3) Poured foundations on the north portion of the the east Residential Building. 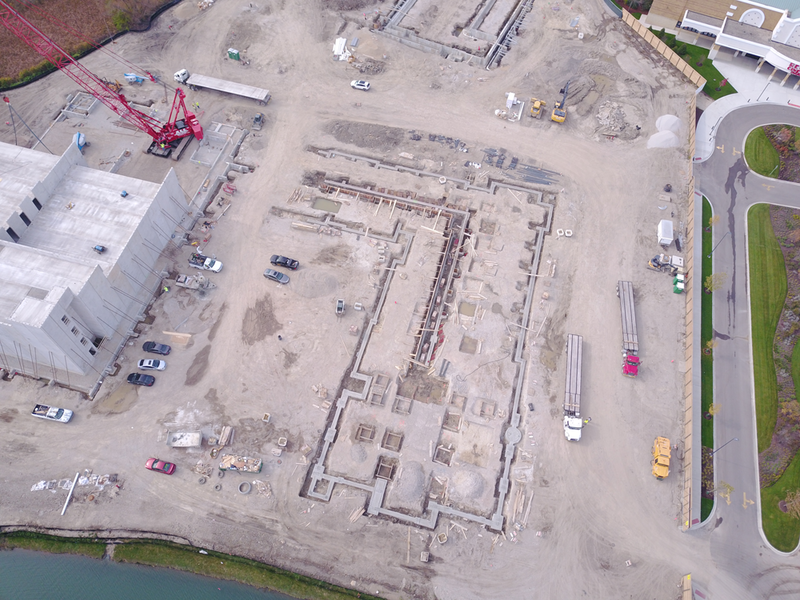 Drone photos at 444 Social. 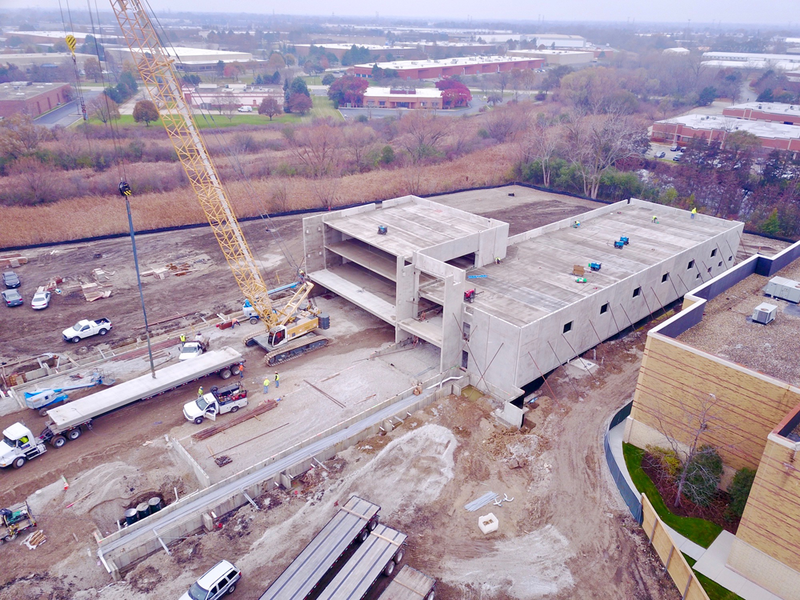 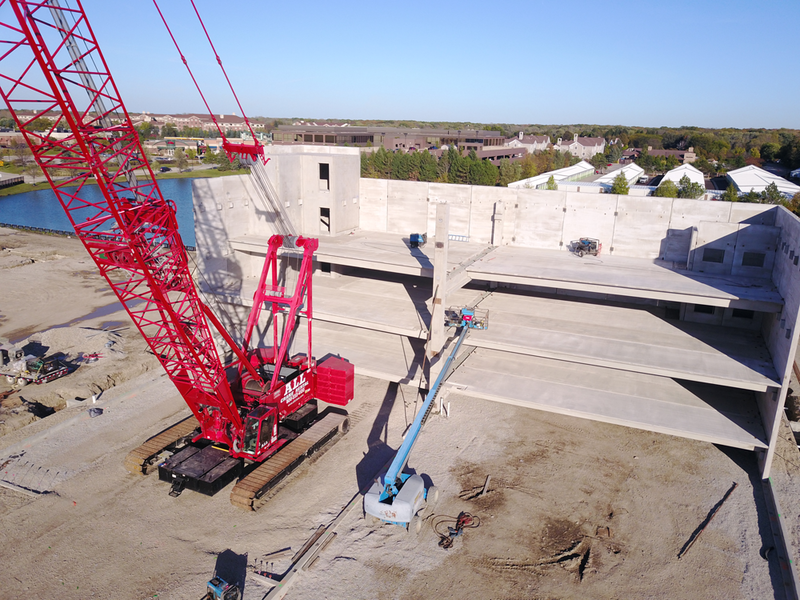 The precast panels are being laid into the parking deck and deck is built from back to front. 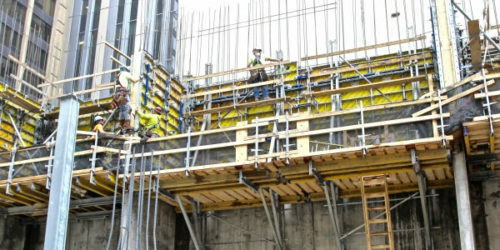 We will be setting 10-15 panels in the parking deck each day. 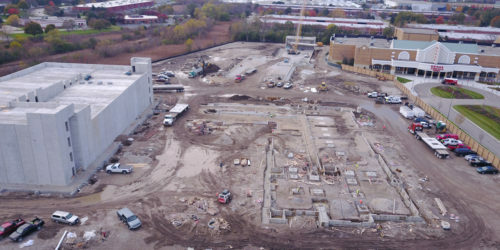 Also, you can see the excellent progress with both the foundations for the second parking deck and the first residential structures. 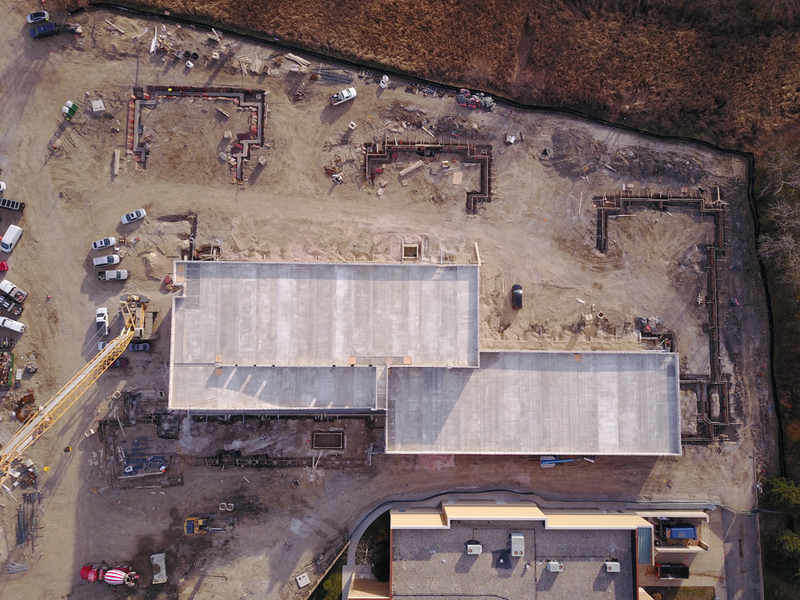 In the next day or so, we will be complete with pouring the west parking deck foundations and all concrete crews will be focused on pouring the residential foundations. 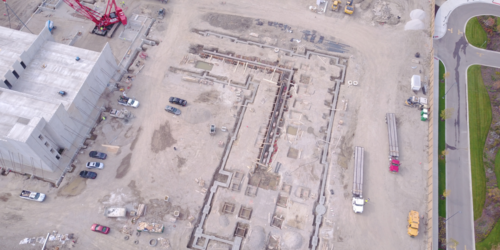 Please enjoy the short construction progress video taken today from a drone above our Lincolnshire apartment development. 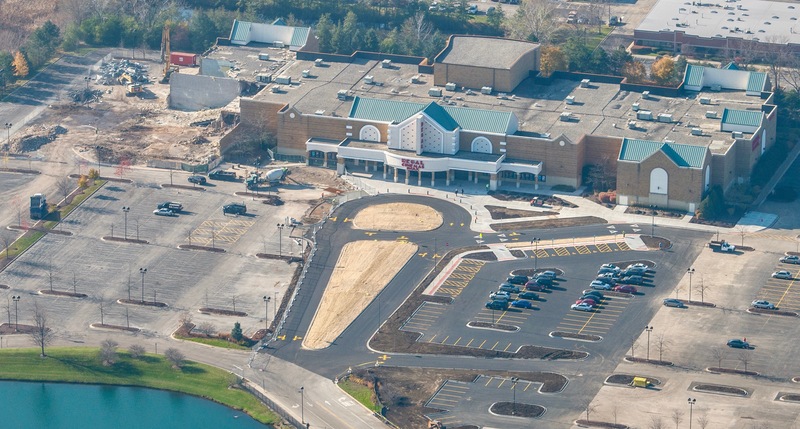 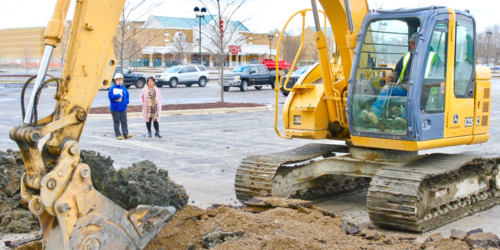 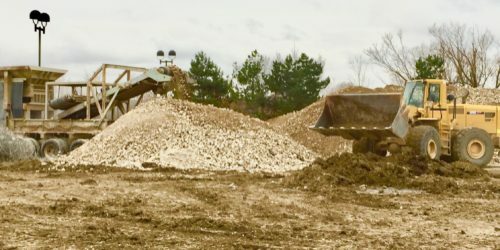 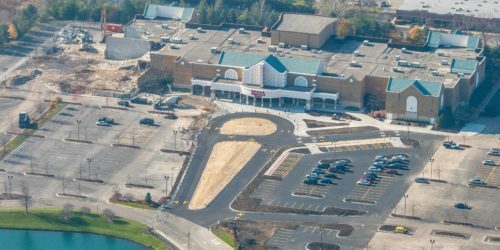 You will notice that the entire old southern Regal Parking lot has been completely removed and regraded. 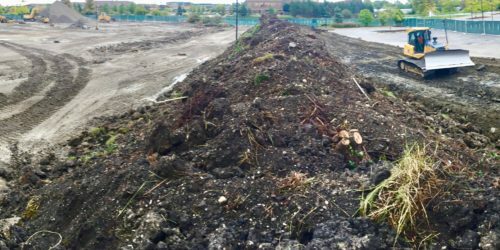 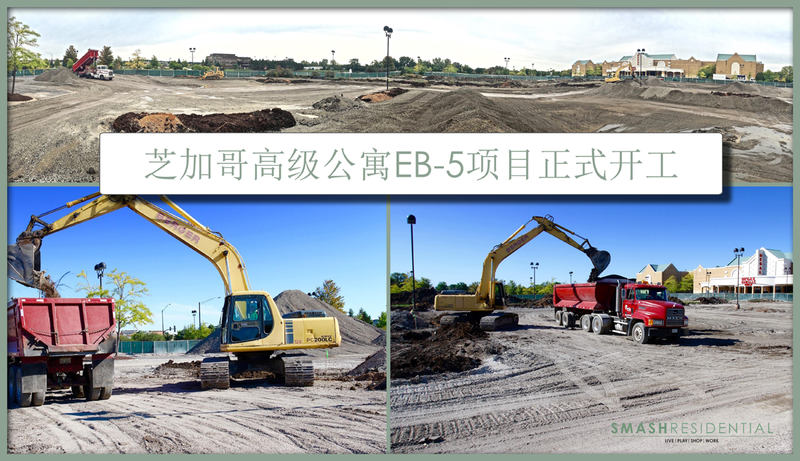 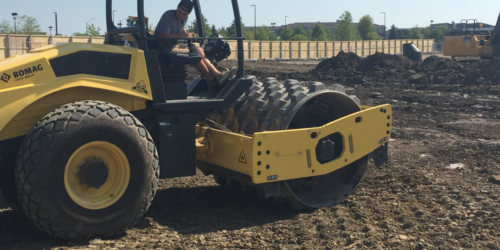 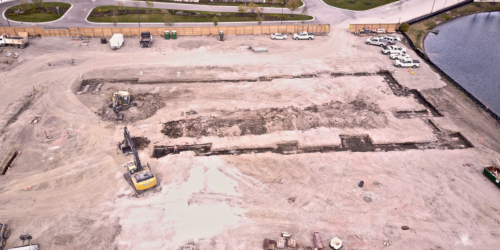 Our excavator has begun building all the site pads for the apartment buildings and the site pads for the two parking decks. 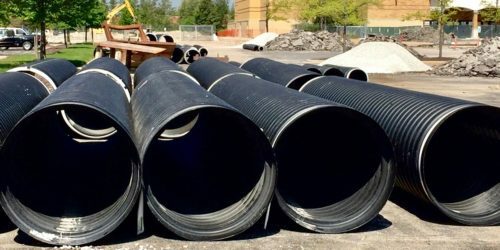 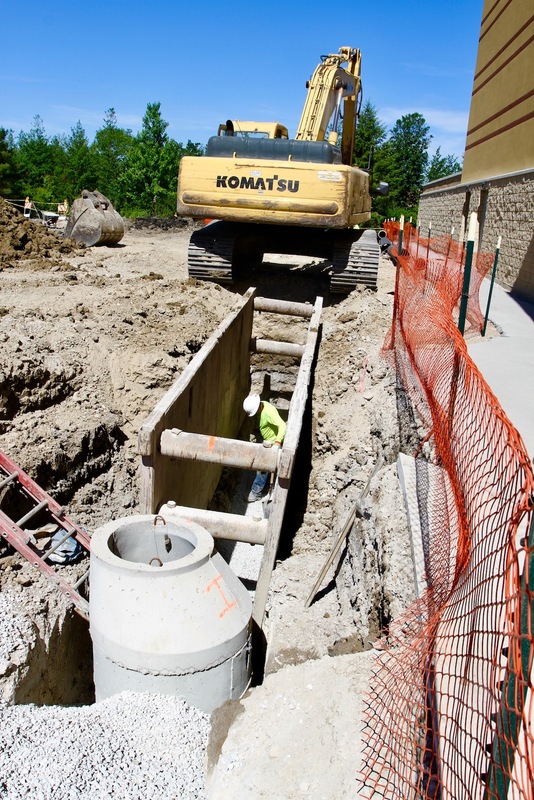 Much of the underground water, sanitary and sewer pipes for the new apartment property has already been installed. 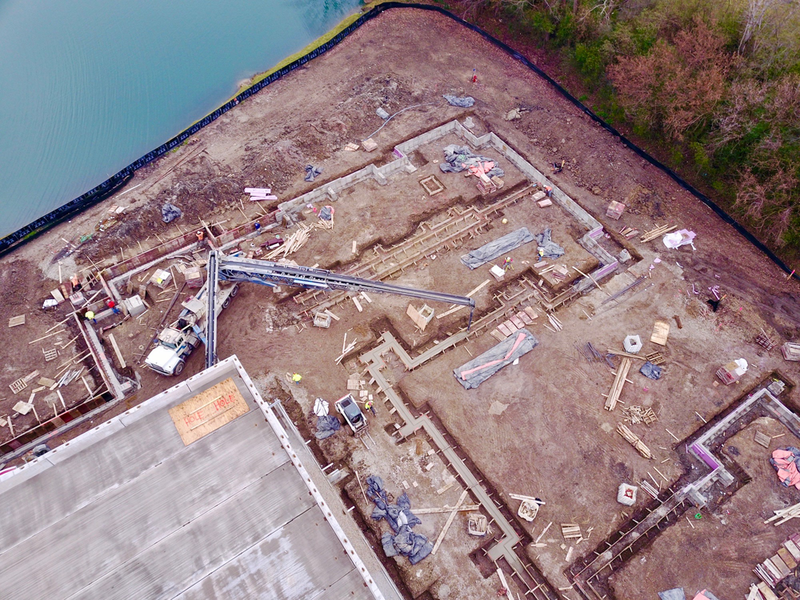 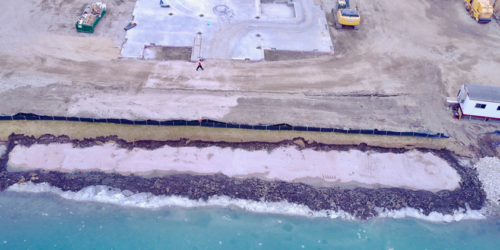 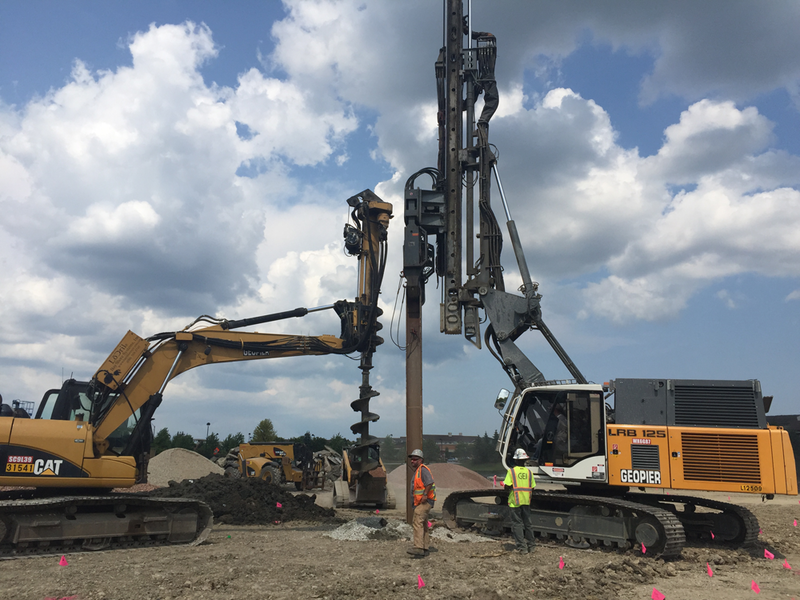 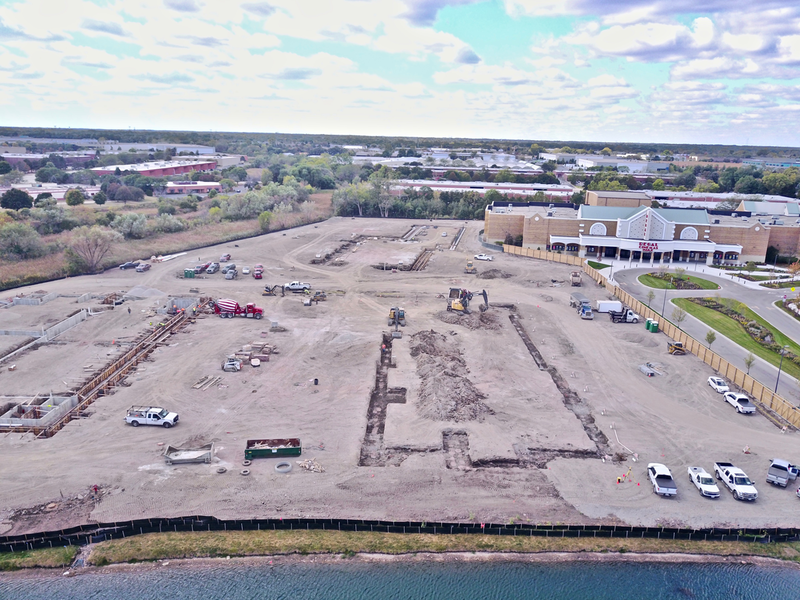 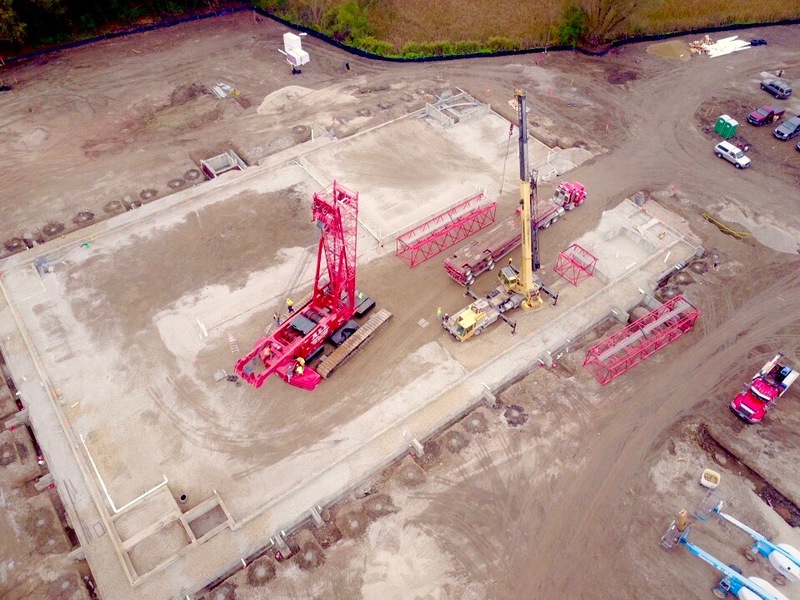 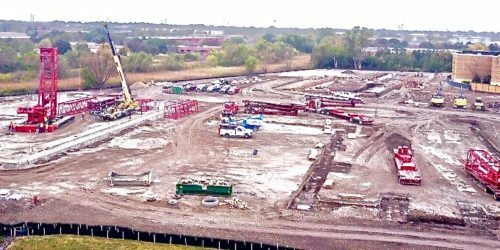 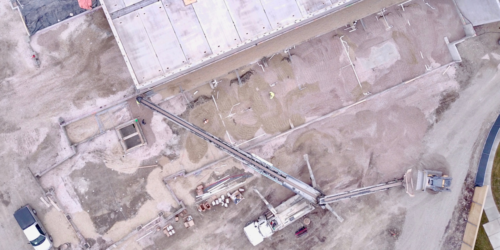 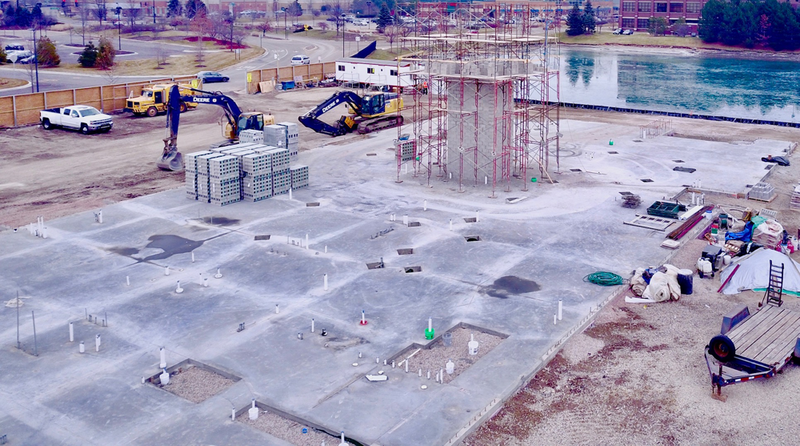 In addition, we have commenced installing the 1,300 “Geo Piers” which is the underground soil stabilization system that will support the spread foundations which will then be constructed immediately above the Geo Piers. 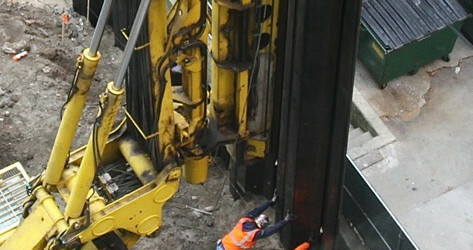 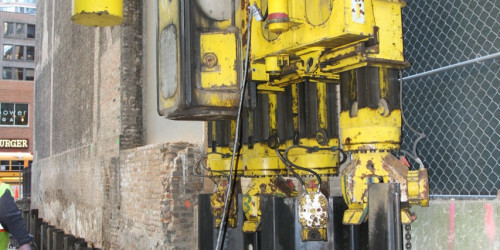 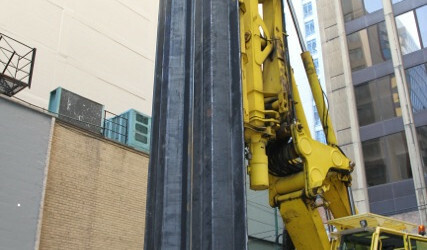 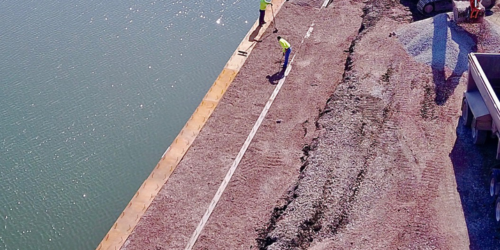 You can see a close up of one of the Geo Piers being installed in the still photograph attached to this e-mail. 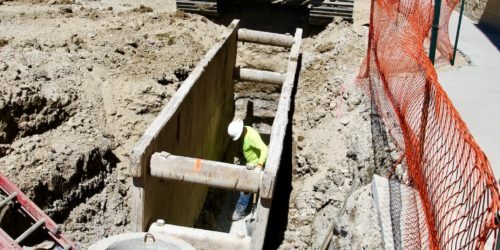 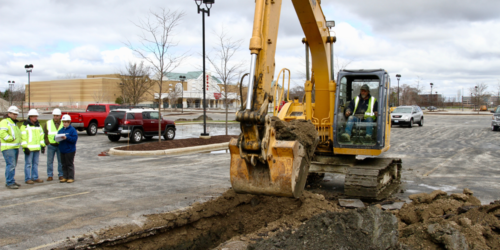 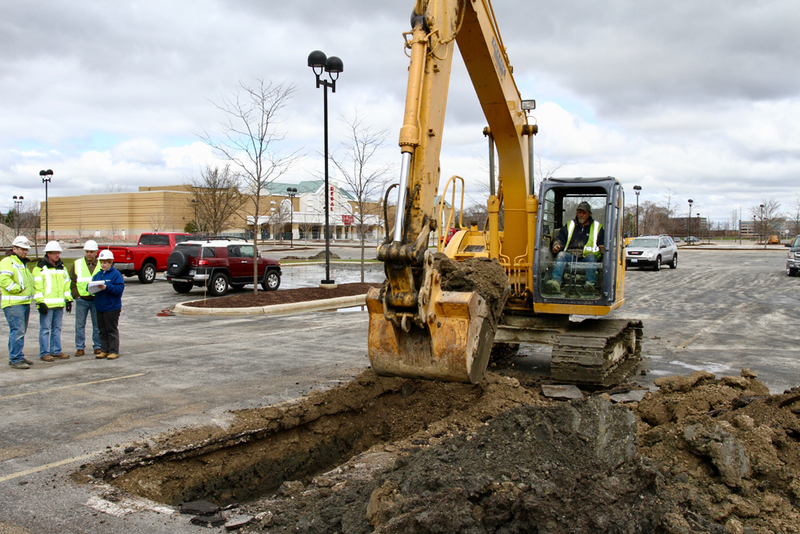 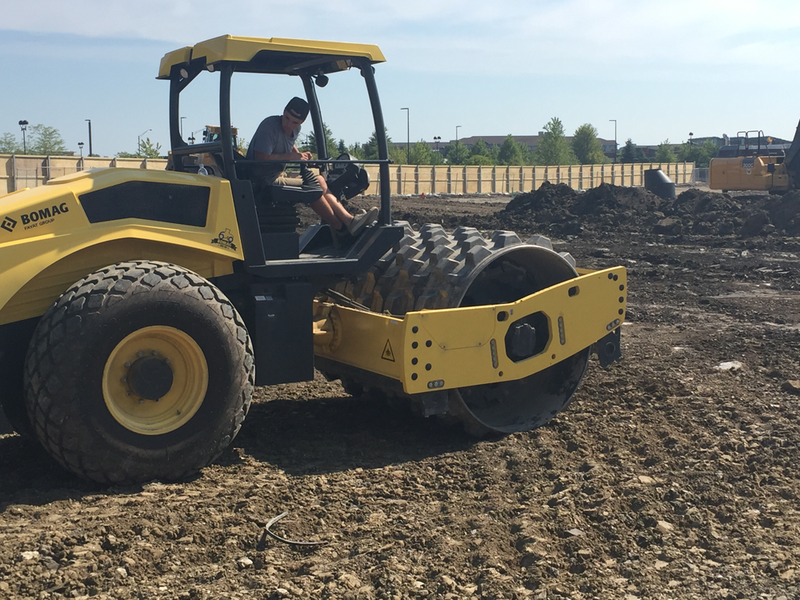 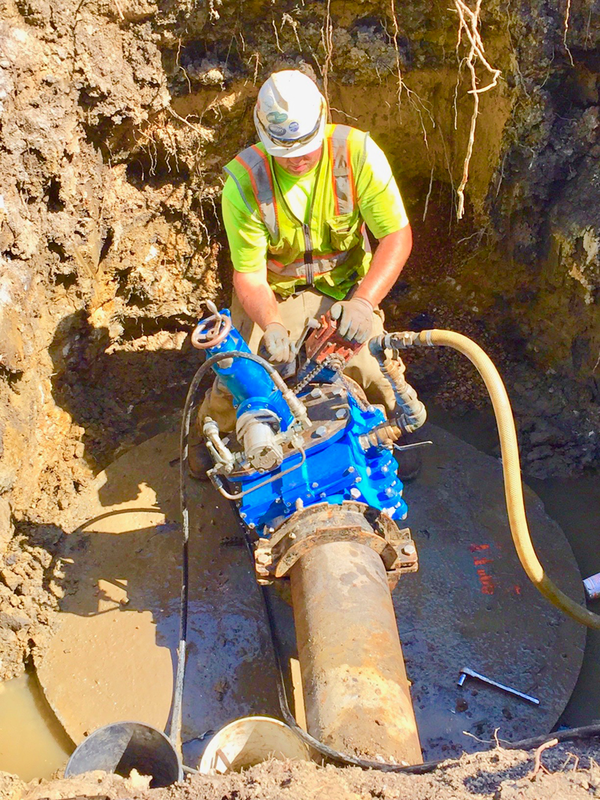 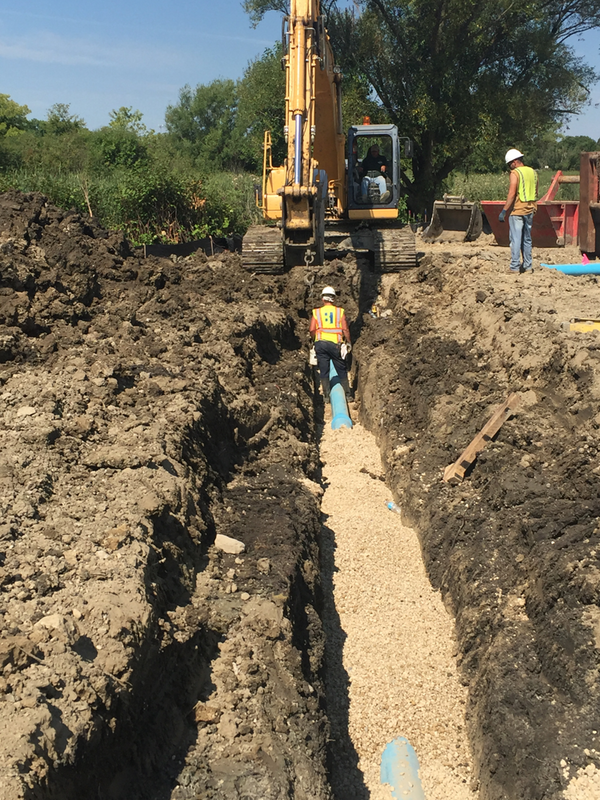 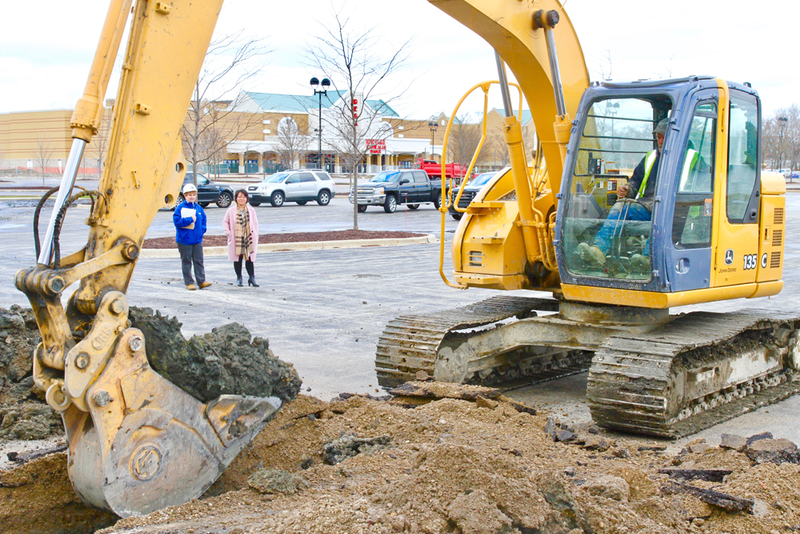 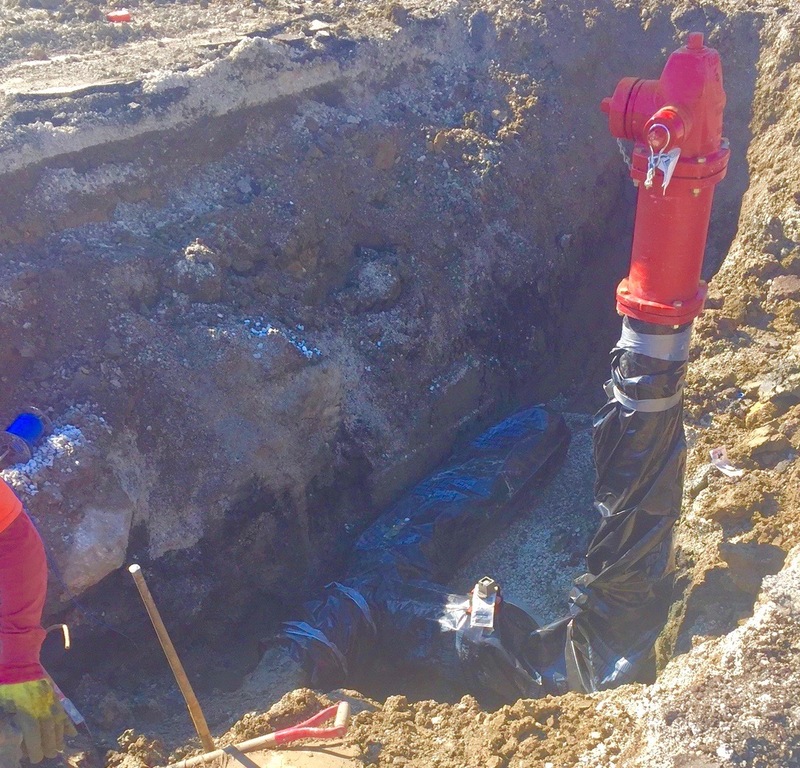 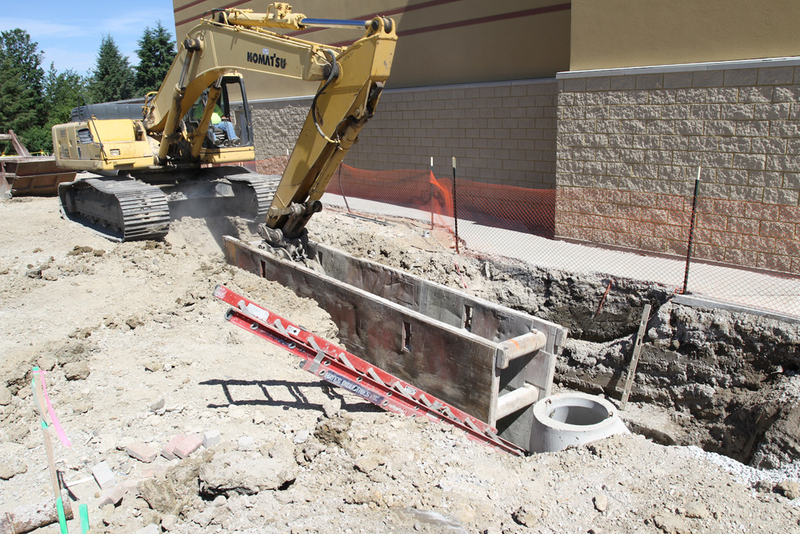 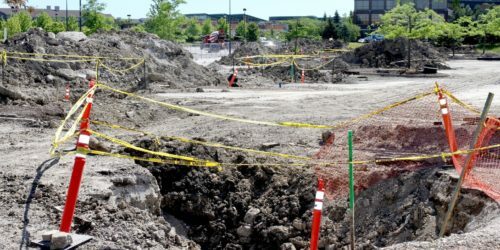 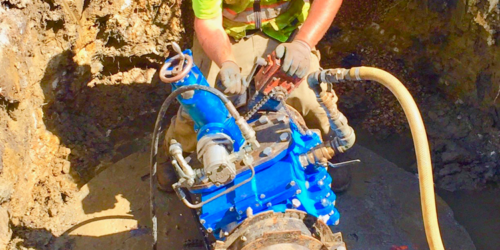 What you see in the photographs involves laying the water mains, fire hydrants, and other equipment involved in installing the water distribution for the new apartment community. 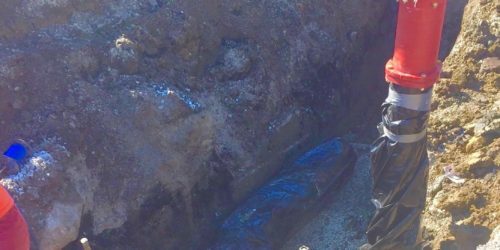 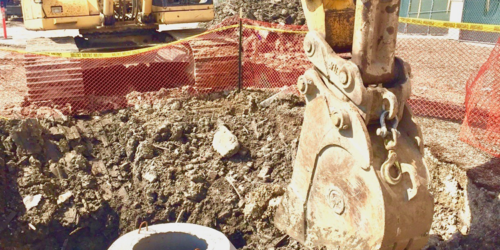 This work shown in the photographs involves digging new trenches around the site, laying new water mains piping, installing a series of new water main, shut off values, and also setting a new ring of fire hydrants. 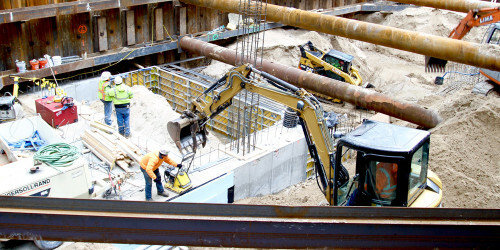 In addition to the entire new ring of water mains and public water supply system, there are photographs of the storm water collection piping being installed on-site, which is attached to storm basins and then, finally, all the new storm water basins are connected to the storm water detention pond, that is adjacent to the apartment site. 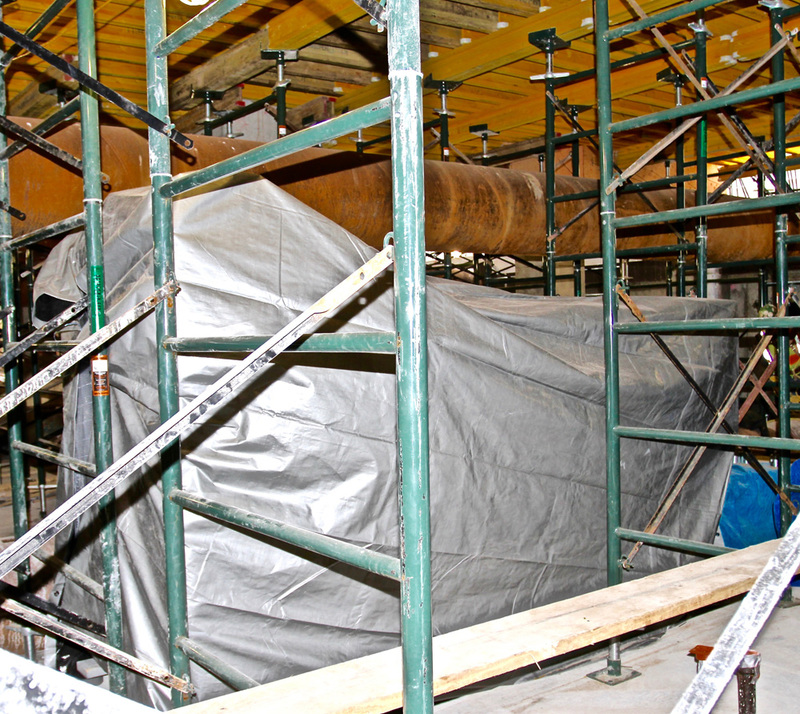 We will be posting many more photographs in the next several weeks of the continued progress with construction. 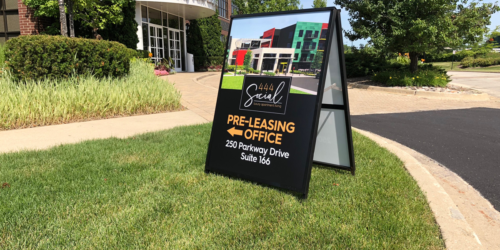 WE OPENED!! 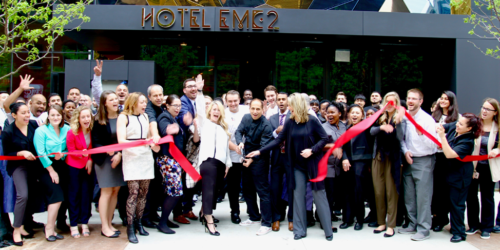 Lucky to have such a great team for opening day! 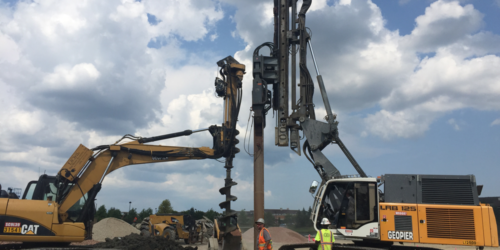 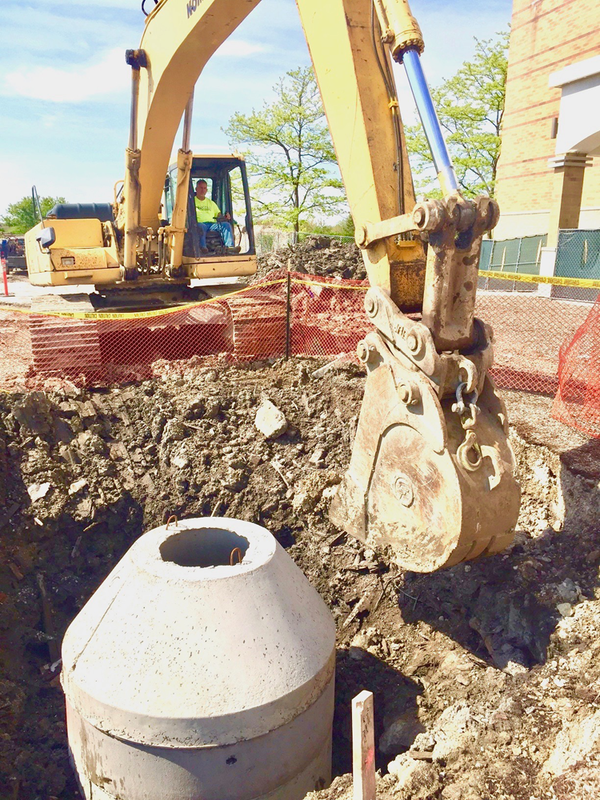 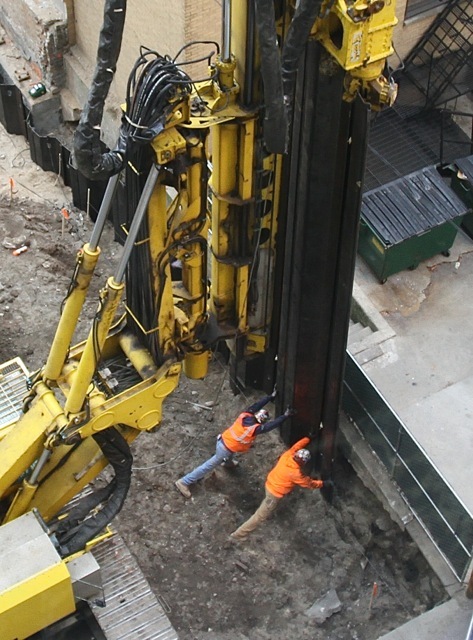 We were digging test pits in the areas at SMASH Residential that we will shortly start to install “Geo-Piers”, which is soil strengthening system, which will support the foundations for the apartment buildings. 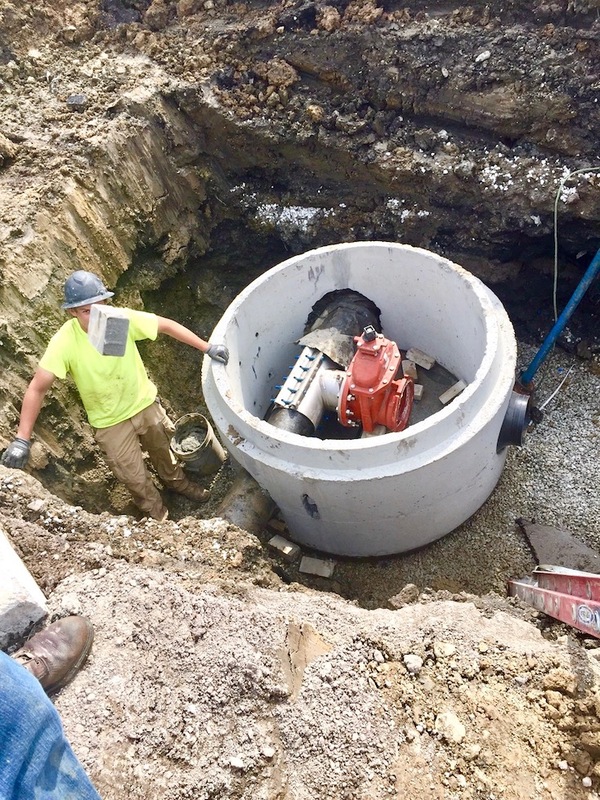 Representatives from “Geo-Piers” and our grounding engineering consultants where on hand to observe the outcome of these tests. 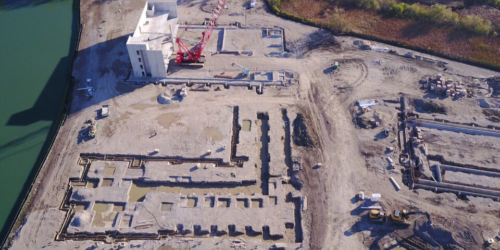 Activity on the SMASH Residential Construction site on December 7th includes, commencement pour foundations, reinforcement of concrete brick wall in preparation for new wall construction, and crushing broken site concrete. 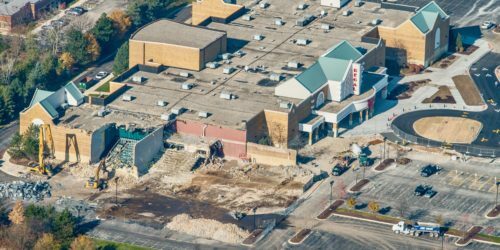 SMASH Residential area being physically separated from theater property. 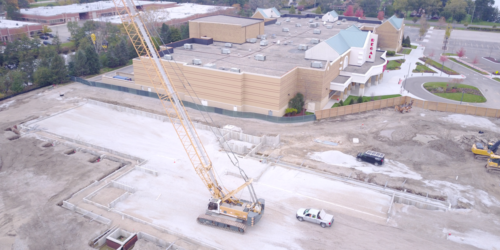 Demolition of south wing of theater to make toom for SMASH Residential buildings. 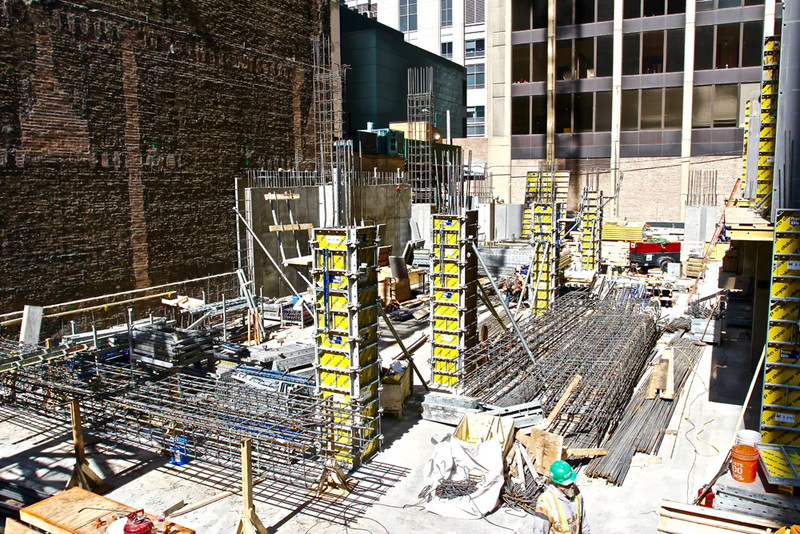 Construction progress is excellent at Hotel EMC2. 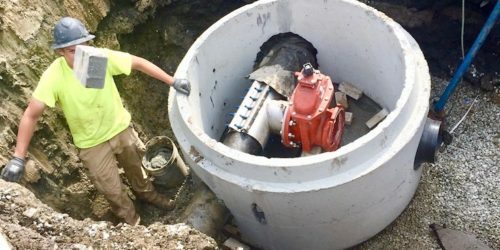 Right on schedule. 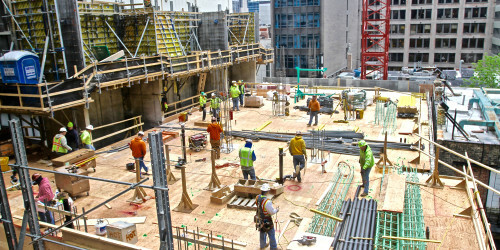 This week, we have completed pouring the roof of the mechanical penthouse of the building. 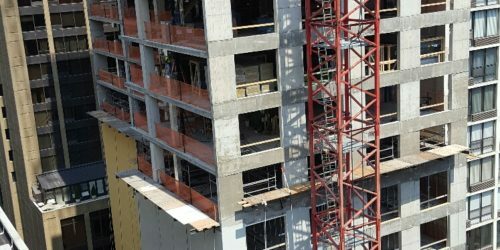 Eighty percent of the glass for the entire building has arrived for the window openings and it has been stocked on several floors for now. 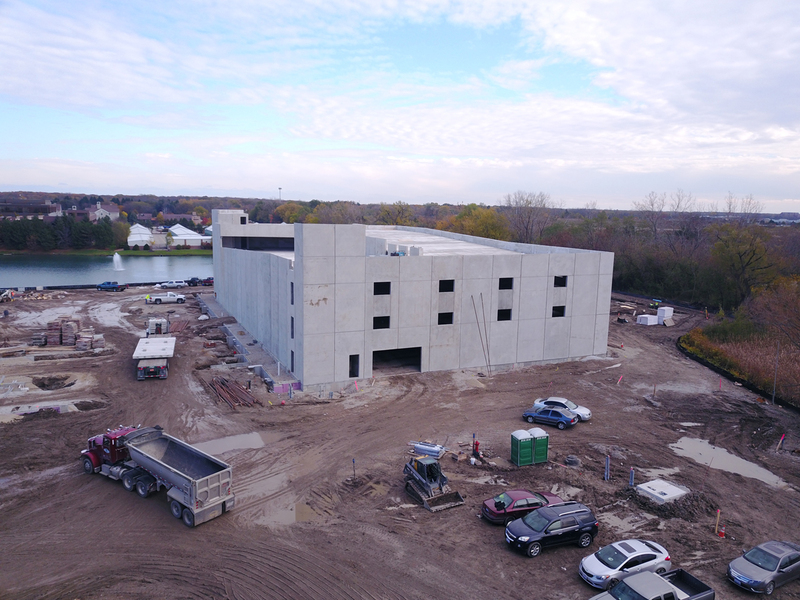 Rough in electrical, plumbing, HVAC is well underway in 14 flours of the building. 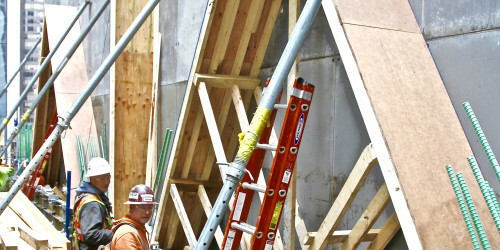 Window frames have started to be added to some of the openings in the buildings. 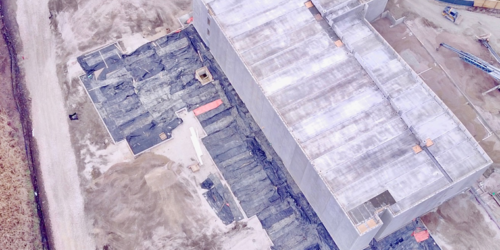 Also, non window openings to the building are being closed in. 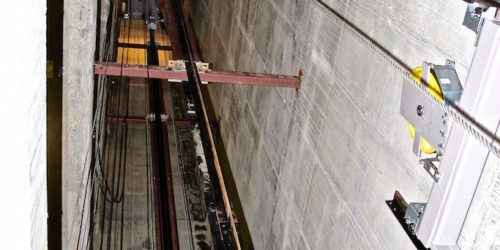 Elevator cabs have been constructed and are operating. 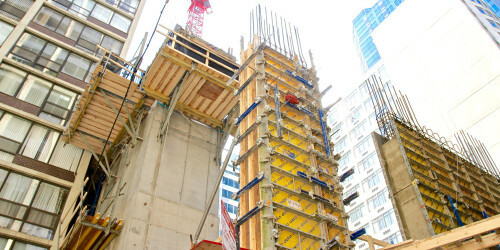 Elevator railings to carry the elevators have reached the 15th floor of the building. 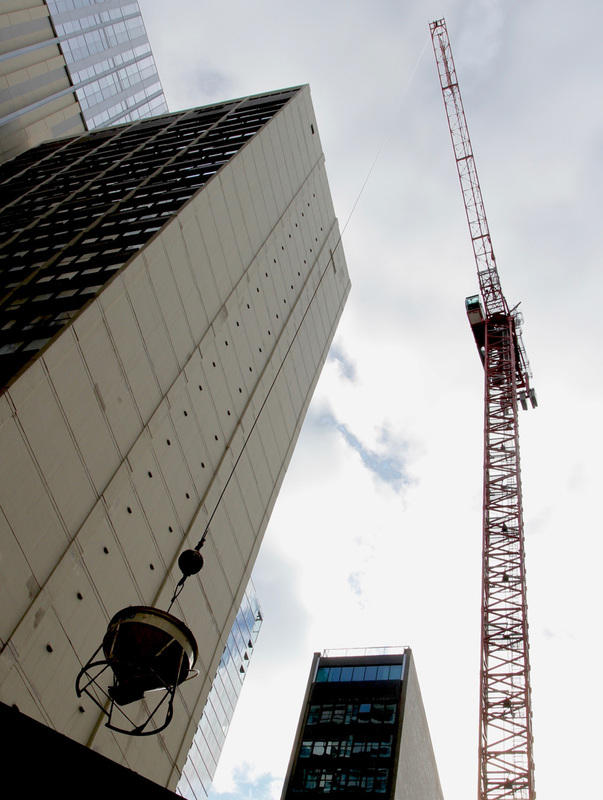 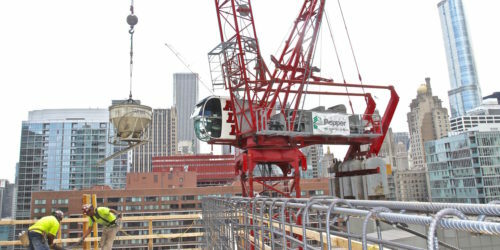 In a couple more weeks, the crain will be removed from the building. 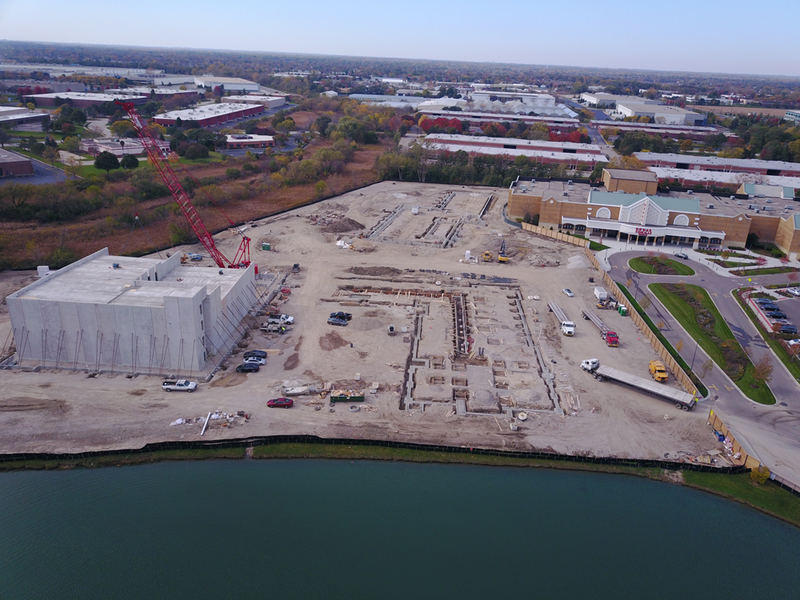 All indications are we are on track to open on schedule in April 2017 (or before). 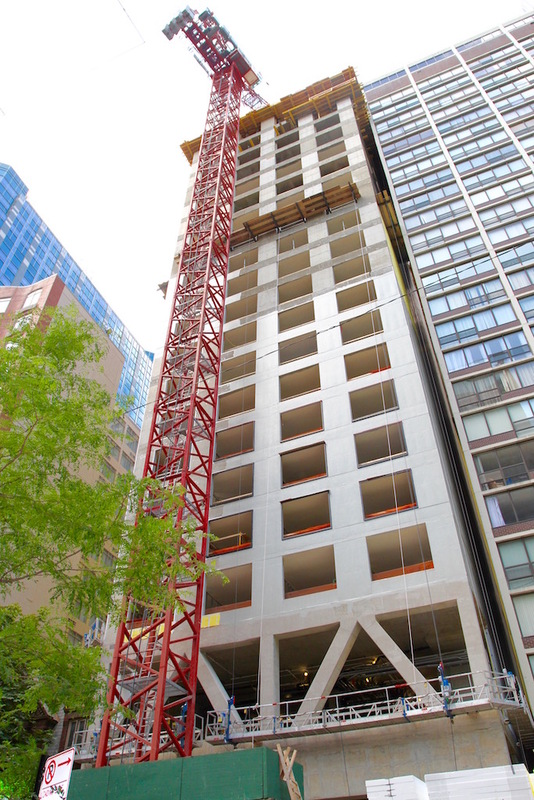 Photo Construction Update for Hotel EMC2 (Chicago Marriott Autograph). 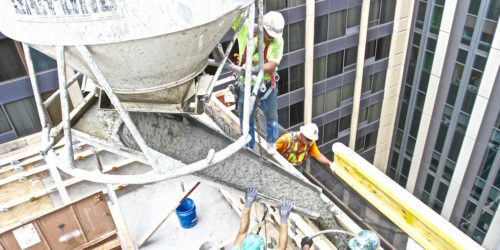 Pouring concrete on 18th floor of the building. 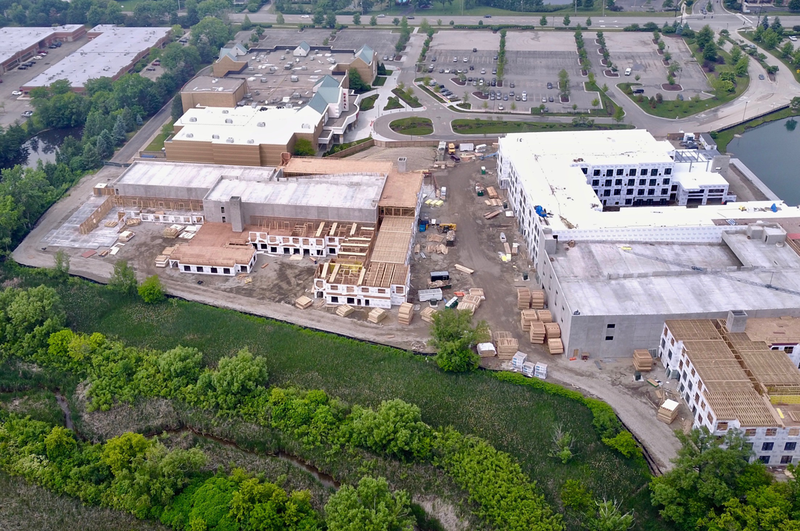 In a couple more weeks, we will be toped out. 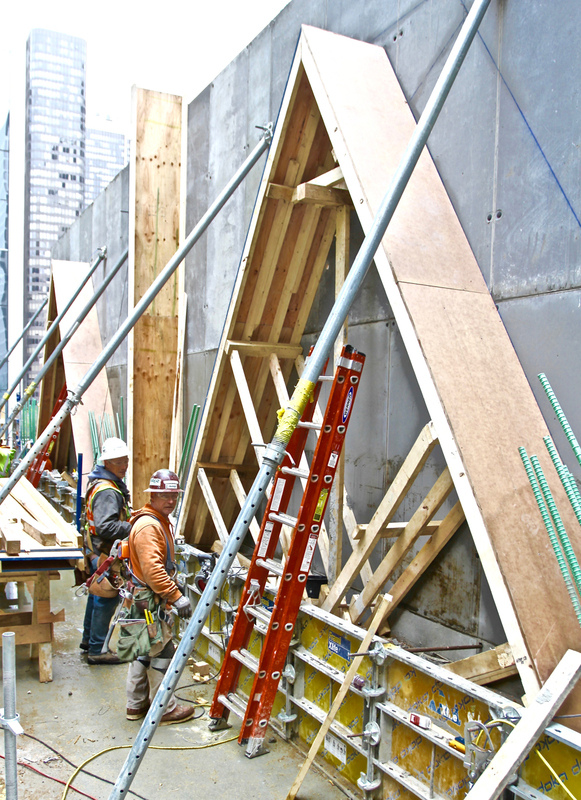 Room stud walls are being installed on first five residential floors. 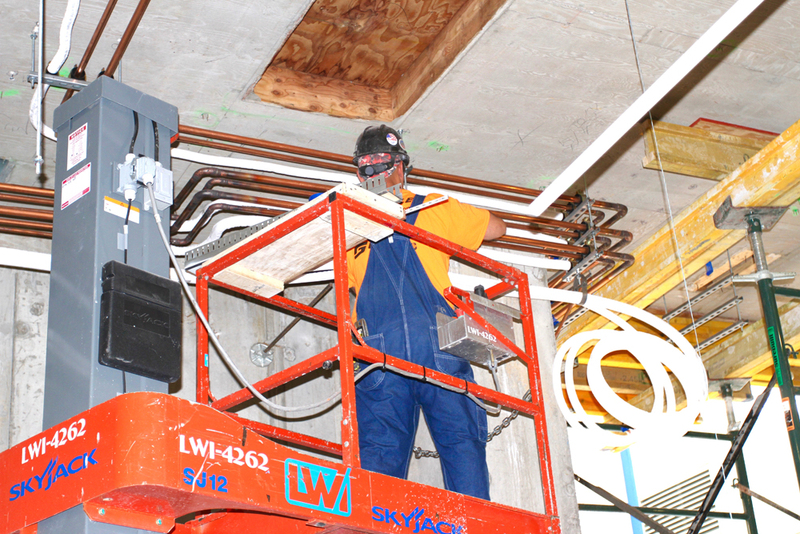 Main electrical, plumbing, HVAC work beginning on lower five floors of the building. 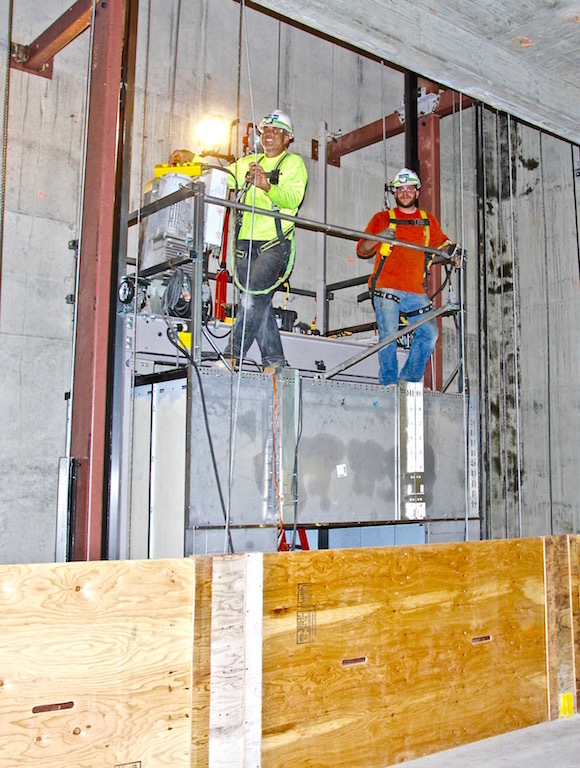 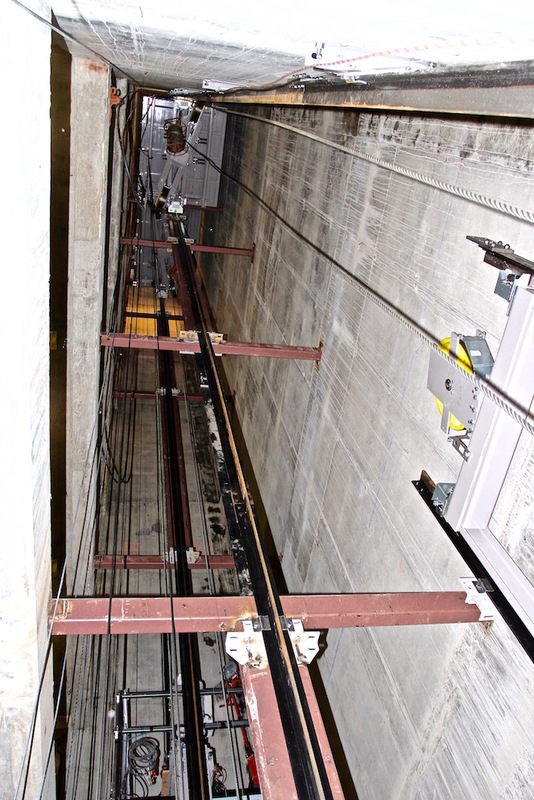 Elevator company installing rails to carry the elevator cabs. 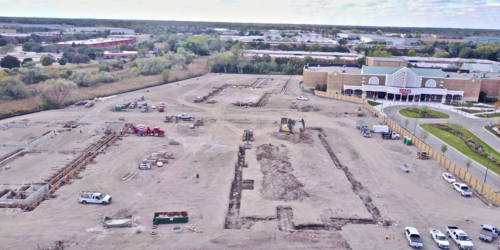 We are making outstanding progress with construction. 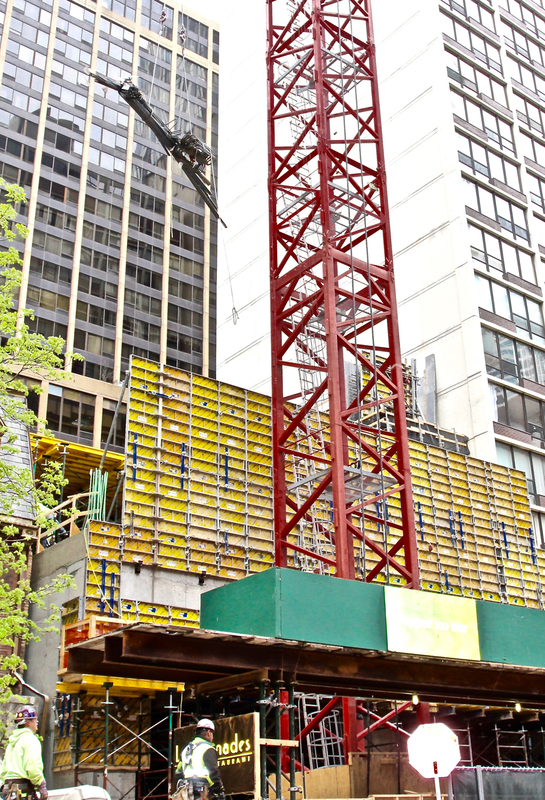 The building is flying up. 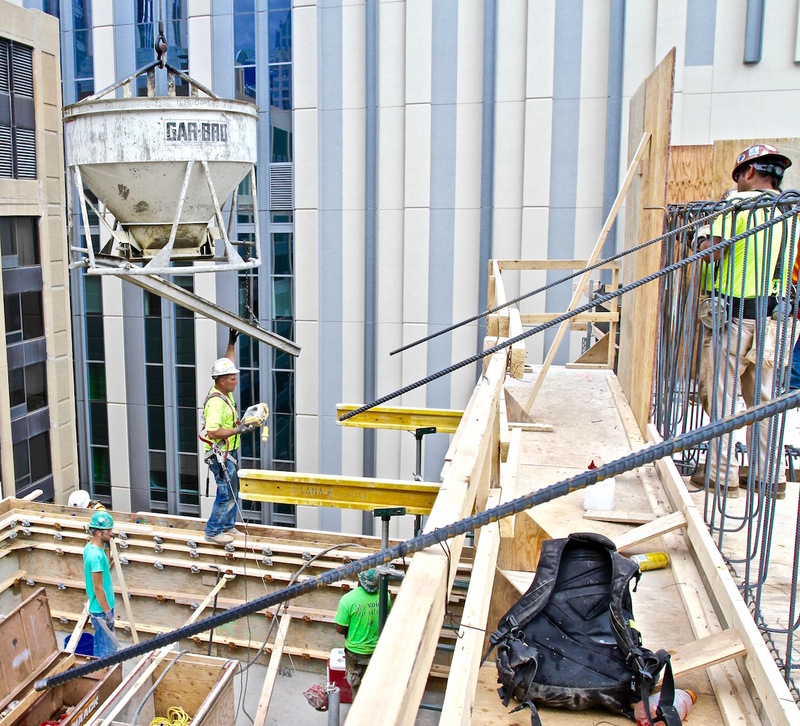 Last week, we begun forming the 10th floor of the hotel. 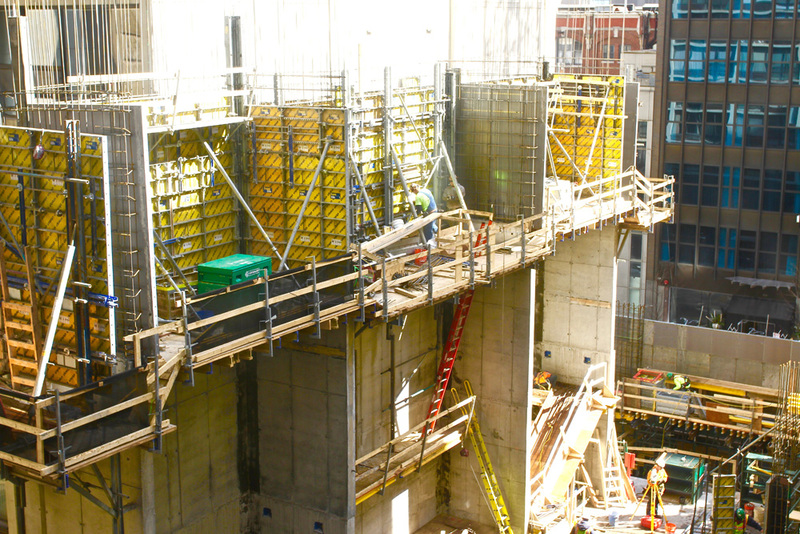 The elevator and stairwell walls are always being formed two floor ahead. 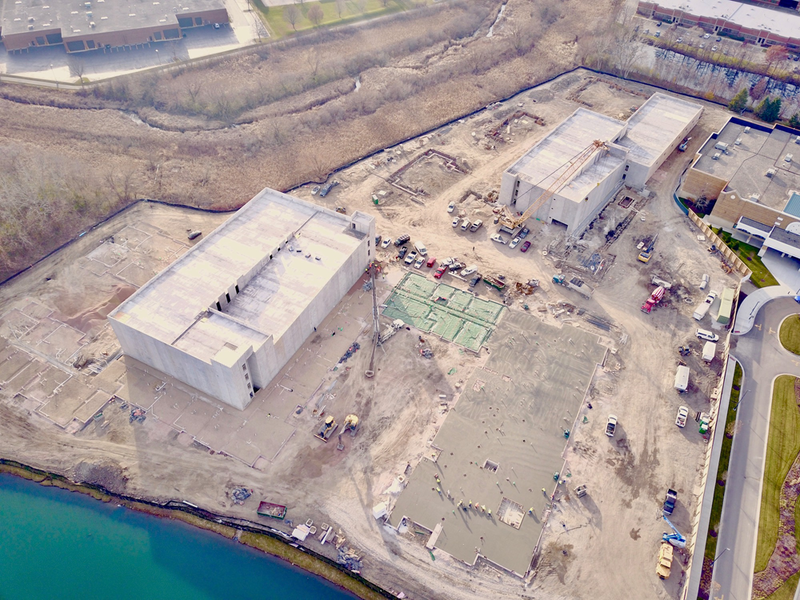 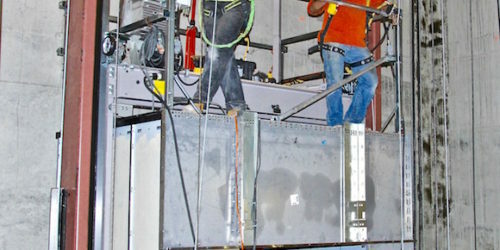 While not shown in the photos, permanent power raceways are being connected to Common Wealth Edison. 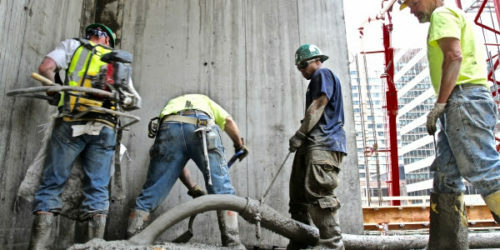 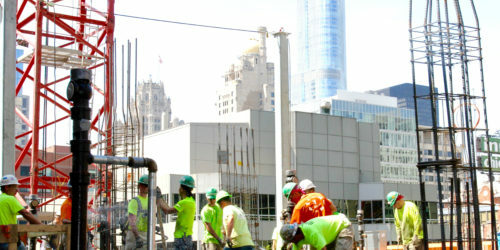 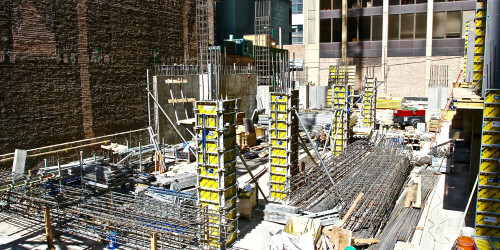 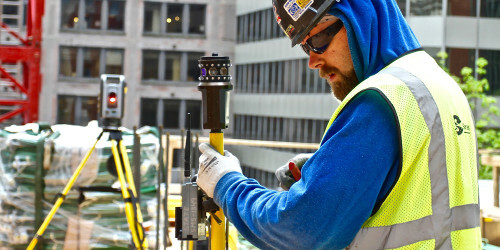 Here are some of the latest photos of construction of the Downtown Chicago Marriott Autograph project. 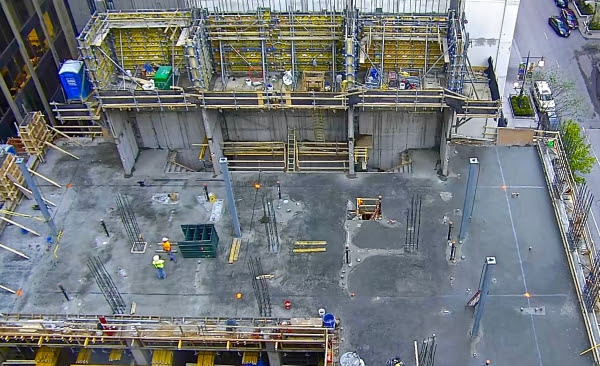 The first two photos found to the right is the wooden form that will be poured with concrete to create the diagonal concrete truss support which will hold up the exterior front wall of the building from floors six through 21. 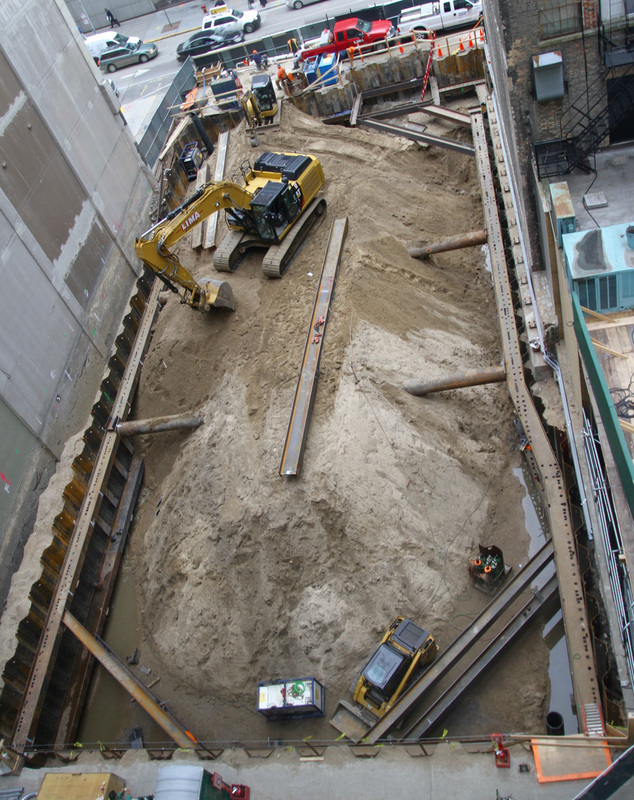 The rest of the attached photos are of the construction work that is taking place to construct the concrete form that will become the fourth floor of the hotel, once the concrete is poured. 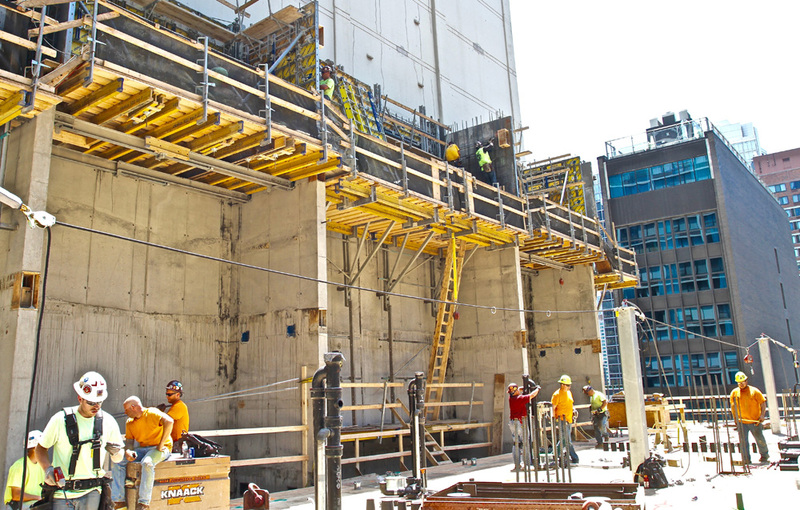 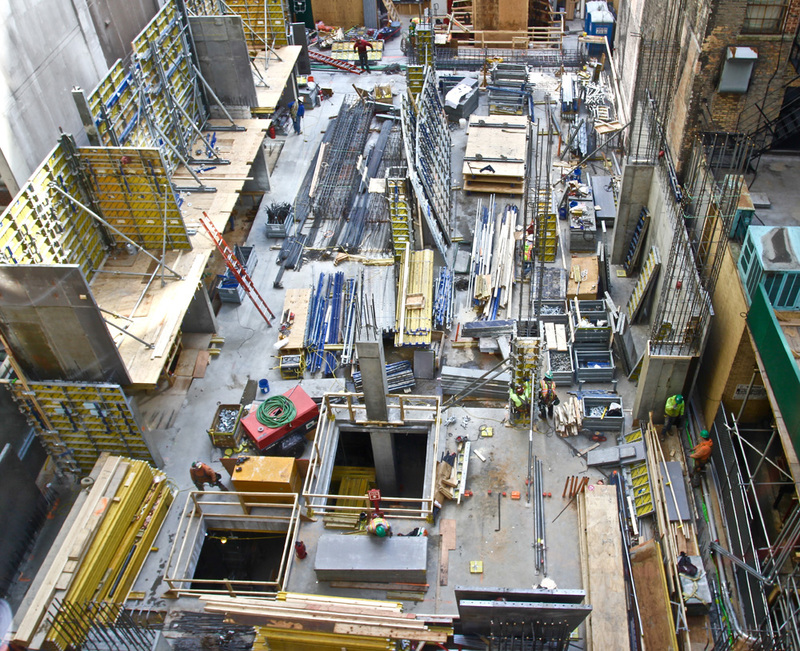 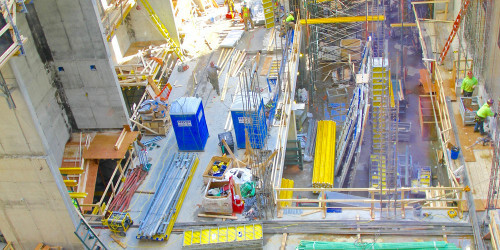 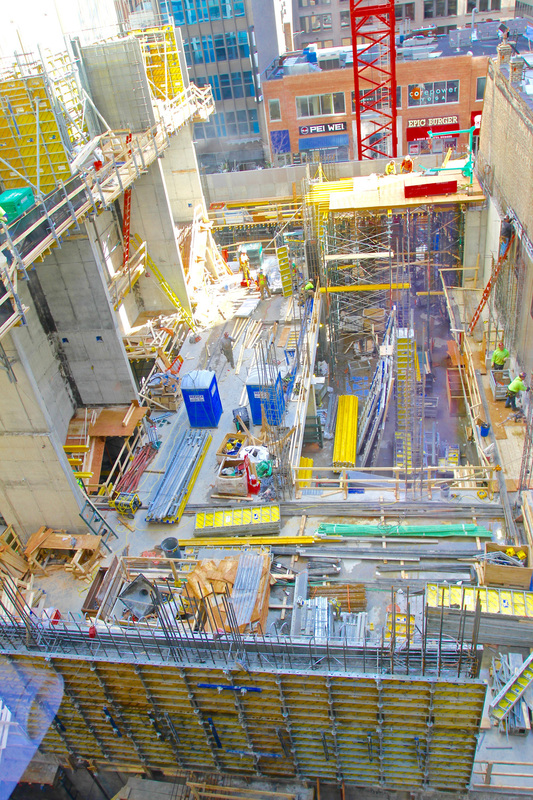 Notice in the attached photos that we are forming and pouring the walls, columns, elevator shafts, shear walls of parts of the third/fourth and even fifth floors all at the same time. 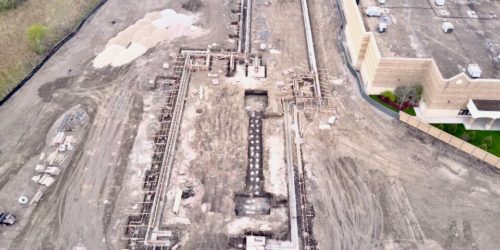 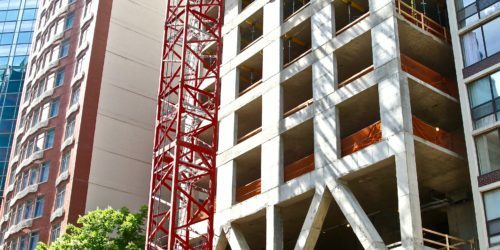 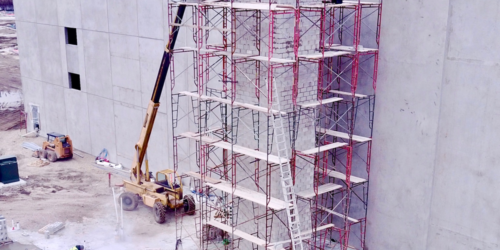 In the photographs, you see that the contractor has started creating the forms for the fourth floor of the hotel, while, at the same site they are forming the fifth floor elevator shafts and shear walls. 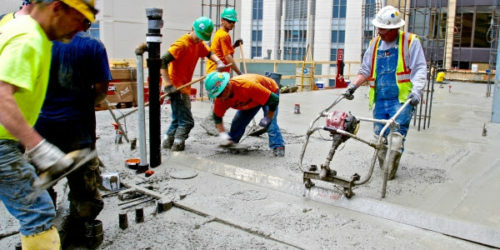 Since our last photo update, the first concrete floor has been poured. 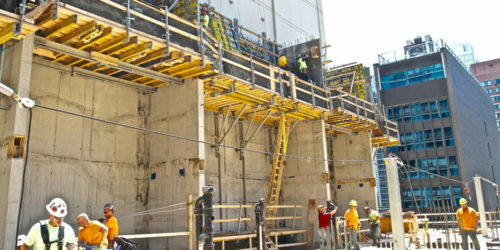 The Contractor is well along with forming and pouring the exterior concrete first floor walls. 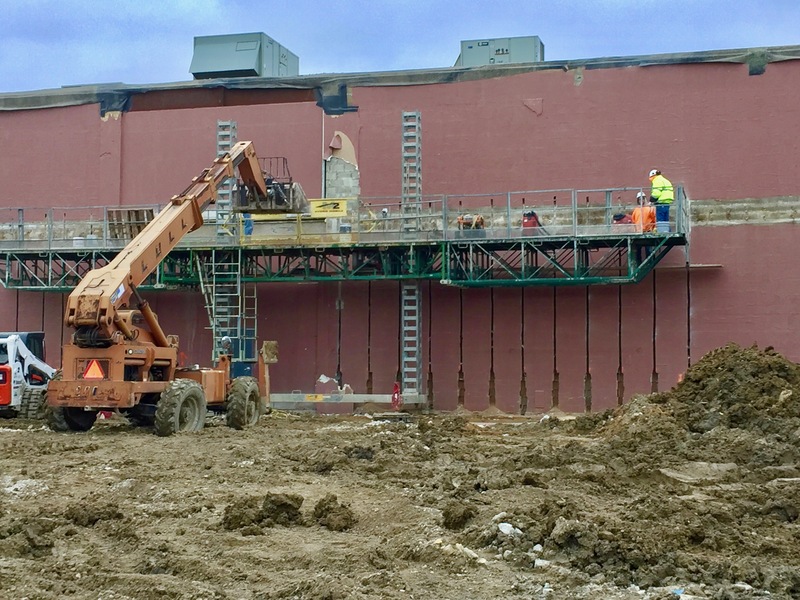 Also, the Contractor is shown constructing the vertical columns that will eventually support the second and third floor of the building. 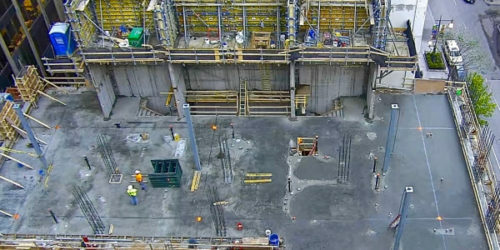 On the left hand side of the first photo, you can see the concrete “Shear Walls” being formed and built. 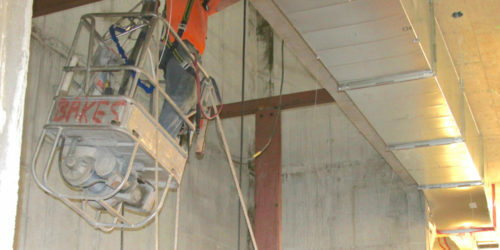 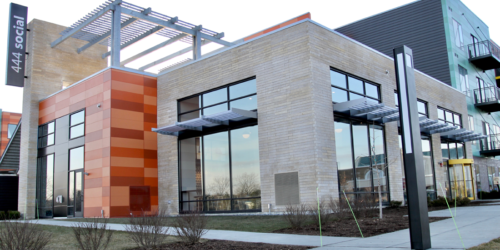 These “Shear Walls” are vertical concrete walls that extend from the basement to top of the building. 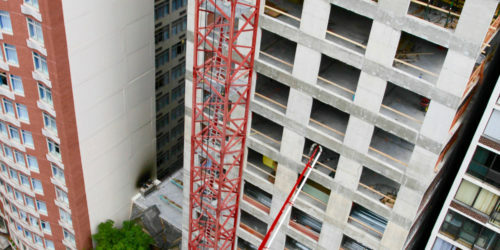 “Shear Walls” are needed in the building to resist forces like wind that would otherwise cause the 21 story building to sway. 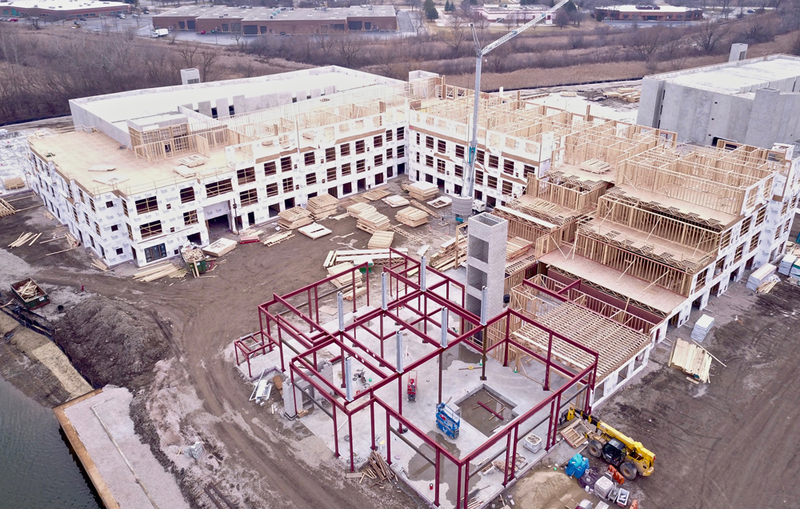 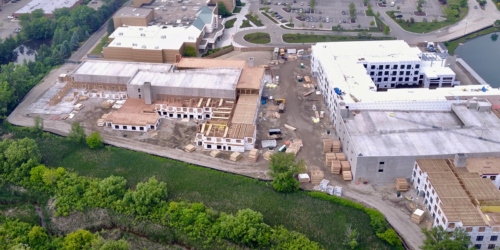 Since the basement concrete and columns are complete in the Marriott Autograph Hotel, you can see the wood form is being built that creates the surface over which the the first floor concrete will be poured next week. 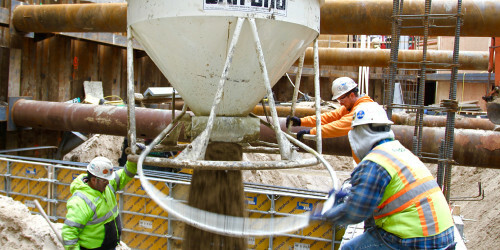 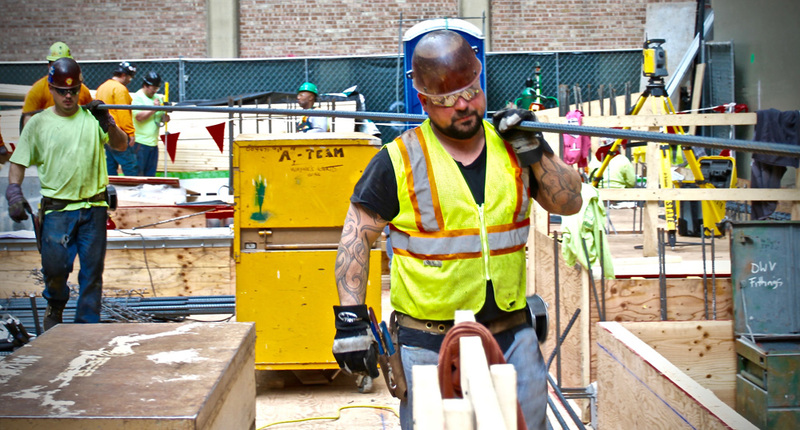 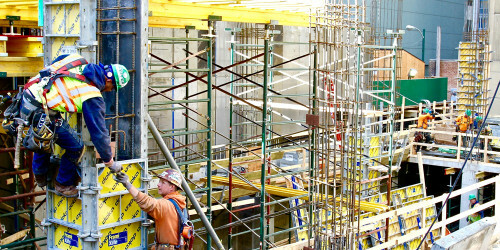 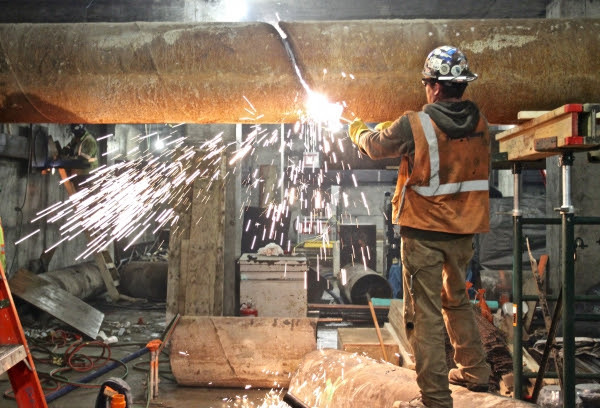 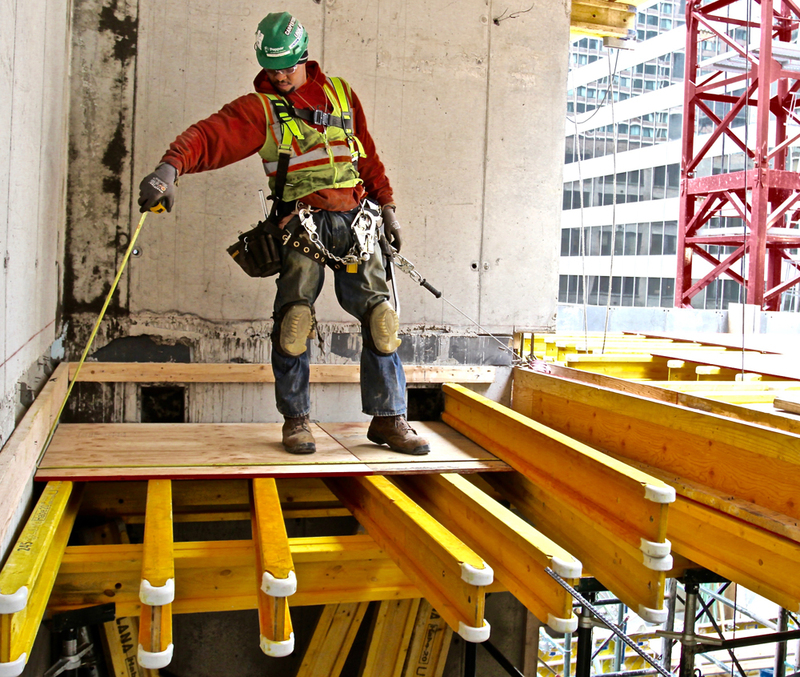 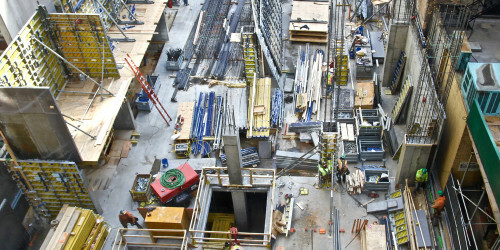 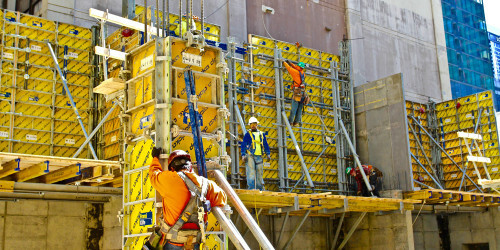 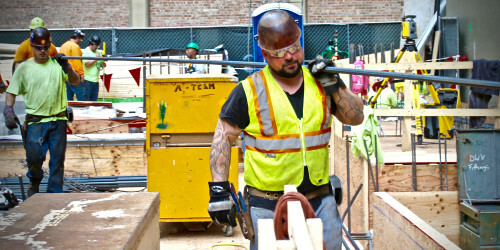 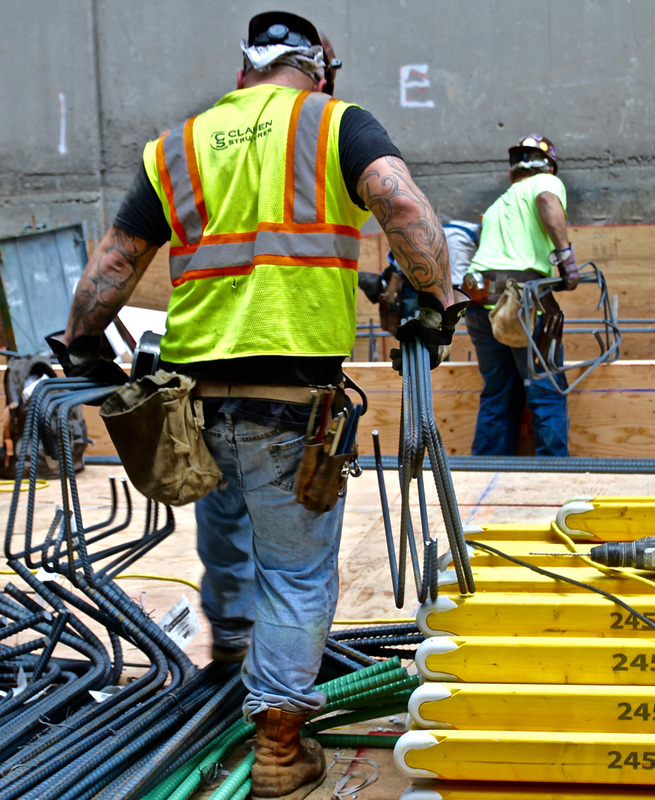 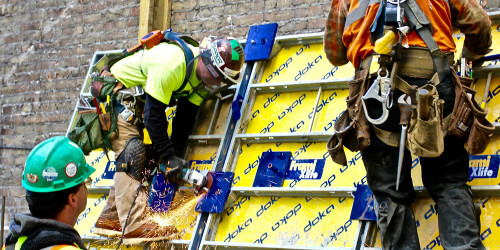 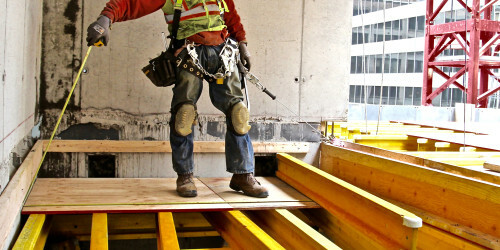 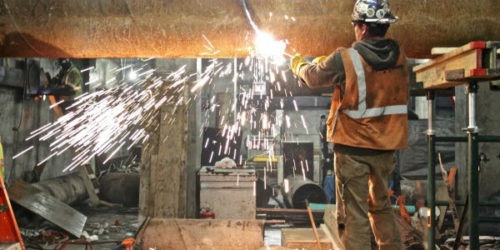 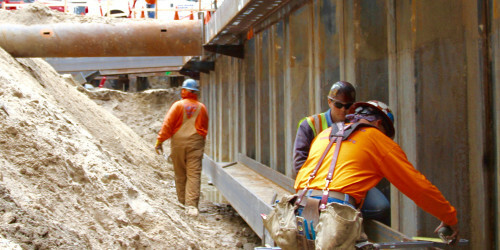 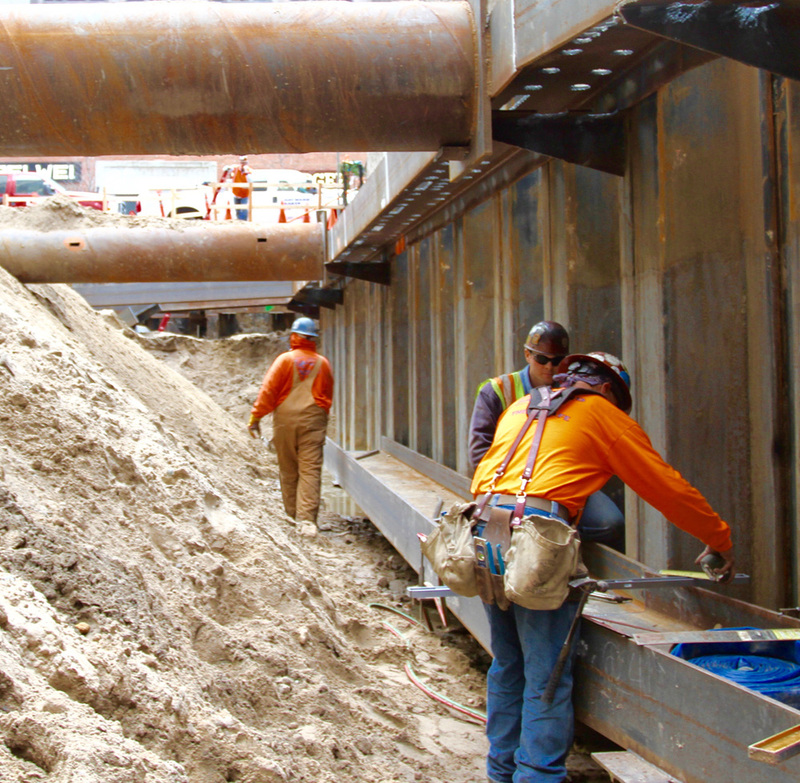 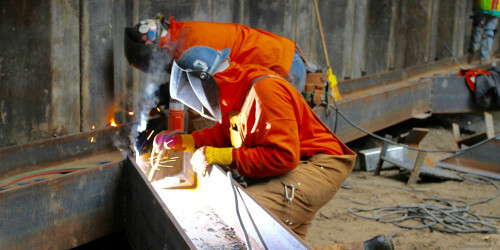 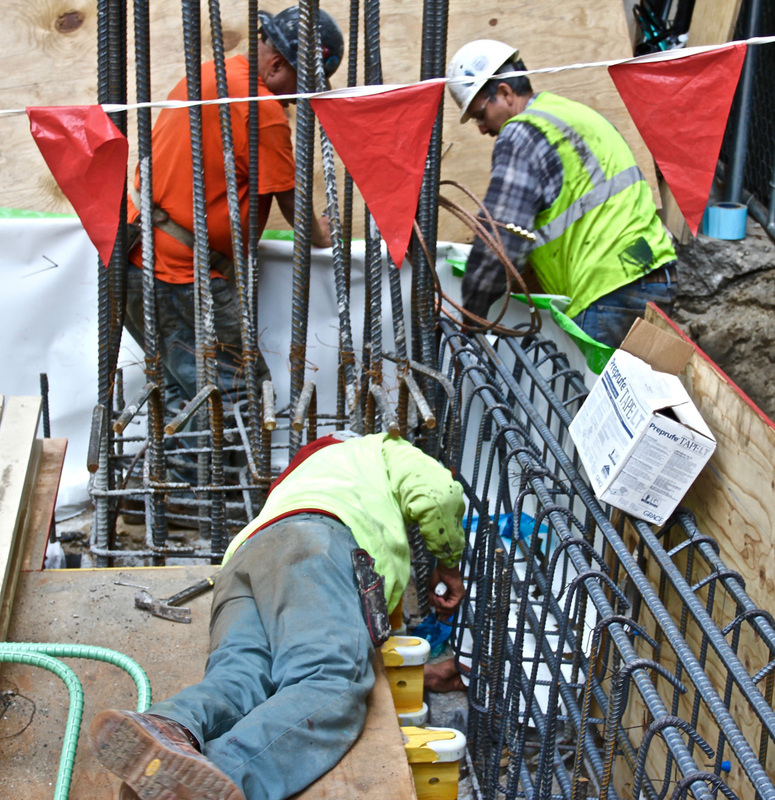 Workers are shown building the steel rebar lattice which is eventually encased inside the concrete beams and floor of the first floor of the building. 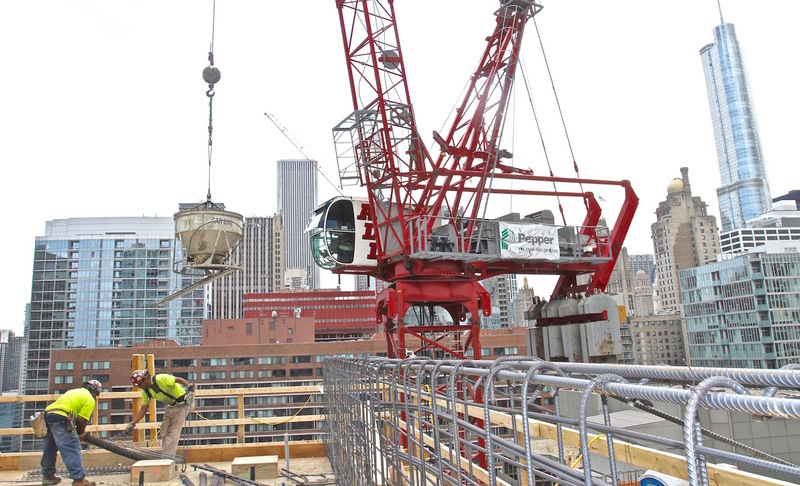 Also, there is a picture of the large backup generator that was already lowered into its final location in the basement of the building. 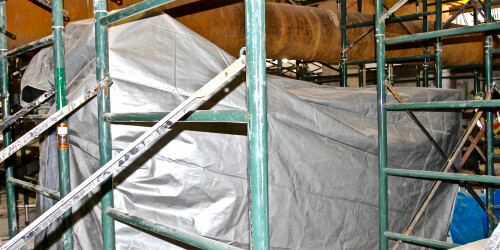 To protect the generator until it will eventually be connected to the building’s electrical, heavy plastic is covering the machine. 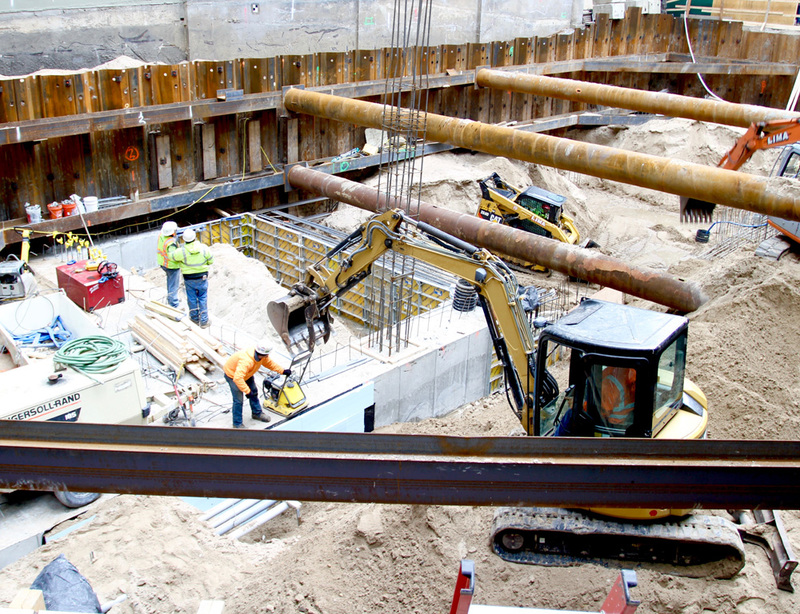 In the photos, you can see the progress with the construction of the large concrete grade beams that have been built. 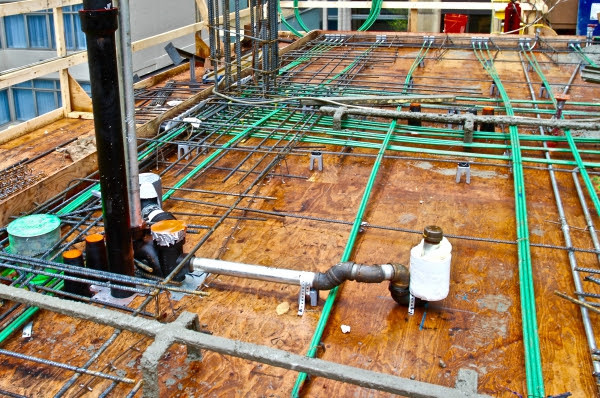 The concrete and steal grade beams structurally tie together the deep foundations below the surface. 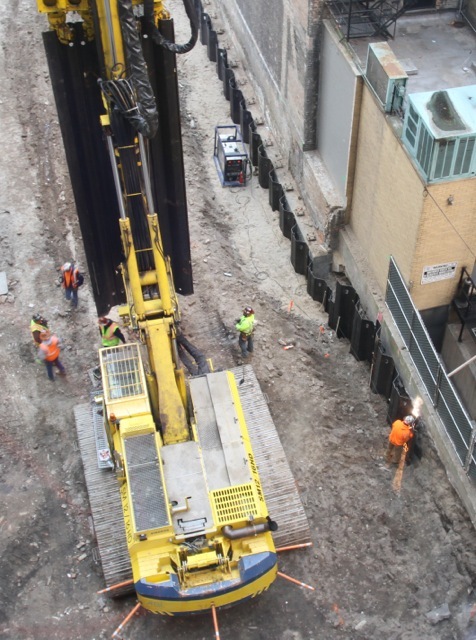 These photos are take from minus 20 feet below grade for the hotel. 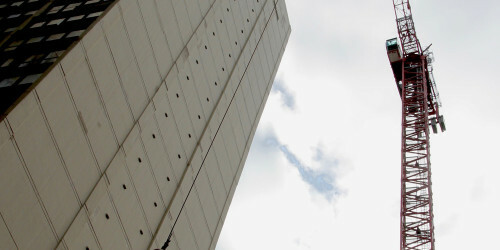 We have reached the bottom of the escalation at this level. 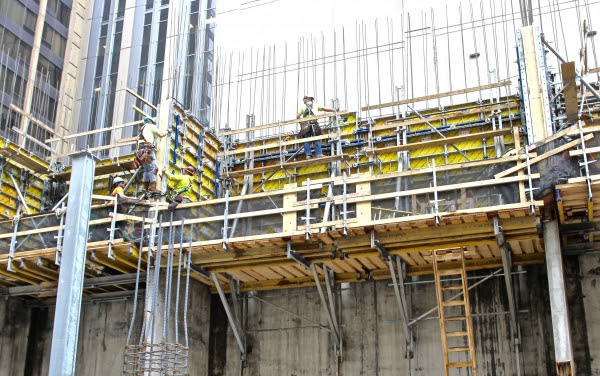 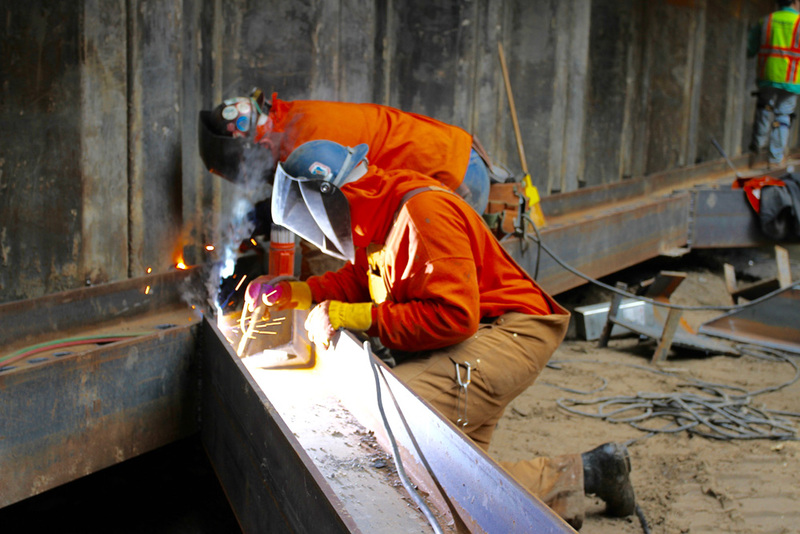 Step by step, the iron workers in the picture are completing the construction of the two level steel bracing system that holds the steel sheeting into place. 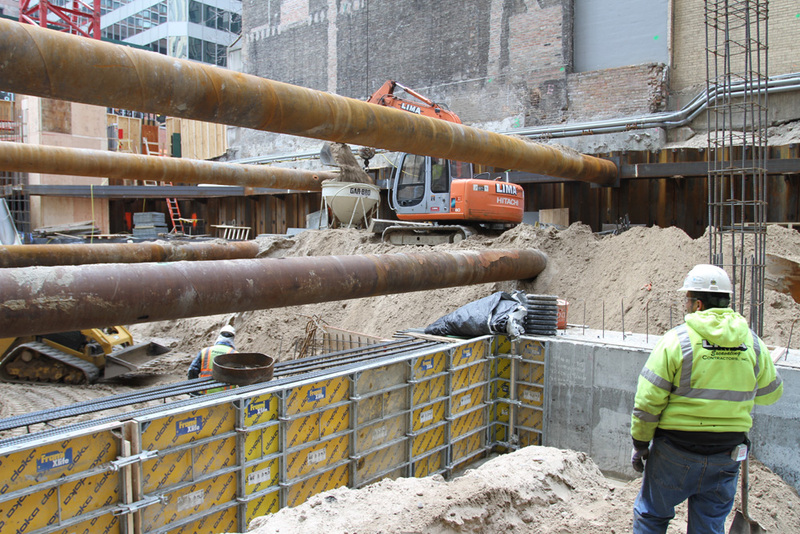 Today, I thought I would share some of today’s smooth progress on the basement sheeting operation at our Downtown Marriott Autograph Hotel. 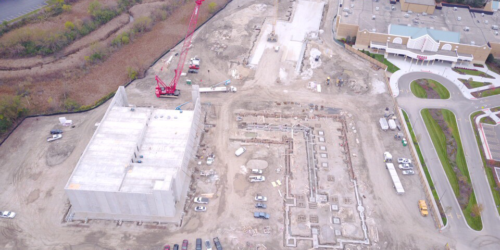 Please find below a few pictures from this phase of construction. 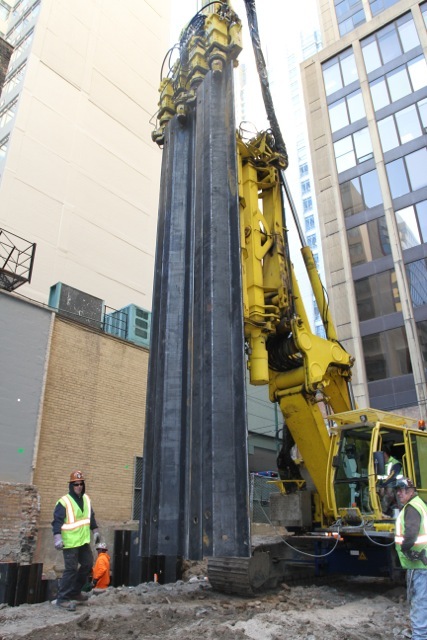 The equipment and manpower seen in these pictures is pushing 21 foot tall sheets of metal deep into the ground at the perimeter property line. 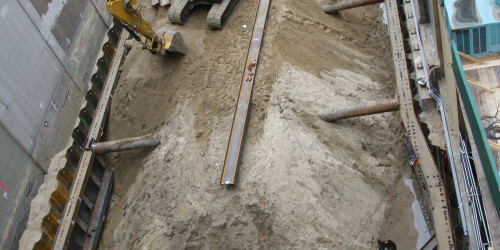 The purpose of this operation is to build an underground metal ring wall. 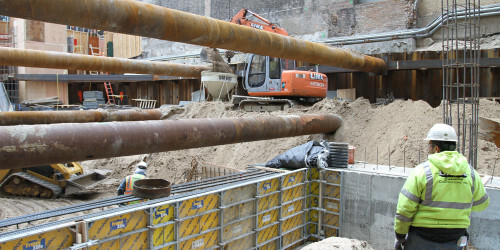 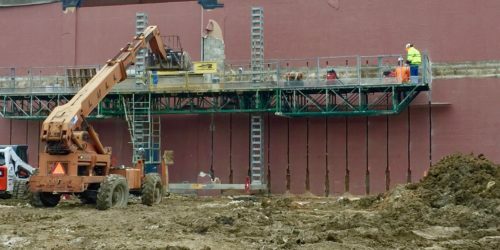 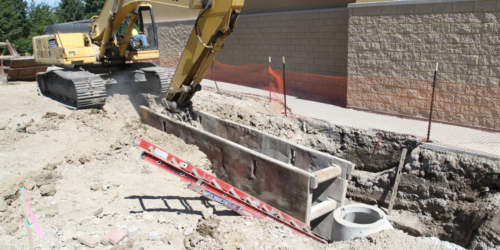 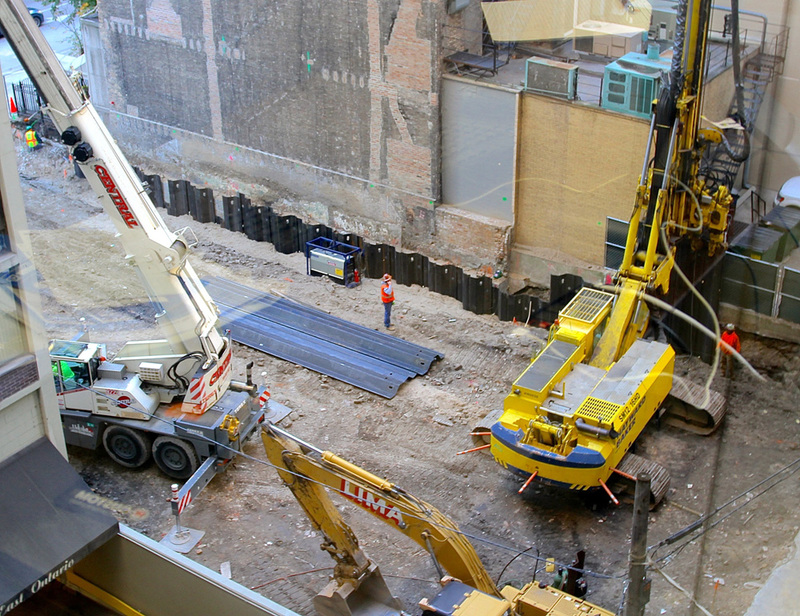 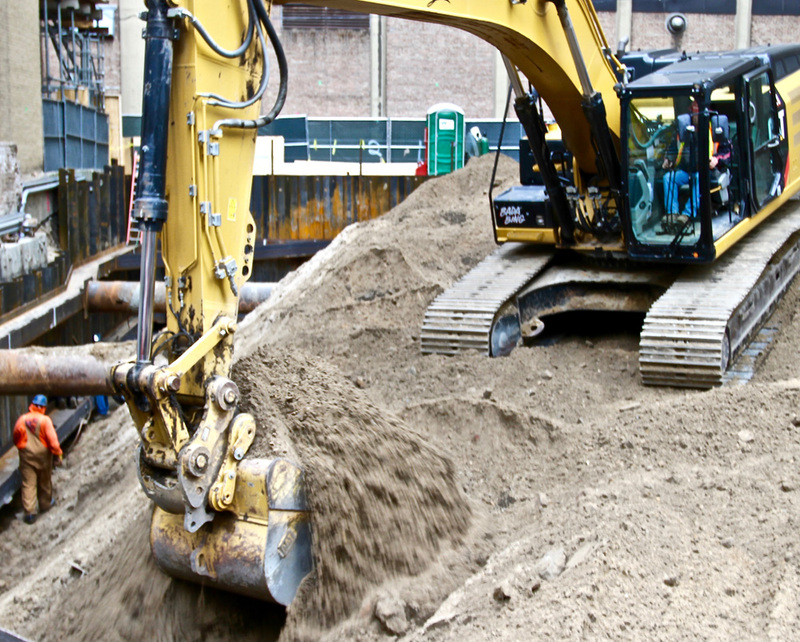 Once the underground metal sheets are in place, the contractor can safely remove 21 feet of dirt from what will become the basement of the building without the risk having the exterior walls cave in. 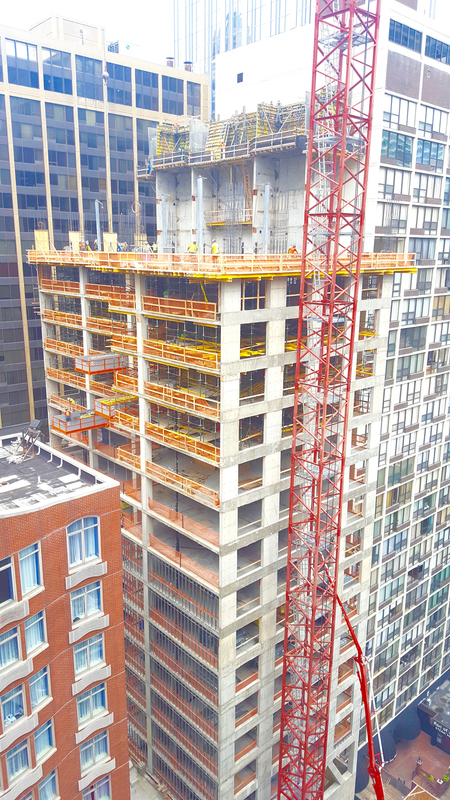 5/12/2016 Construction Update Photos of Chicago Marriott Autograph Hotel. 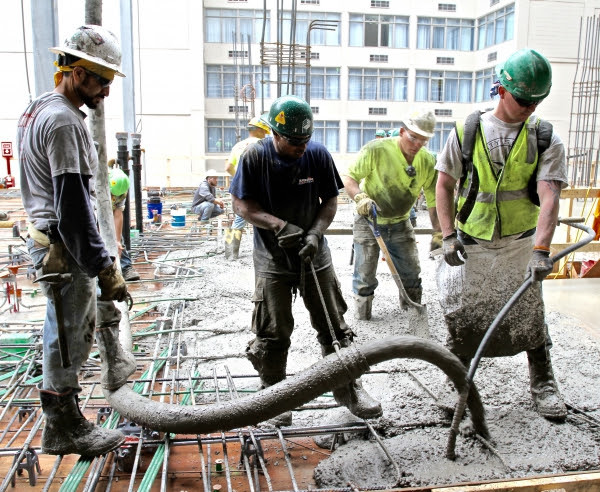 Today, we poured concrete on fifth floor. 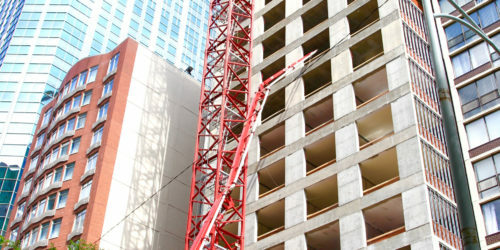 The contractor expects to complete another floor every three days. 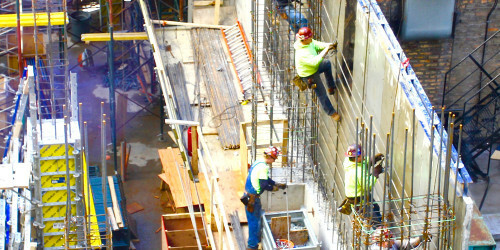 We are schedule to hit floor 22 by the end of July. 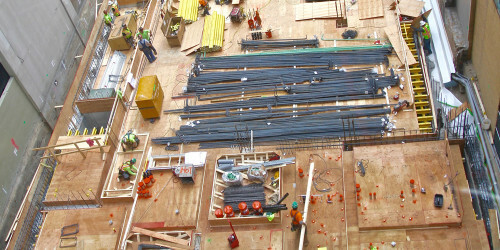 Seen in the fifth floor form are the post tension steal cables that are used to strengthen the concrete slab. 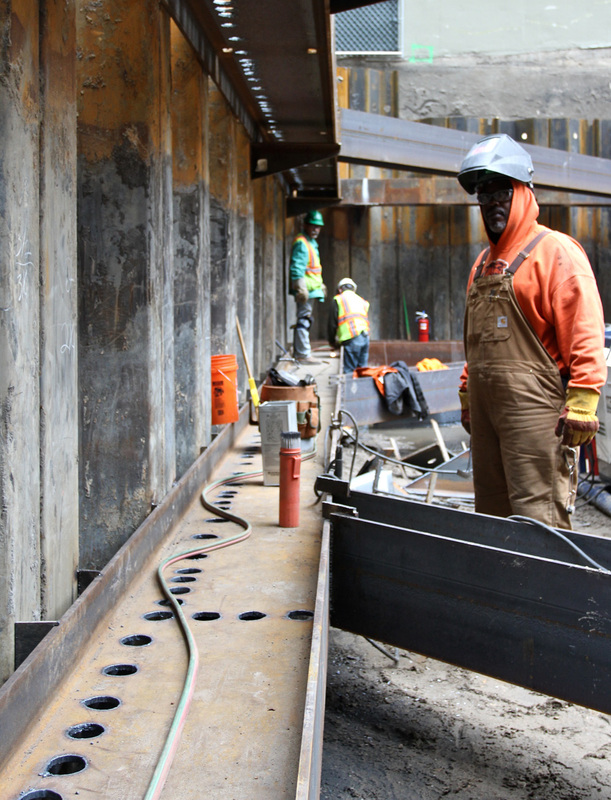 Photos in the basement show welders removing the steal bracing that was used for the earth retention when the basement was being constructed.